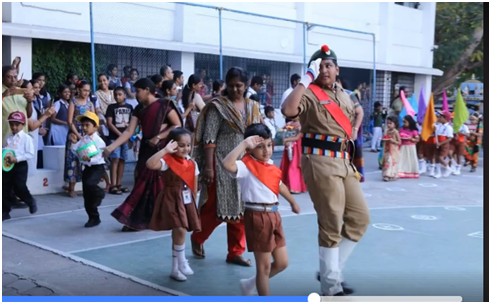 Republic day was celebrated with pride and patriotism at Chinmaya Vidyalaya Annanagar on 26th January 2019. Our correspondent Sri. 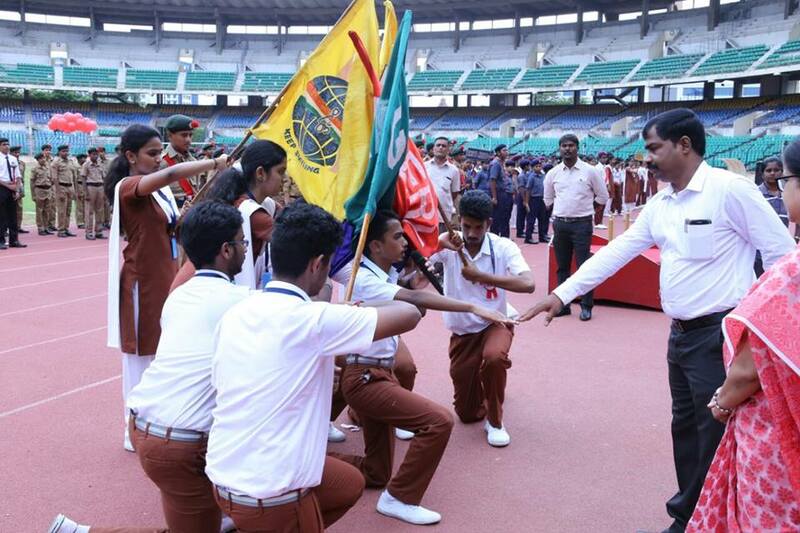 R Surya kumar unfurled the national flag. 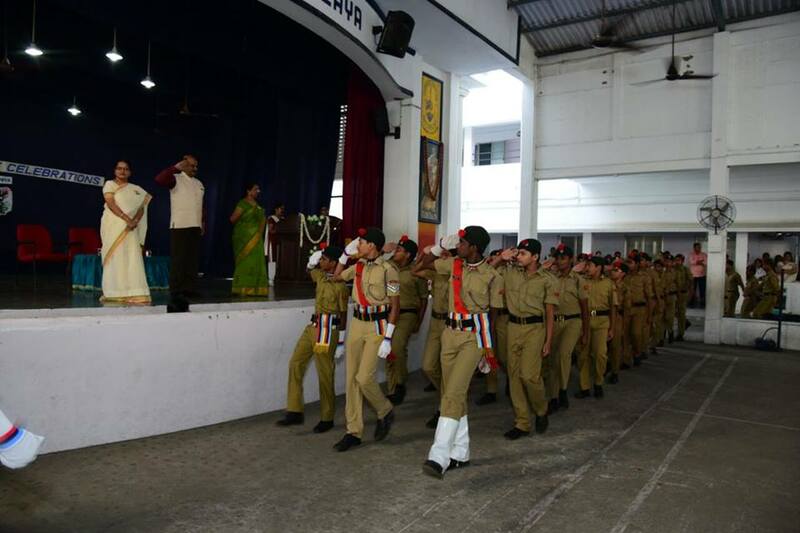 This was followed by our flag song in Tamil. 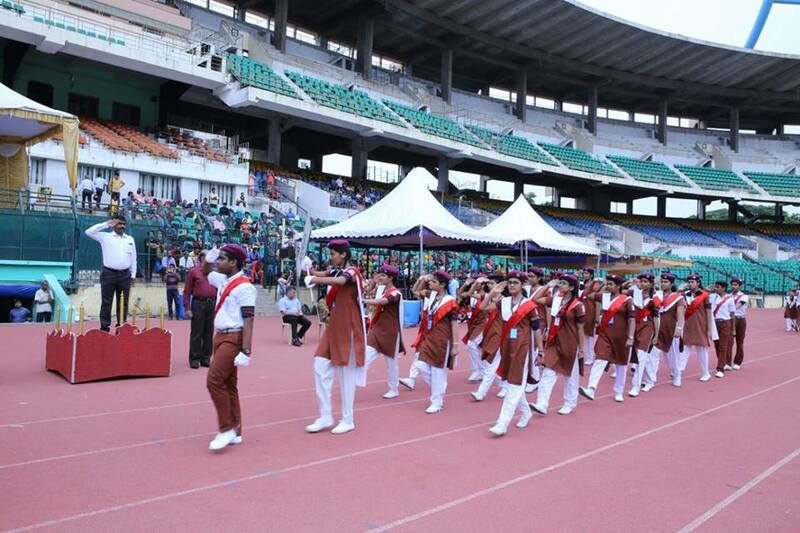 A grand parade was showcased by the four different houses, NCC, Scouts and guides. The correspondent was the chief guest and he addressed the gathering. 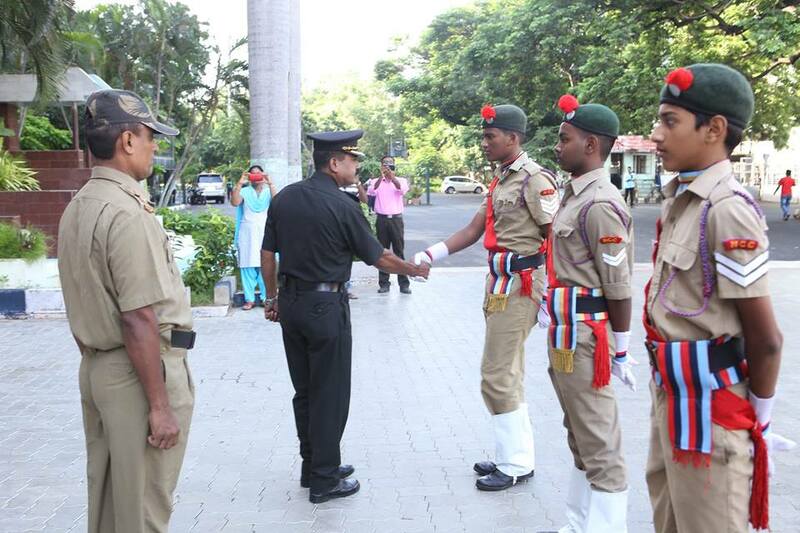 He emphasized the need for discipline and moral values in life. 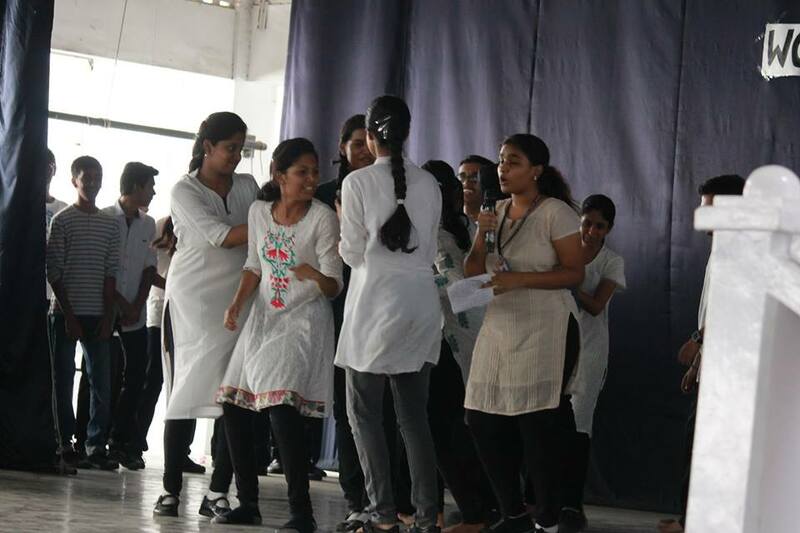 Sports day prizes were distributed for the classes I, II and III. 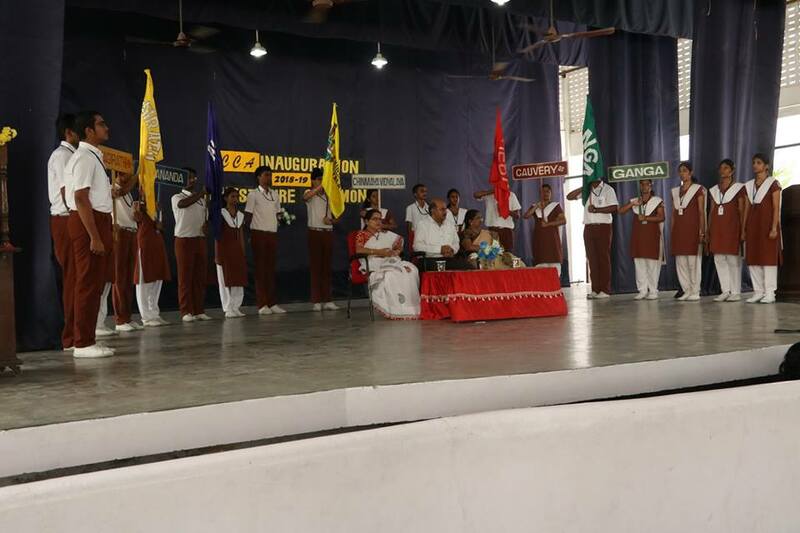 Social science department put up a grand Program on the life of national leaders and their freedom movement. 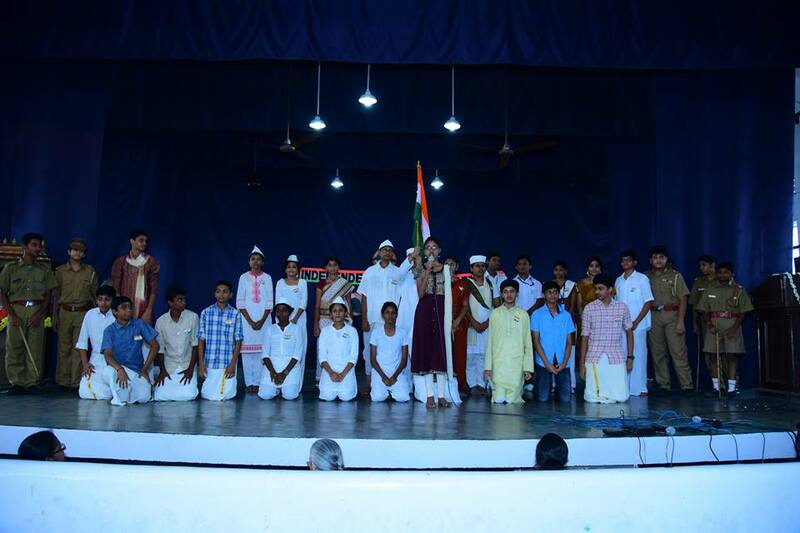 Other cultural items included patriotic songs and speeches. The function ended with our national anthem. 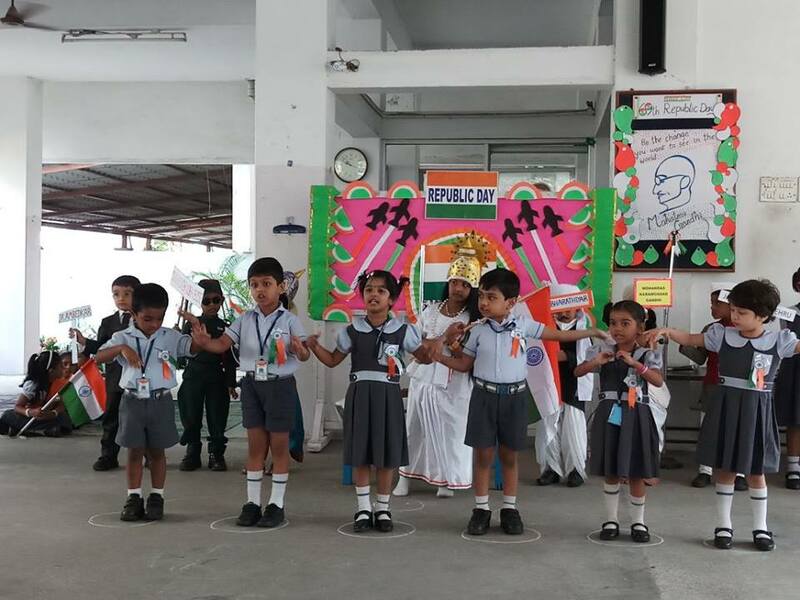 The students and teachers enjoyed the Republic day with great enthusiasm. 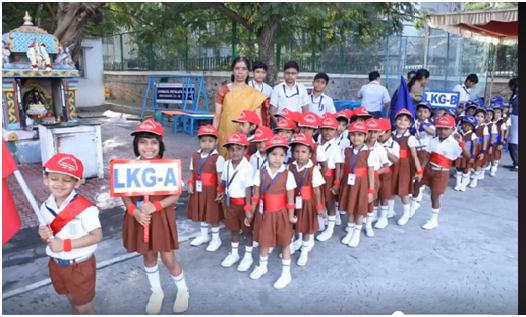 The 29th Kindergarten sports meet was held on Saturday, the 2nd February 2019. 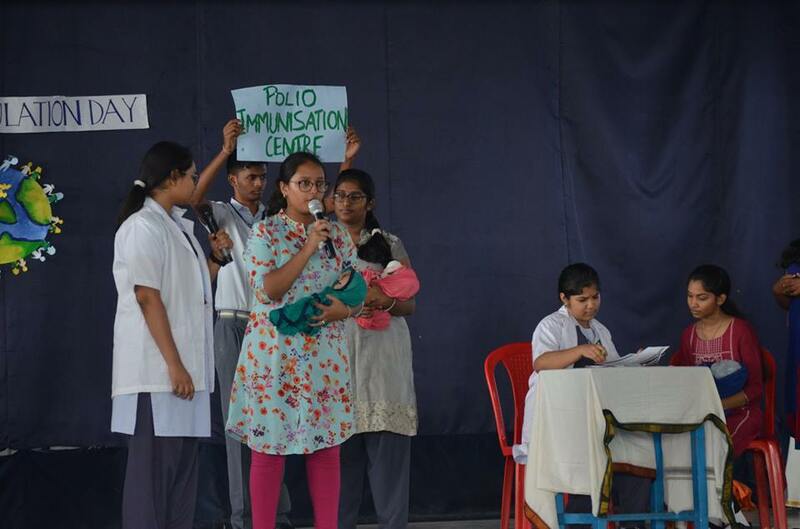 The Chief guest Smt. 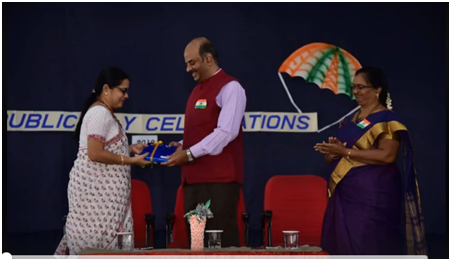 Radhika Kannan (Primary Incharge, Chinmaya Vidyalaya, Taylors Road), declared the sports meet open by releasing the balloons, which soared up in the sky signifying the heights achieved by the children, the chief guest insisted the Parents to give importance for Physical activities instead of playing with gadgets. 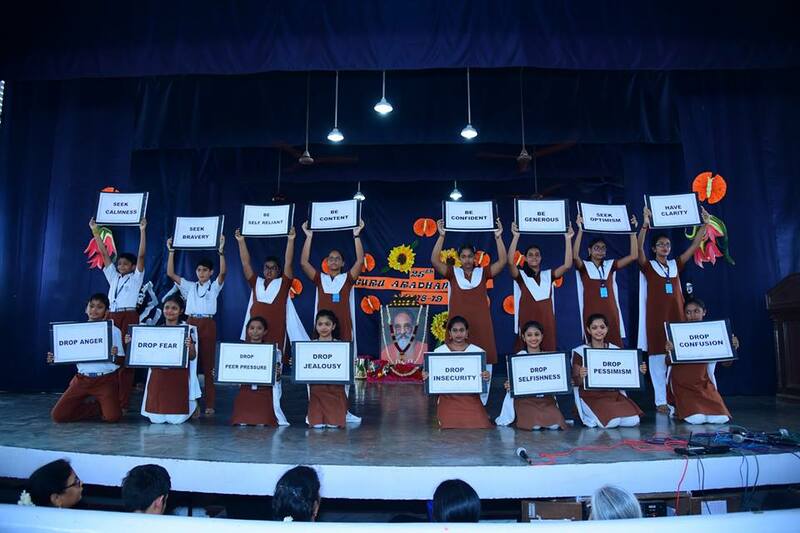 Children did mass drill with smileys and highlighted our school motto. 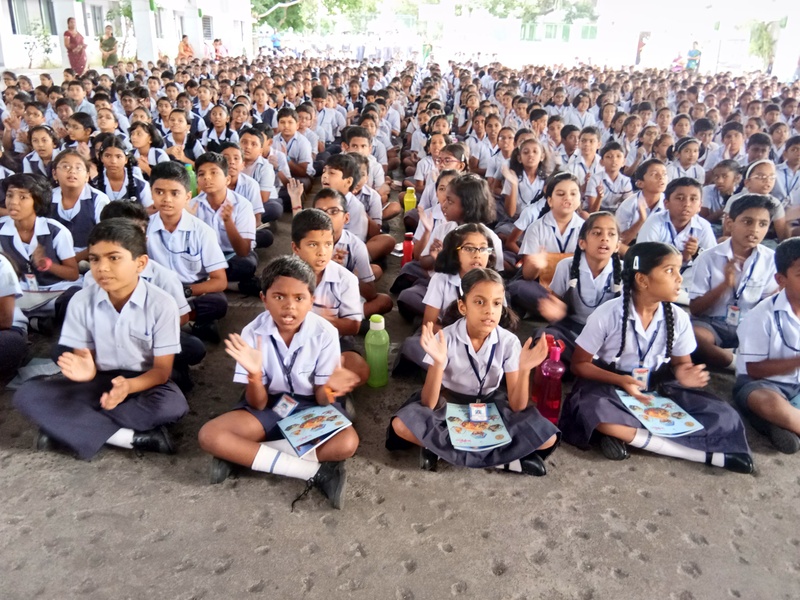 The games conducted for the Children were based on eco-friendly such as “Say No to Plastic”- Go Green and “ Say No to Junk food”- enable them to learn valuable lessons. 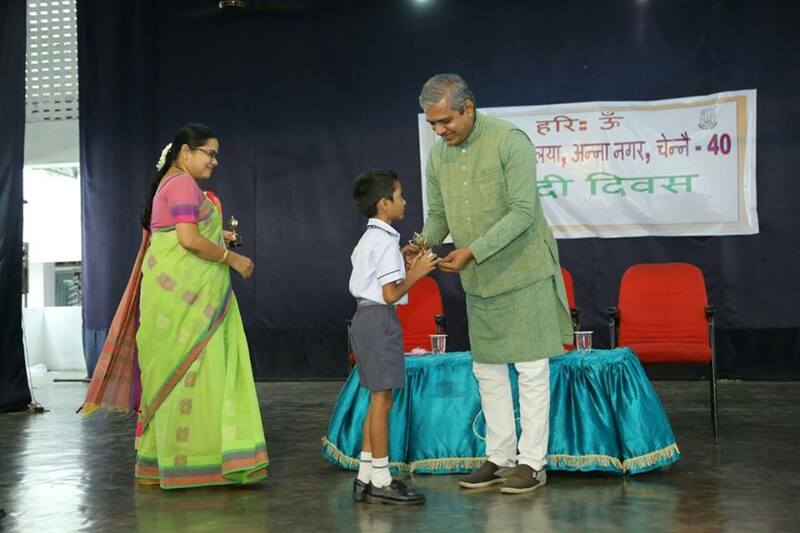 Chief guest handed over the prizes to the winners and parents. Kindergarten Prize day was held on January 4th 2019. 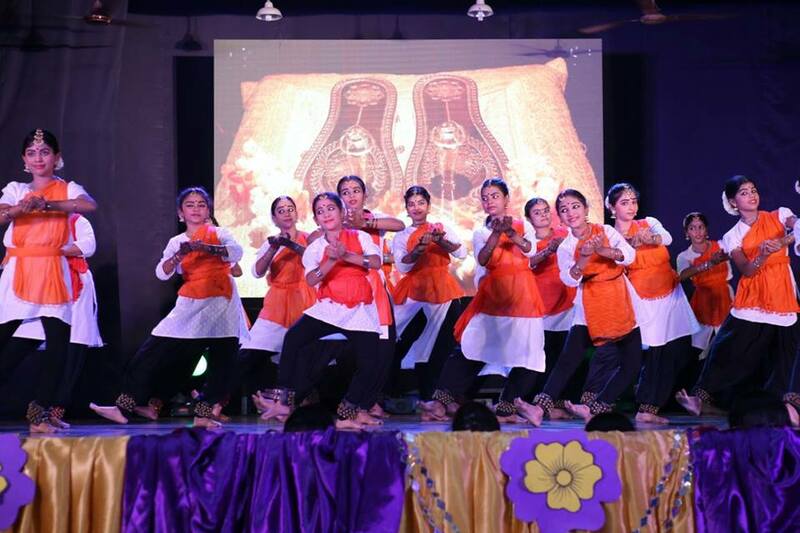 Ms. Ashritha Keshav, a child Psychologist and known dancer was the Chief guest. 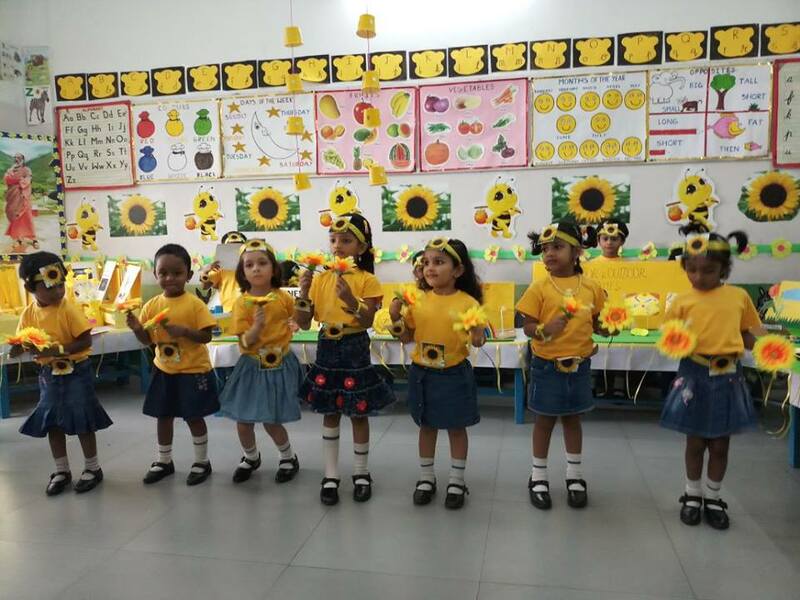 Activity based learning is part and parcel of Kindergarten and an important mile stone in the developmental stages of children. 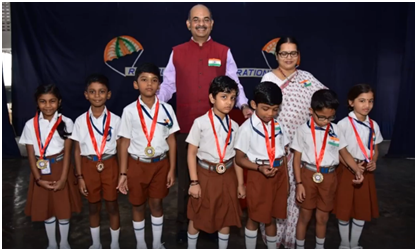 True to it the KG department of CVA conducted number of Competitions to sharpen the children intellectual and social development. 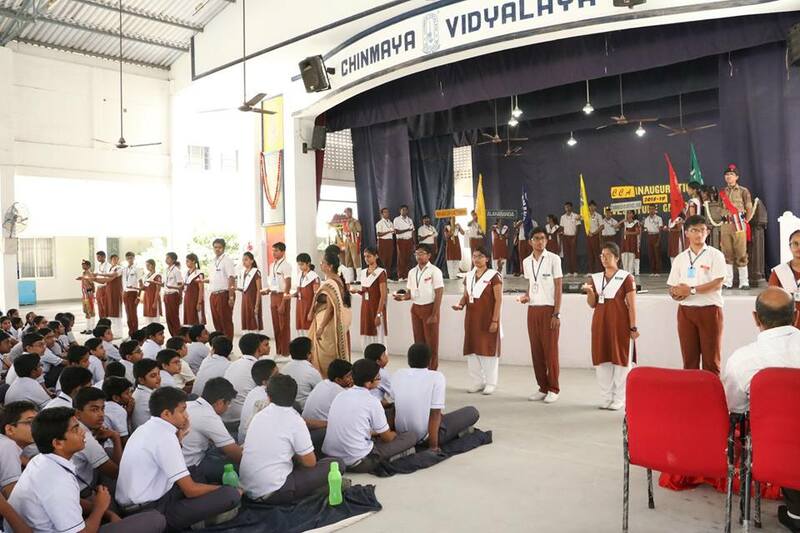 NCC cadets of Chinmaya Vidyalaya Annanagar and Lion’s Club of Chennai organized a blood donation camp on Saturday( 02.02.2019) between 8.30am and 12.30pm. More than 65 units of blood were collected. 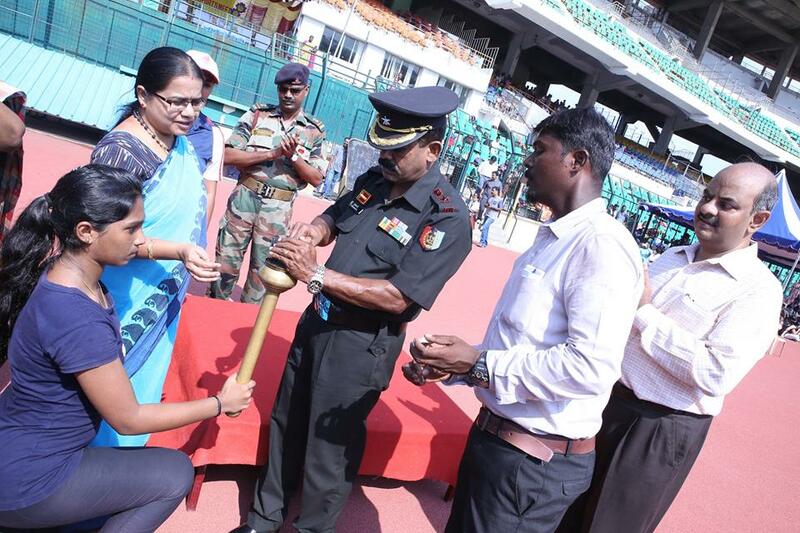 Tamil Nadu Bty NCC commanding officer Lt Col Rakesh kumar was present on the occasion. 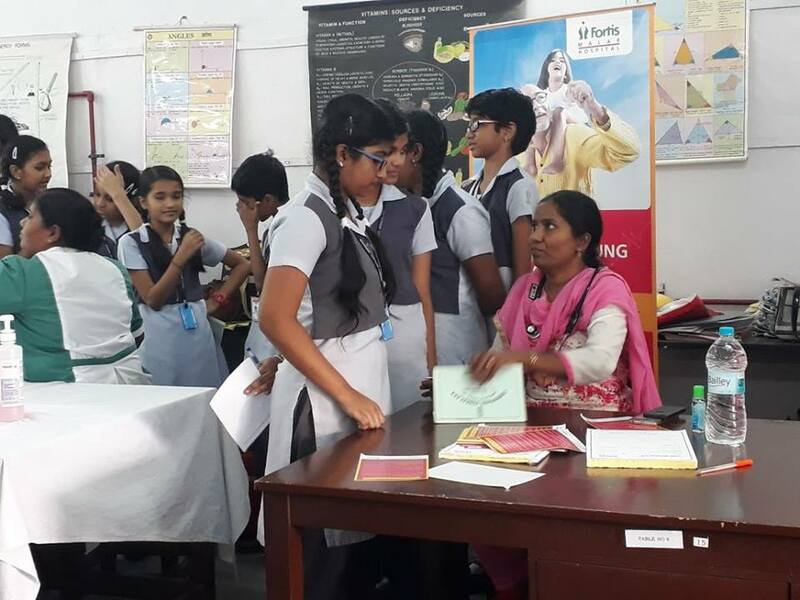 The students of class VII were taken to Chinmaya Tarangini (Uthandi) for life skill progam- ‘History or His story’ On 12th January 2019. 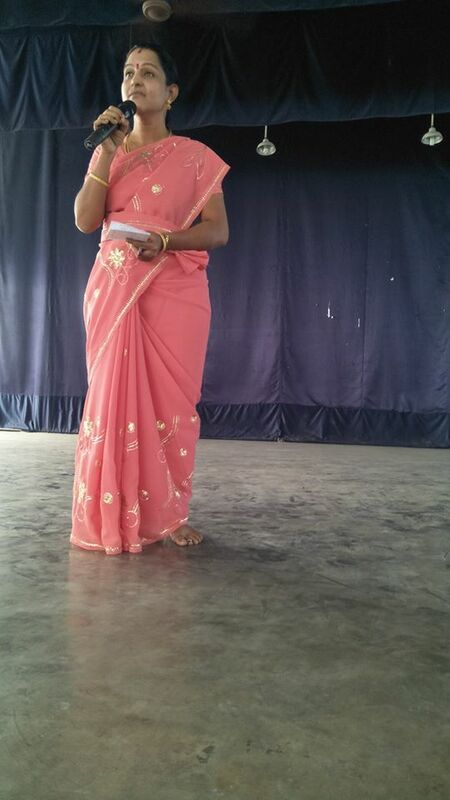 Miss Radha, the CHYK member welcomed the students. 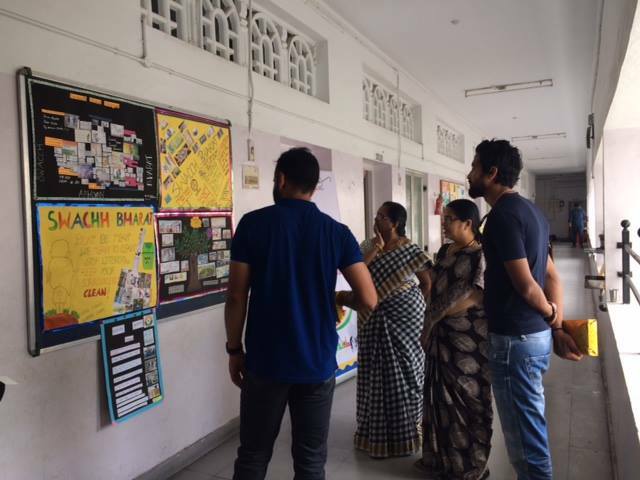 They attended a 3 hour session, in which they learnt the significance of learning history. 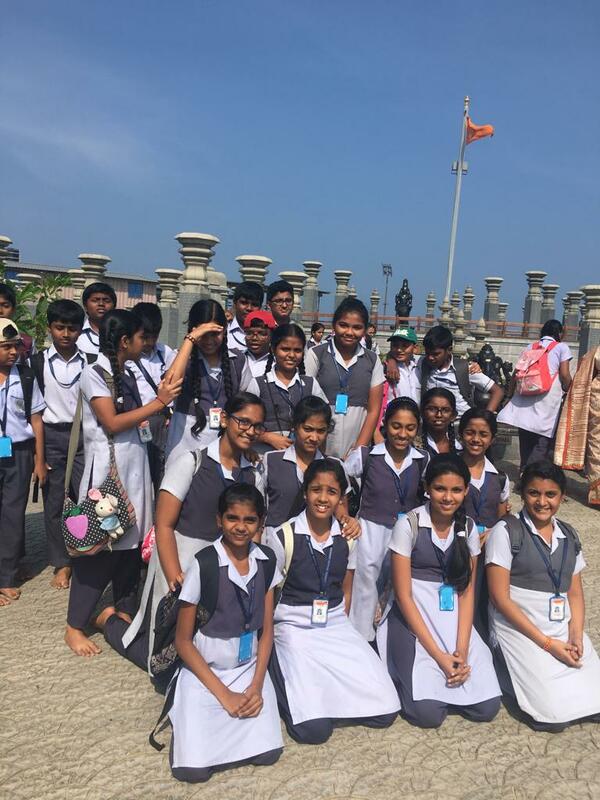 They were made to understand that history is not a mere subject that is learnt in class but a life lesson, where we learn values and how to imbibe values in our lives. An anecdote from the life of Chhatrapati Shivaji was explained to highlight his wisdom and bravery. The most celebrated war-tactic of Shivaji was explained. 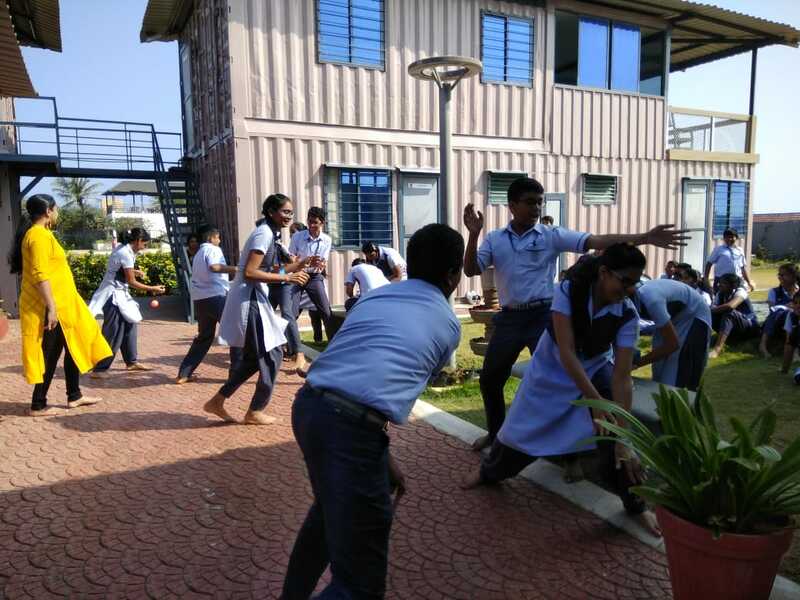 Based on this, a few activities like tug of war, fort building with cups were conducted. 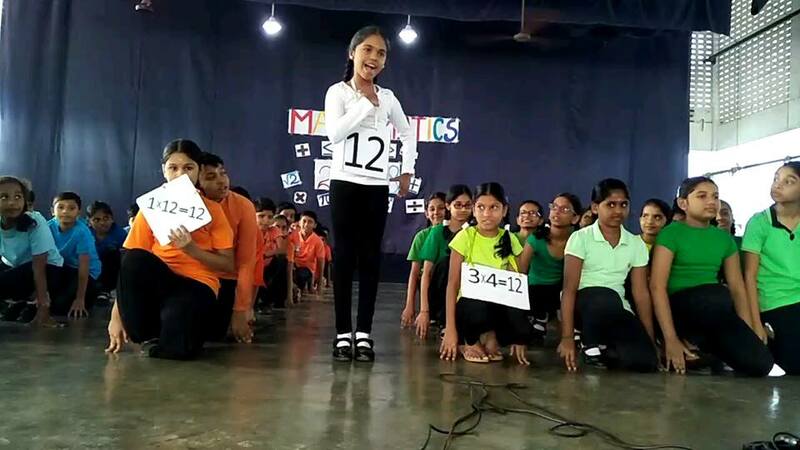 A few memory games were also conducted to develop student’s alertness. 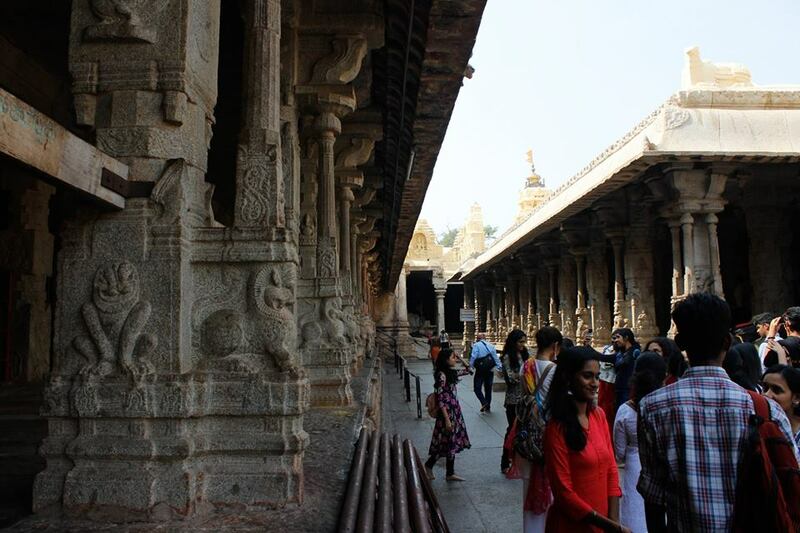 Students were amazed by the beauty of Matsya Narayana temple and its surroundings. 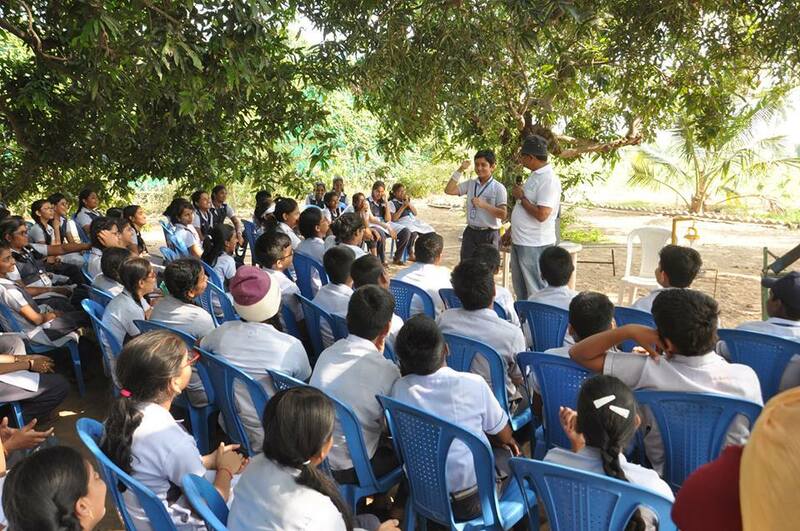 On the whole the session was very informative and a memorable one for the students. 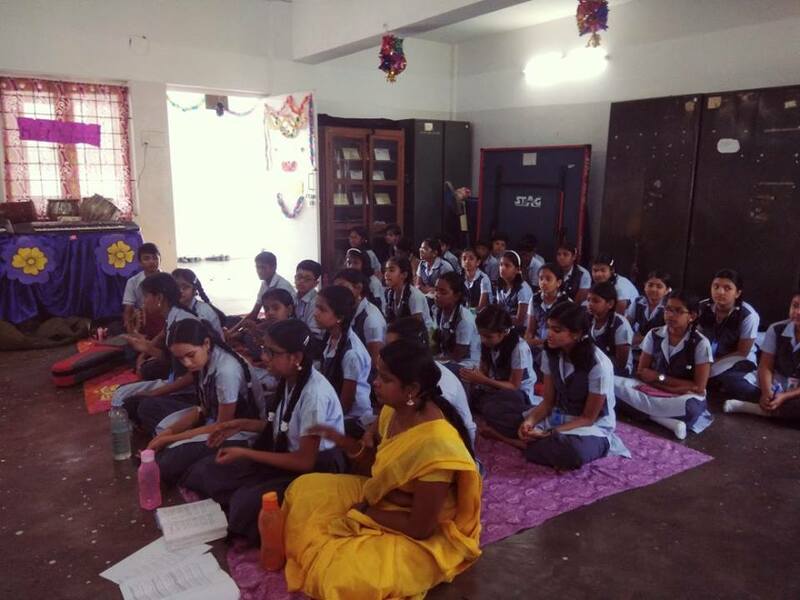 Life skill Program was arranged in Tamaraipakkam on 12 January 2019. 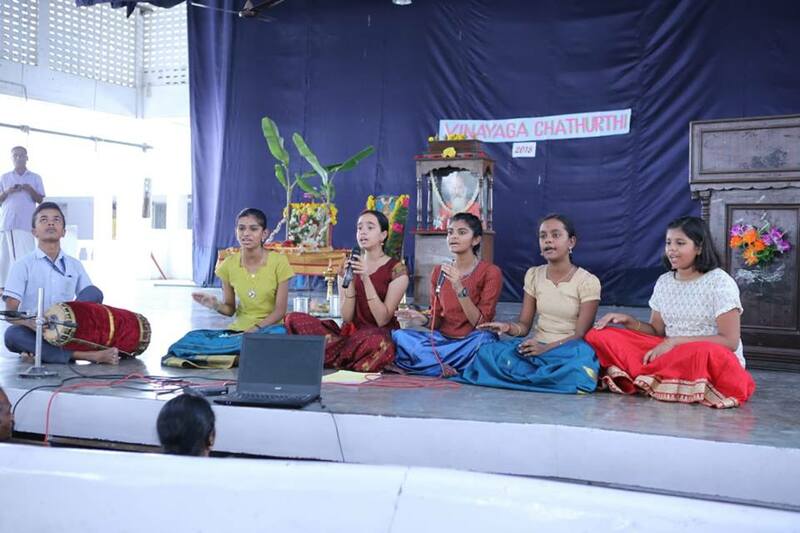 The students of class VIII attended the program. The highlight of the session was foreseeing the future, learning from ones mistake, understanding a problem and finding a permanent solution to it. A few games were organised. 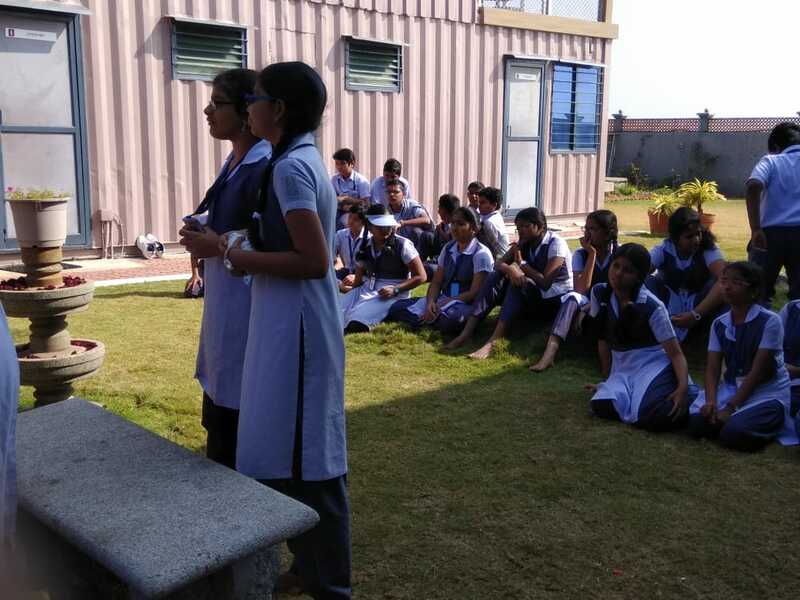 These games made the students understand how to strategize, concentrate and execute a plan in order to succeed, be it a game or a job. 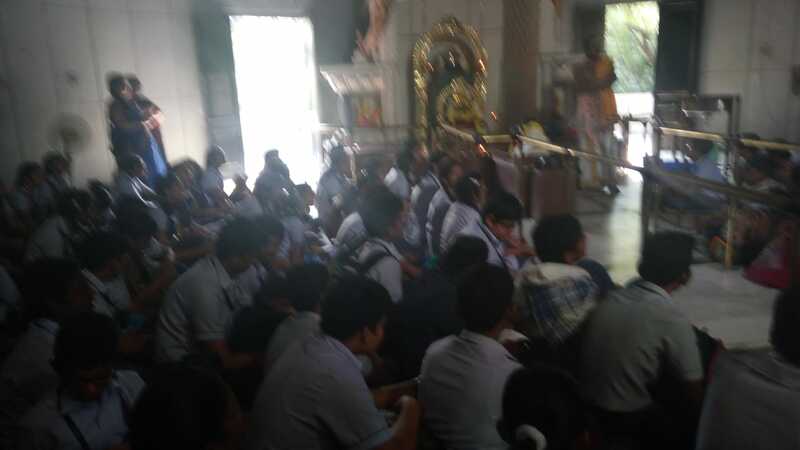 The resource person from Chinmaya mission spoke to the students about the Mauriyan period in Indian history. 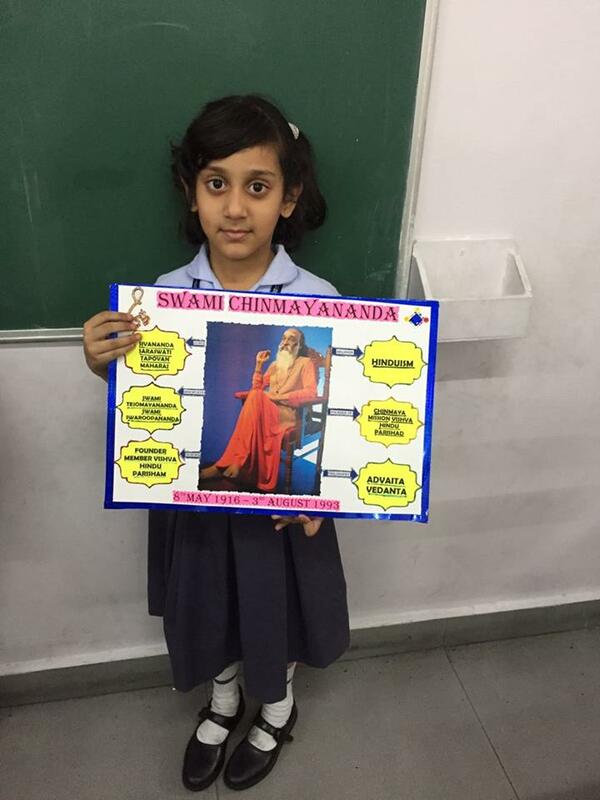 They emphasised on the tactics used by Chanakya inorder to protect and unify the country. 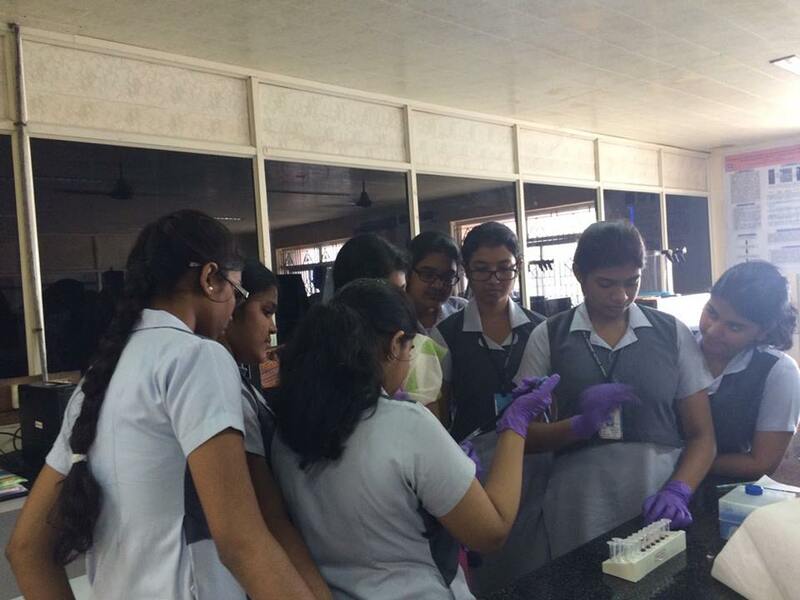 The students enjoyed the session and learnt various life skills that are required for successful living. 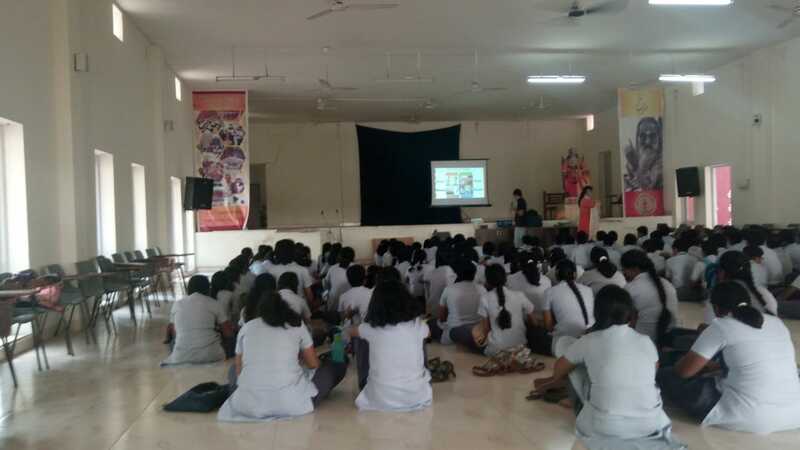 A session on Awareness and Prevention of Child Abuse was organised by CBSE . 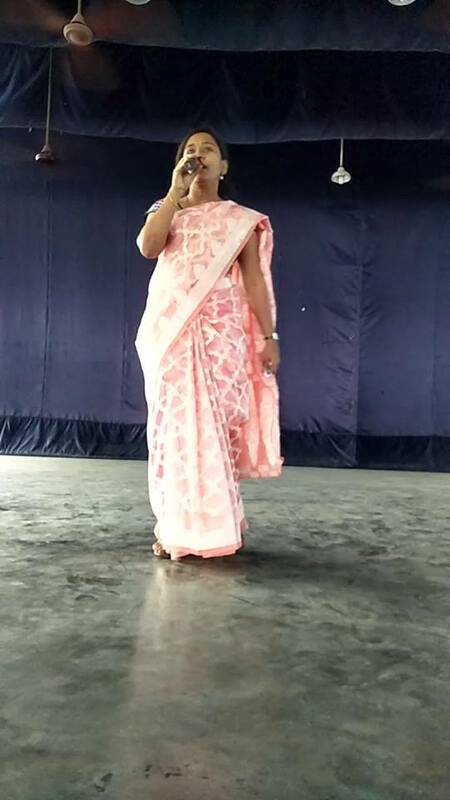 Members of Mukta Foundation a non- government organisation under the guidance of Dr. Sangeeta Mahesh addressed the students of classes VI , VII and VIII on 3rd January 2019.The team spoke to the students about how to differentiate between bad touch and good touch. 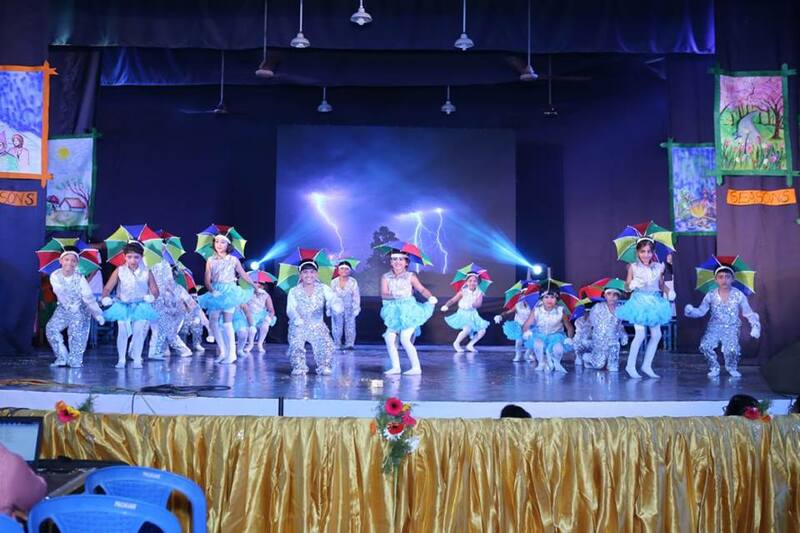 The students were made aware of various ways in which abusers lure children. They were advised to be cautious while interacting even with relatives and acquaintances and not to take their inappropriate closeness for granted. 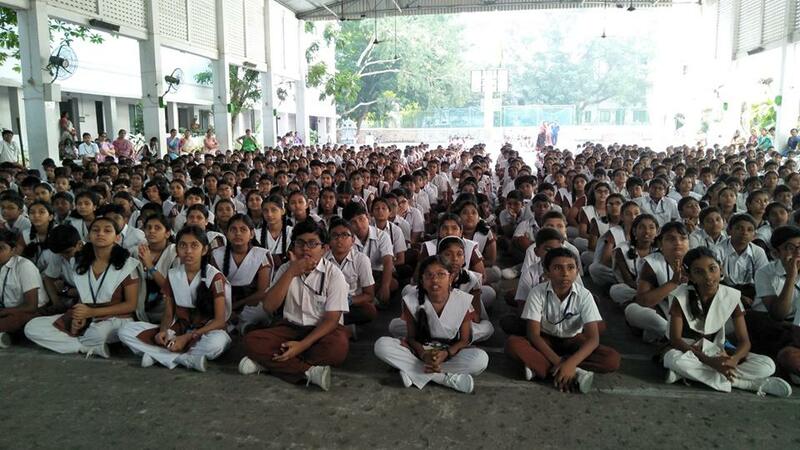 The students were asked to be alert while using the social media. 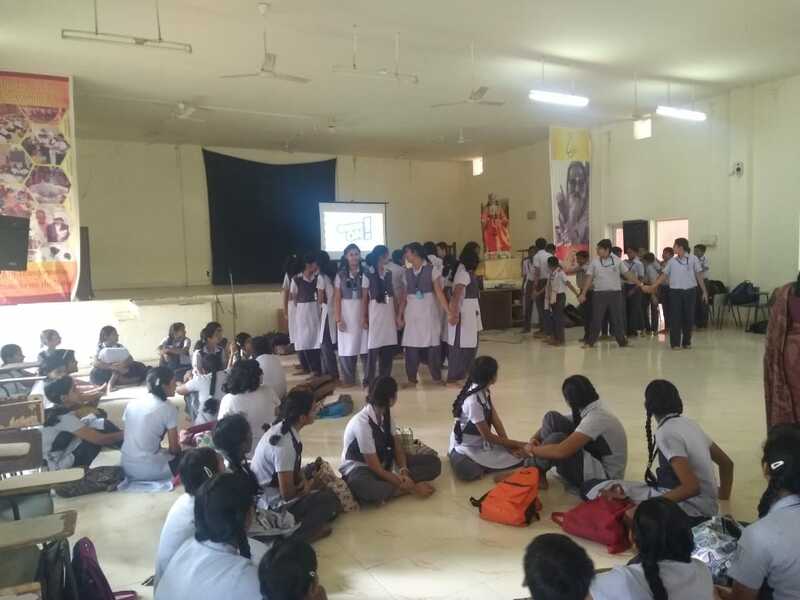 This session has been an eye-opener for ignorant students, to be cautious about lurking dangers in this society. 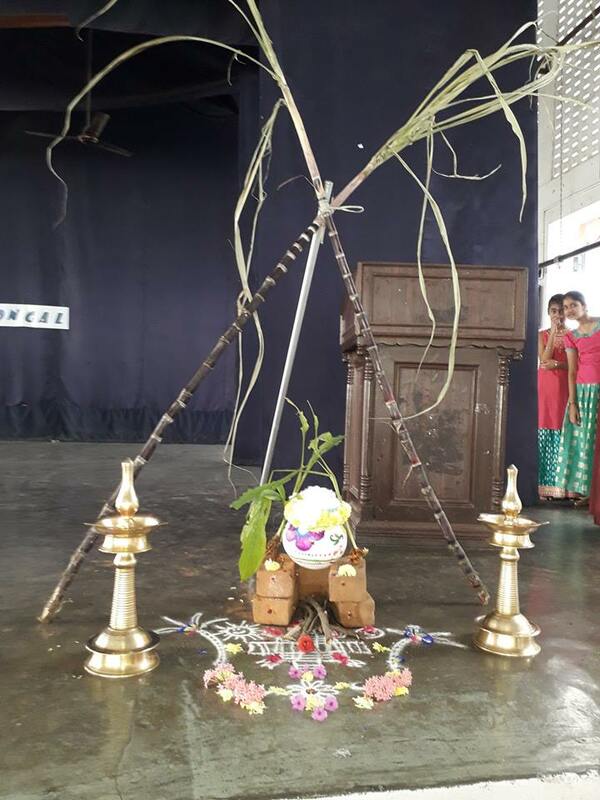 Pongal celebration was held in our Vidyalaya on 11.1.2019 . 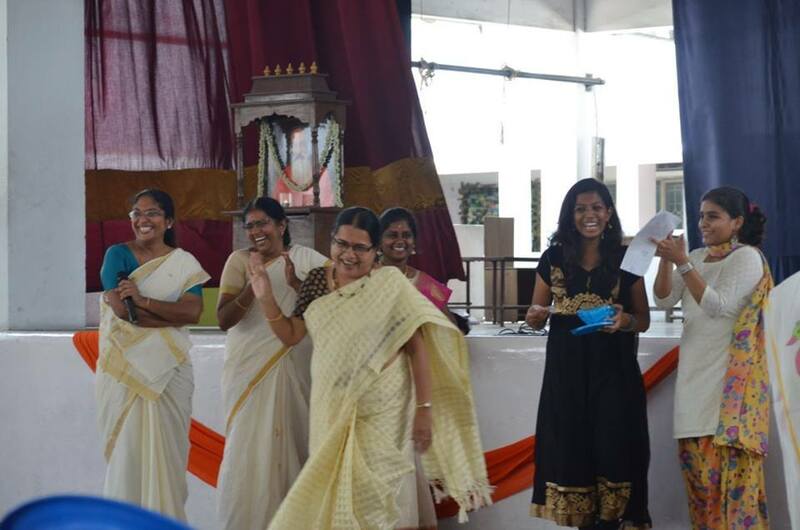 All the staff of the Vidyalaya came in Traditional attire . 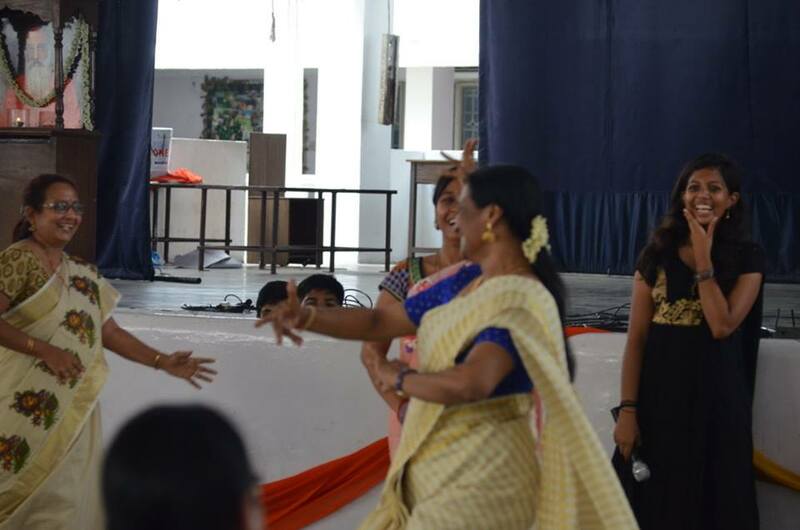 KG Parents very actively and enthusiastically danced for folk song. 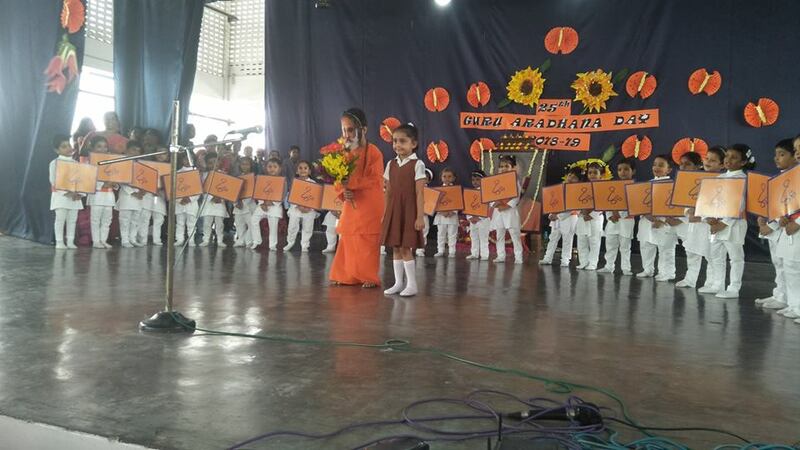 Few children from Primary delivered the speech which gave the importance of Pongal celebration. 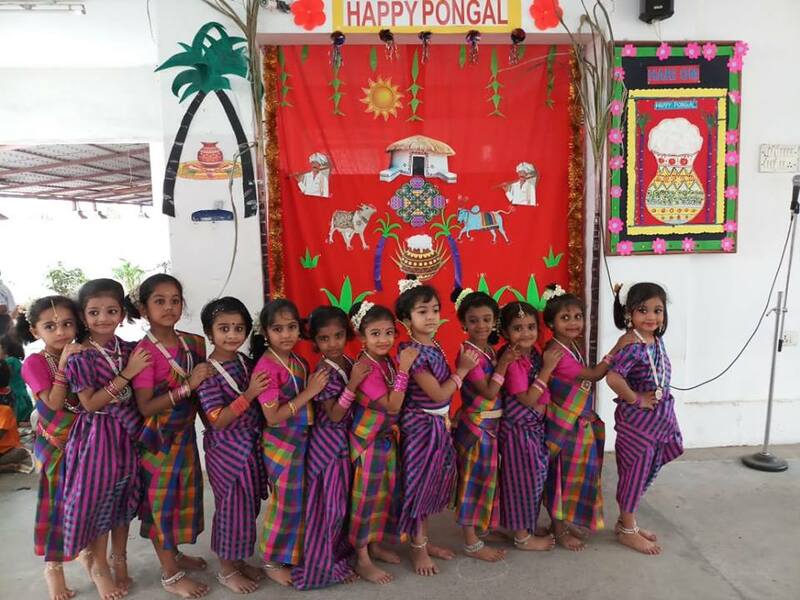 KG Children enjoyed the day with various activities like fun race, folk songs, dances etc, which signified the importance of Pongal. 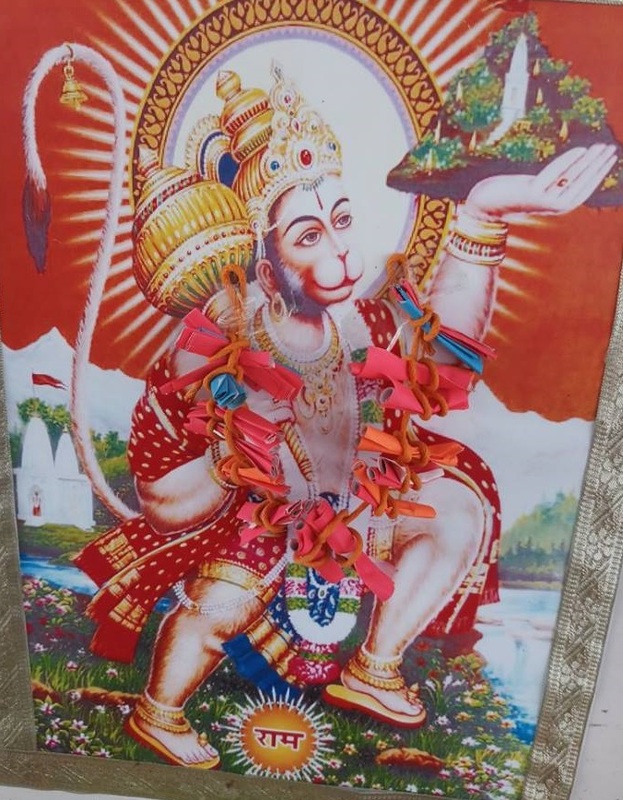 Hanuman Jayanthi was celebrated on 7th January 2019. 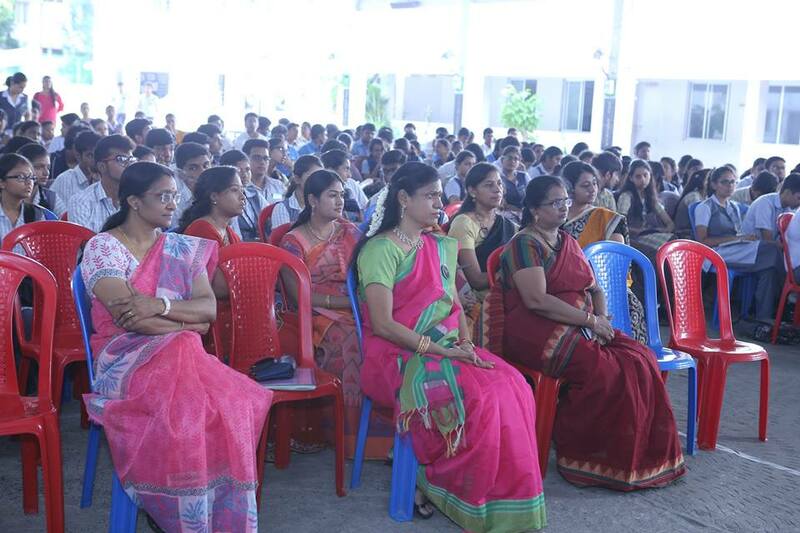 The students of classes III ,IV and V gathered in the auditorium for the celebration. 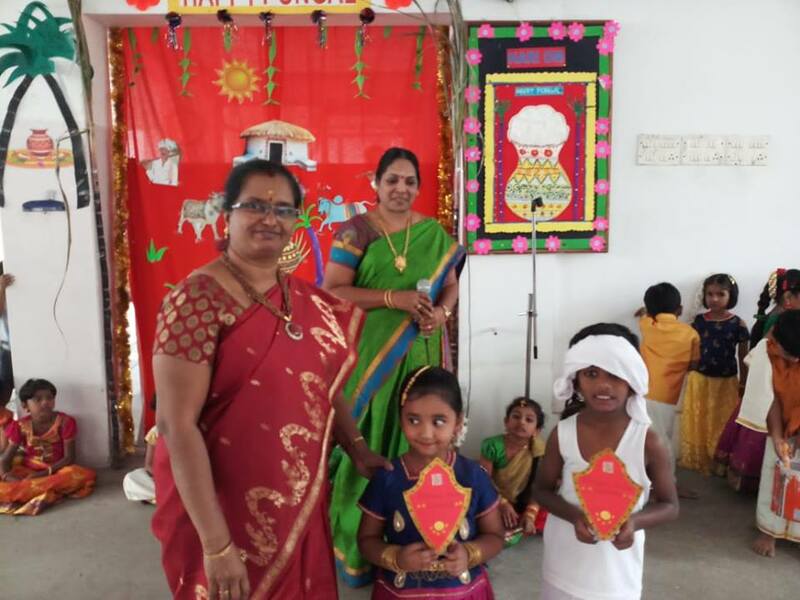 Two students of class V spoke about the virtues of Lord Hanuman and the significance of offering butter to the Lord respectively. 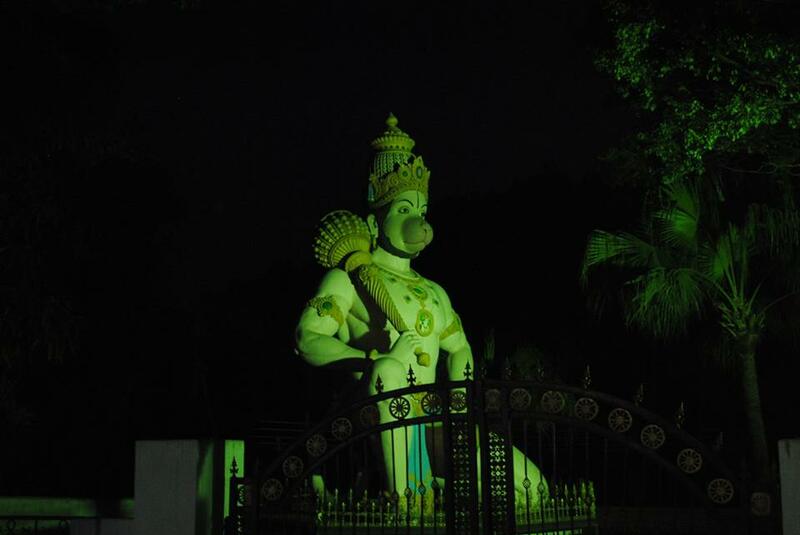 Hanuman Ashtotharanamavali was chanted. 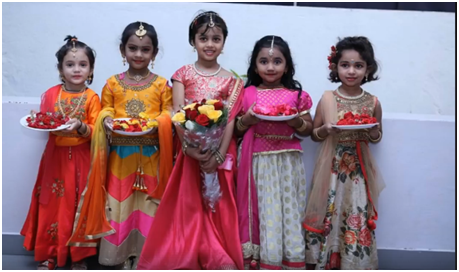 Puja and Aarti were performed seeking the blessings of Lord Hanuman. 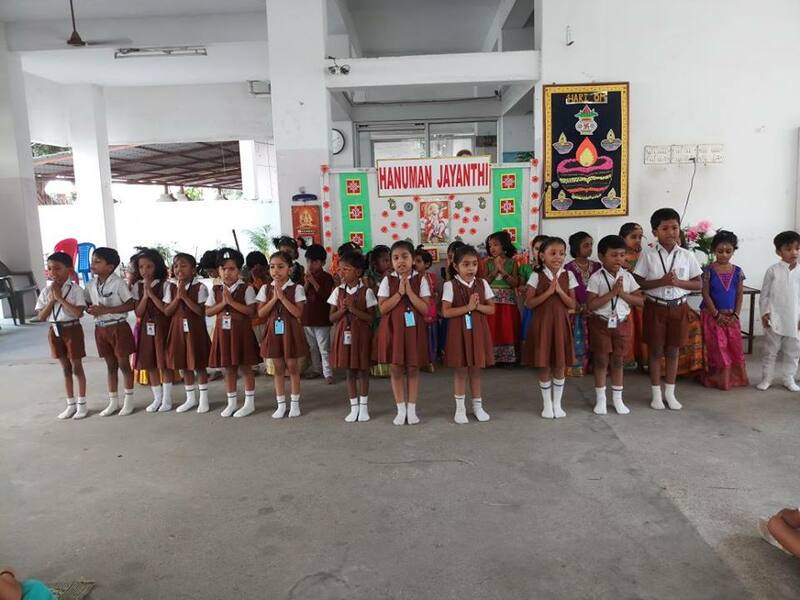 The school choir sang bajans and chanted Hanuman chalisa. 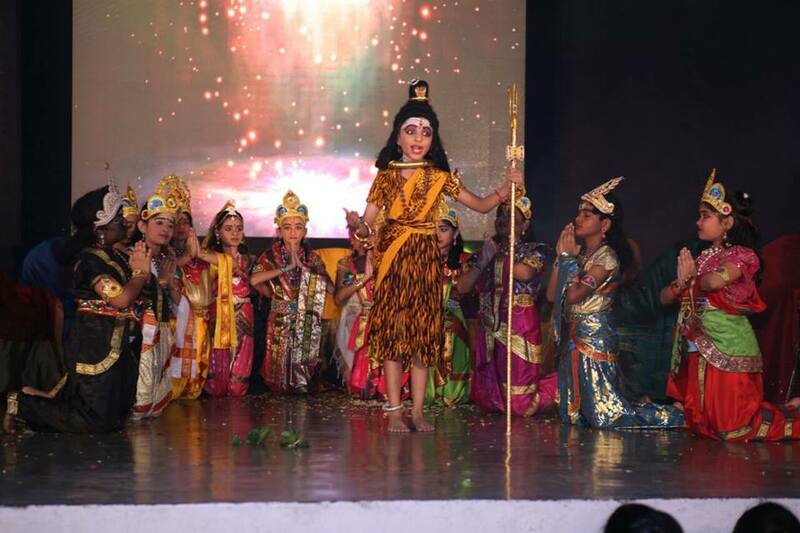 The Balavihar teacher Ms. Saloni Sharma briefed the qualities of Hanuman through stories. 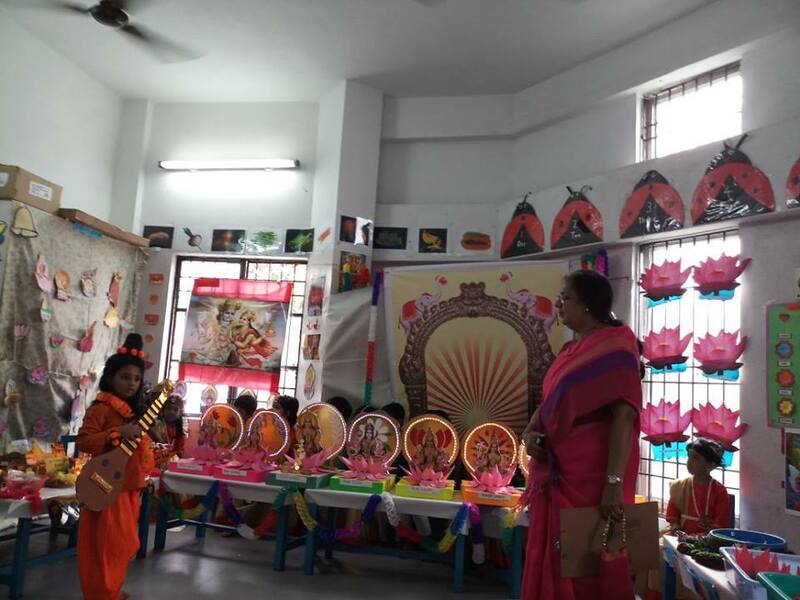 This occasion helped the students aware of the importance of acquiring qualities of lord Hanuman such as humility and dedication. 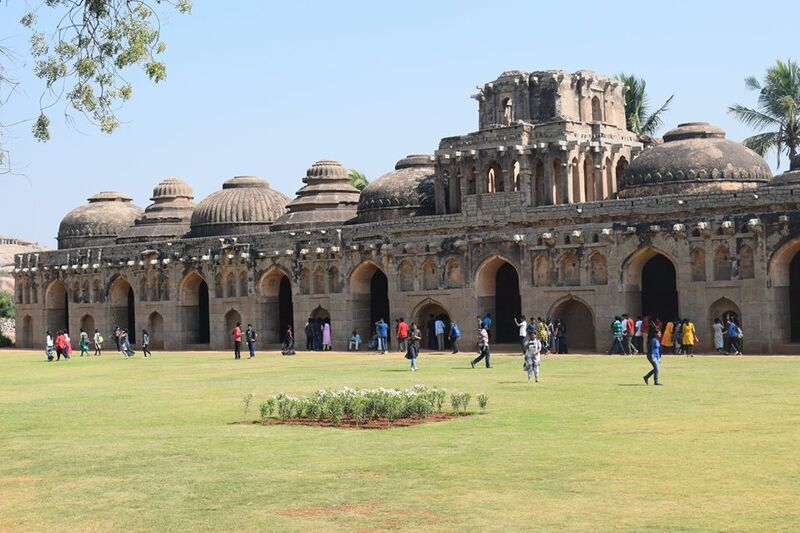 Students from XI th and XII th visited Hampi, a UNESCO world Heritage site in Karnataka in the last week of November. 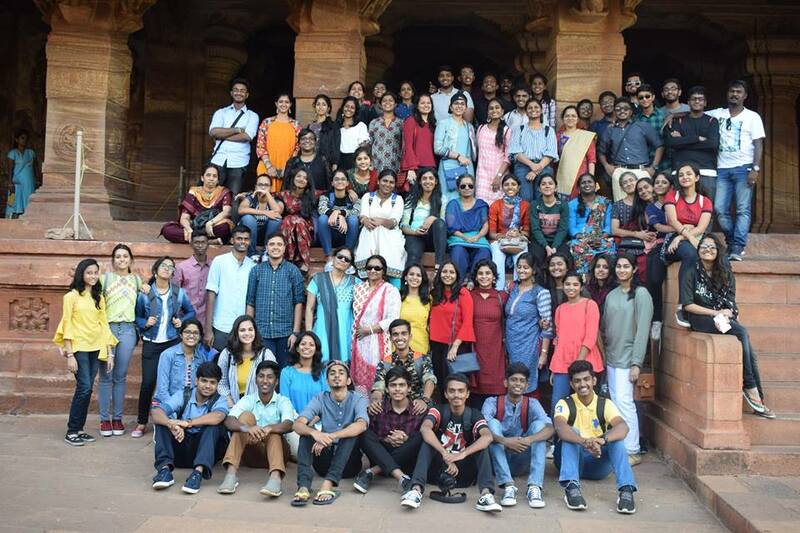 This trip gave them a well deserved break and rejuvenated them to face the forthcoming exams with fresh zeal and vigour. 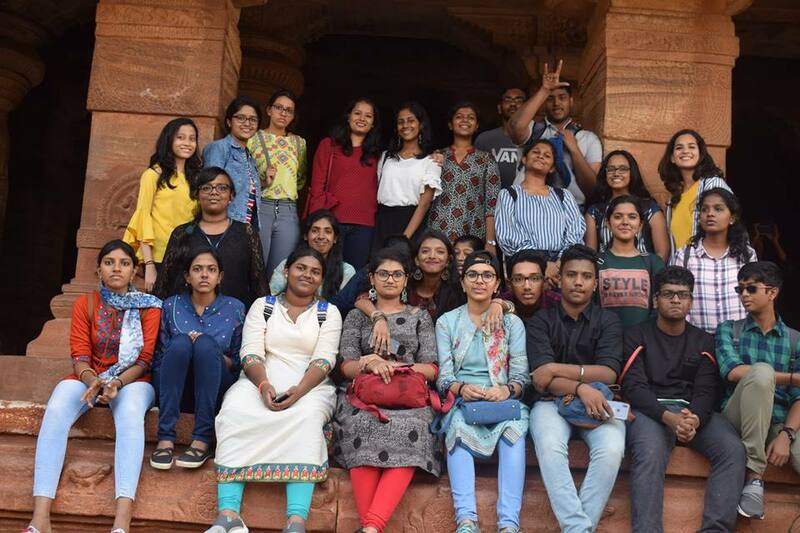 A seminar on Accountancy , Economics and B.Studies was organised by CCMT Education cell, from 3rd-7th December 2018 at CIRS. 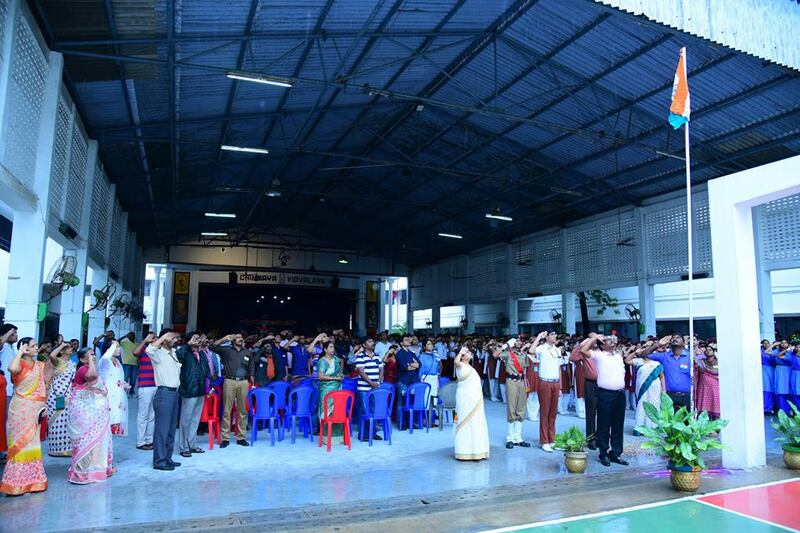 66 teachers from 27 Vidyalayas ,4 Colleges and 5 Vision Schools attended the seminar. 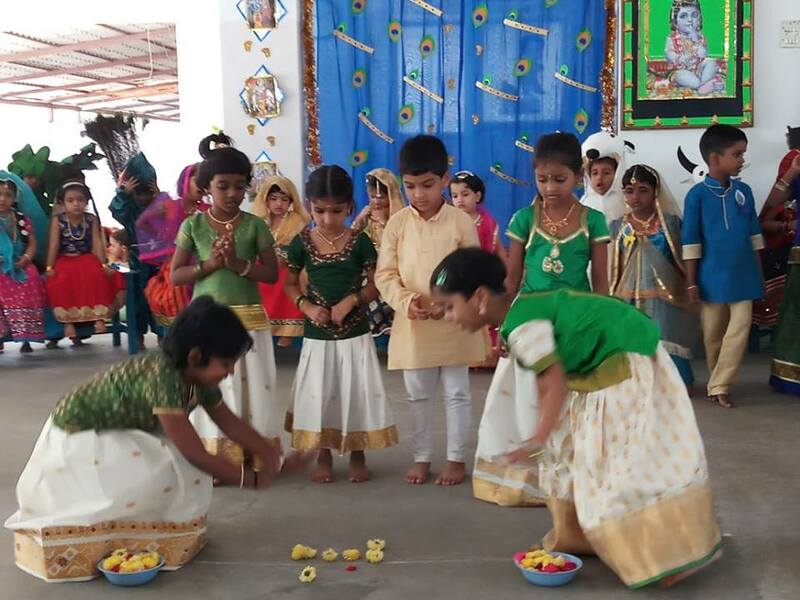 Ganesh Chathurthi celebration was held in our school on Wednesday 12th September 2018. 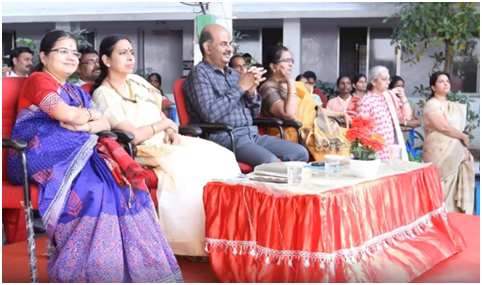 True teachers are those who help us think for ourselves-Dr. Radhakrishnan.’ Chinmaya Vidyalaya Annanagar celebrated Teacher’s Day with zeal and gusto on 5th September 2018. 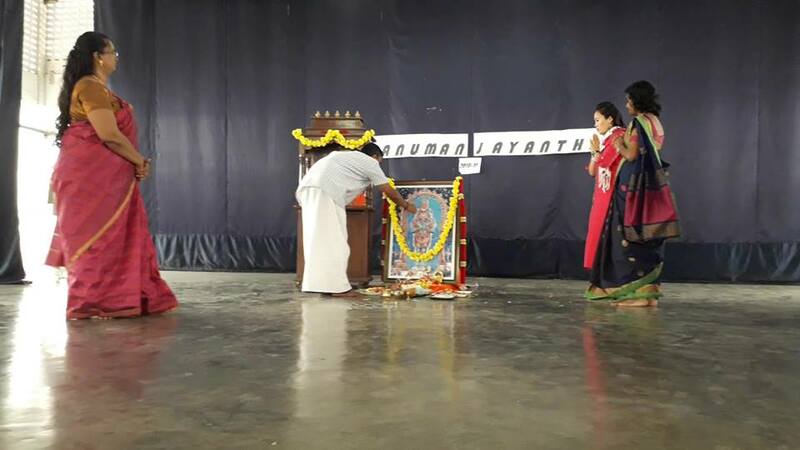 Gokulashtami was celebrated on 3.9.2018 in the school auditorium. 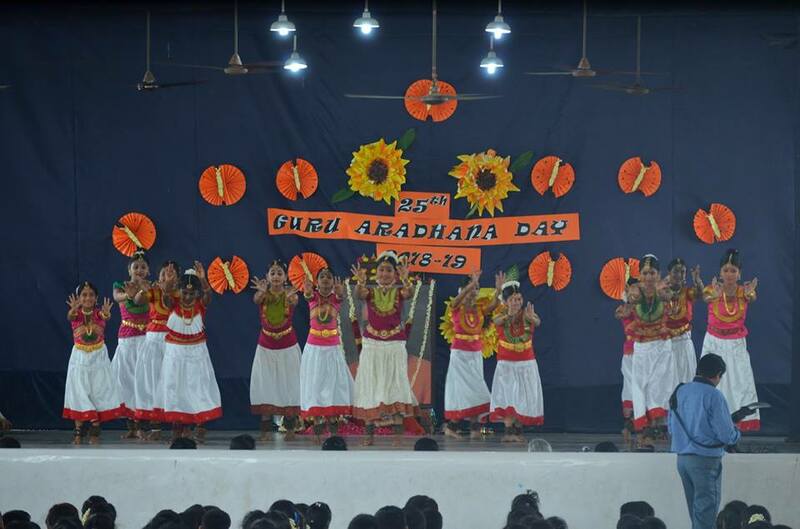 29th Annual Day Celebration of our school was held on 26.10.18. 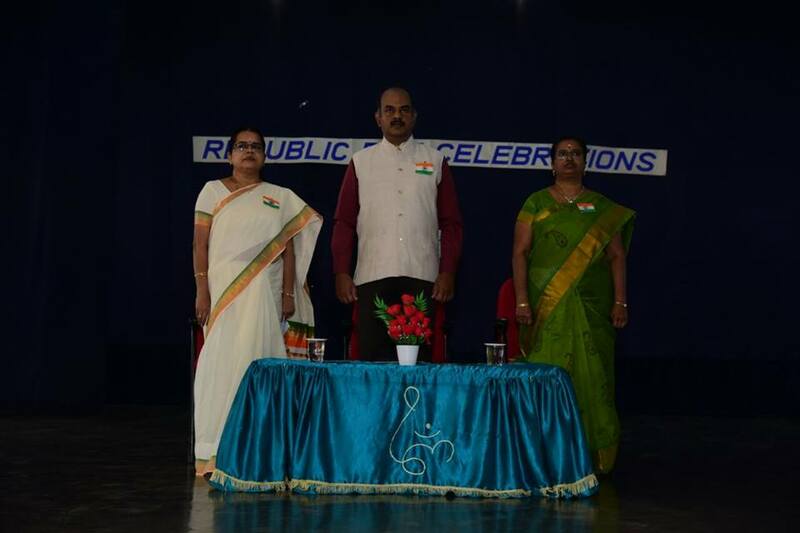 The Chief Guest for the Program was Dr. J. Radha Krishnan, IAS (Principal Secretary, Health & FW Dept.) 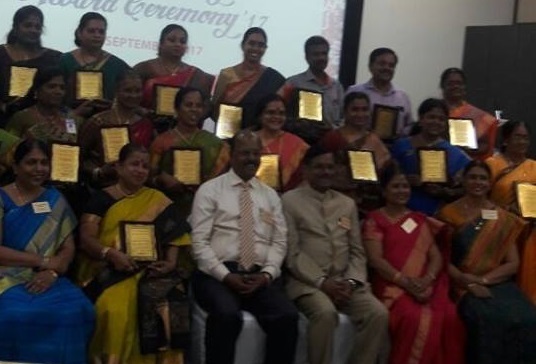 and the Guest Of Honour was Dr. S. Guna Sekaran, Ph.D., DSC (TANSA Awardee, Dean, Research & Development, St.Peter’s Institute of Hr. Education Research & Founder President, Indian Spectro Physics Association). 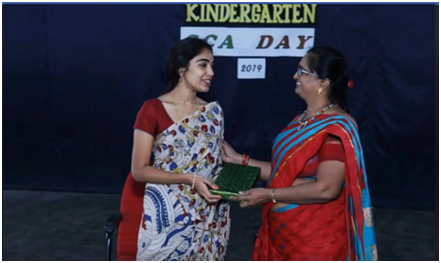 Students received the Endowment prizes for various categories as well as the Best Students award from each class for the year 2017-2018. 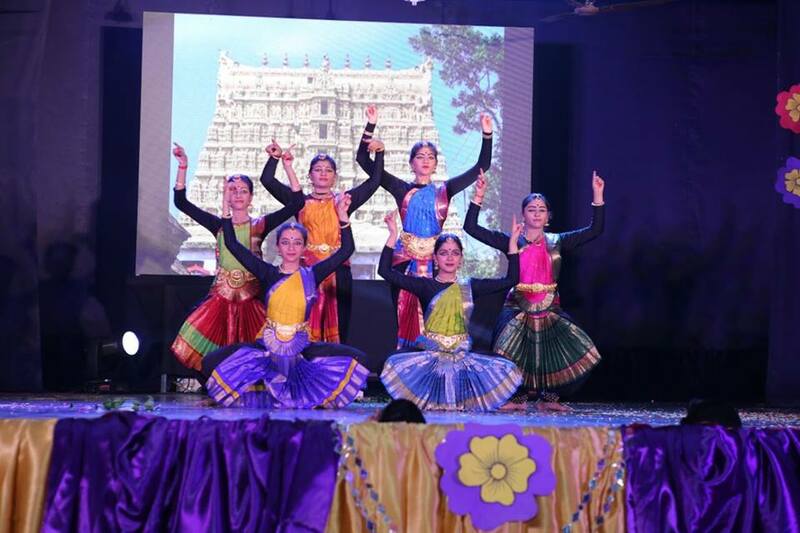 The Theme for the Cultural Show was “RTUSAMHARA” (SEASONS). The Show was mind blowing and kept the audience stand still. 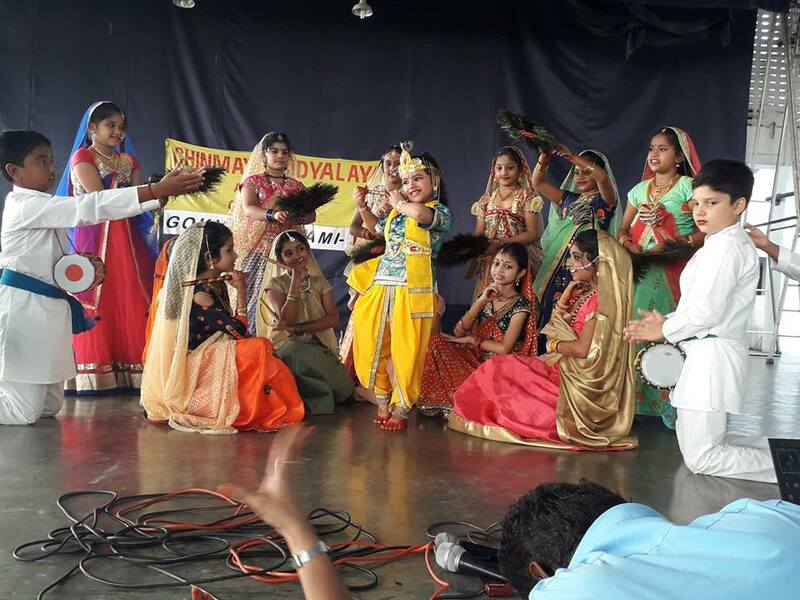 Children's Day was celebrated in CVA with a lot of enthusiasm this year. 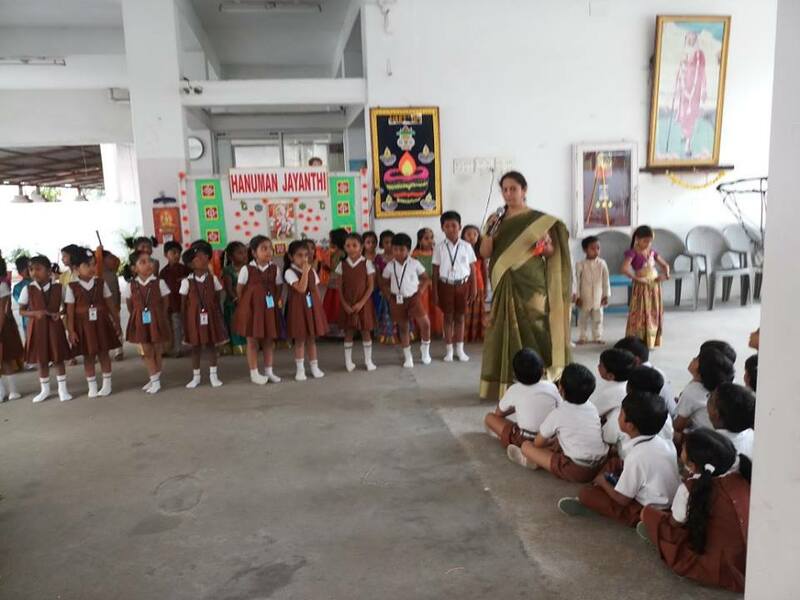 There was a reversal of roles, as the teachers conducted the morning assembly instead of the students. 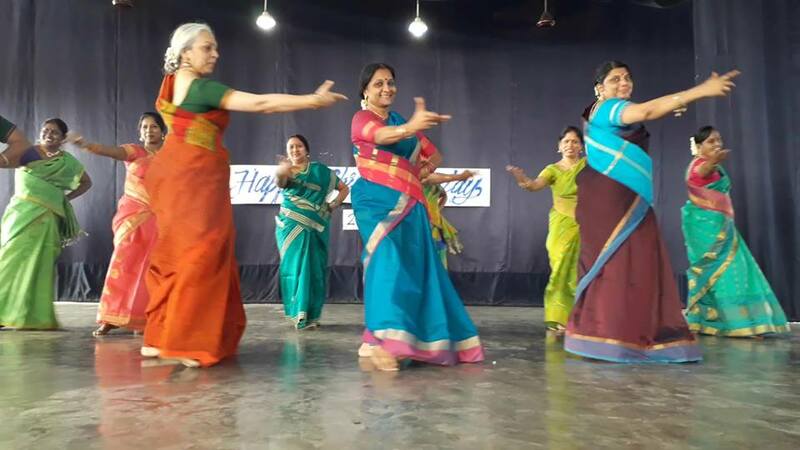 Teachers had also planned a short cultural program to entertain their dear students. 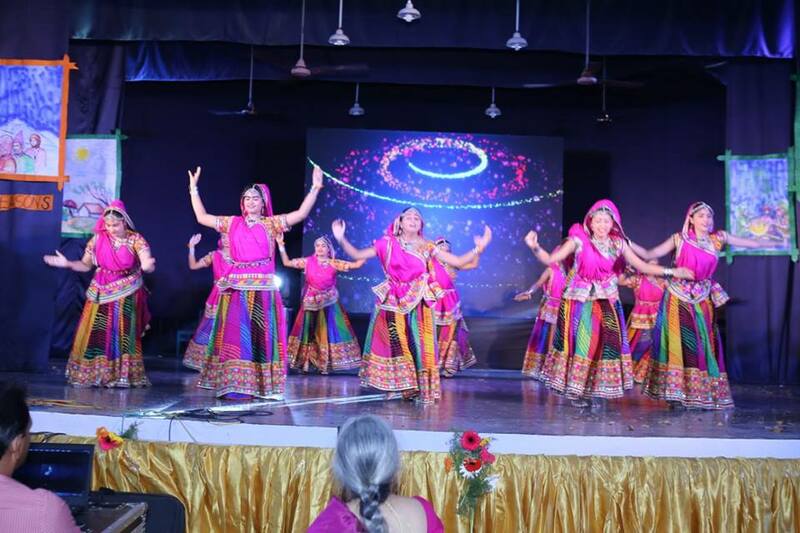 There were two colourful group dances, melodious group songs and delightful solo performances. 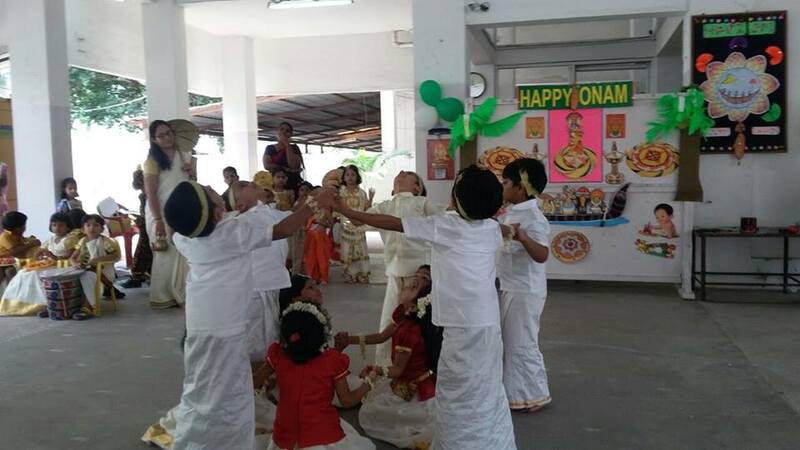 Fun-filled activities too were conducted in which children participated wholeheartedly. 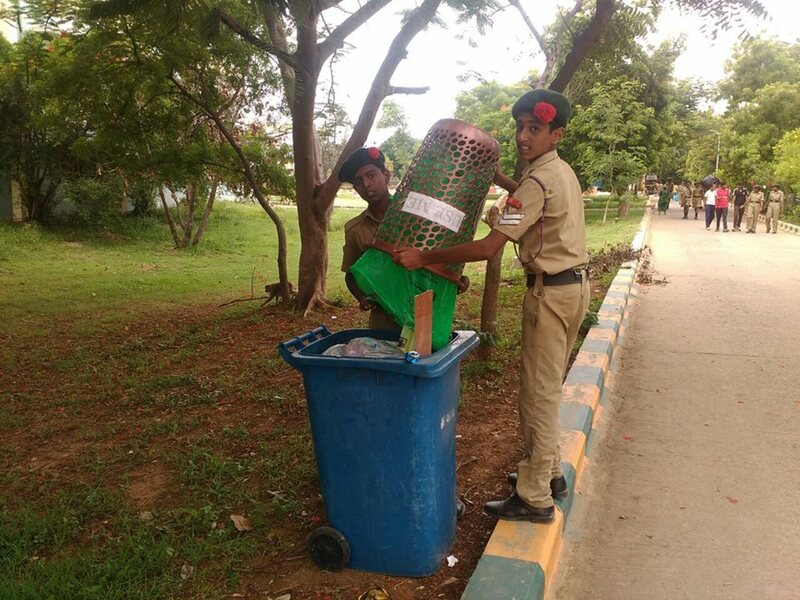 The campus was abuzz with excitement and joy. 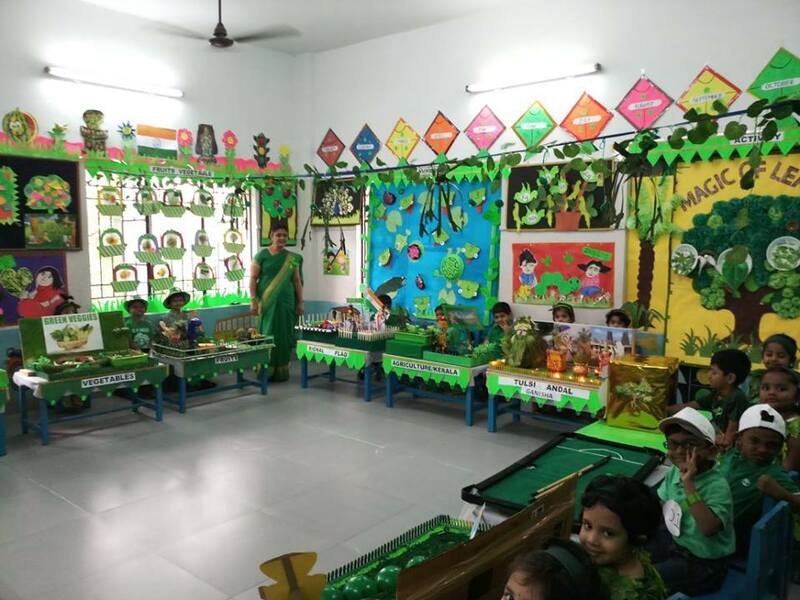 The whole school was a riot of colours as children came in their finest clothing. It was a memorable day for everyone. 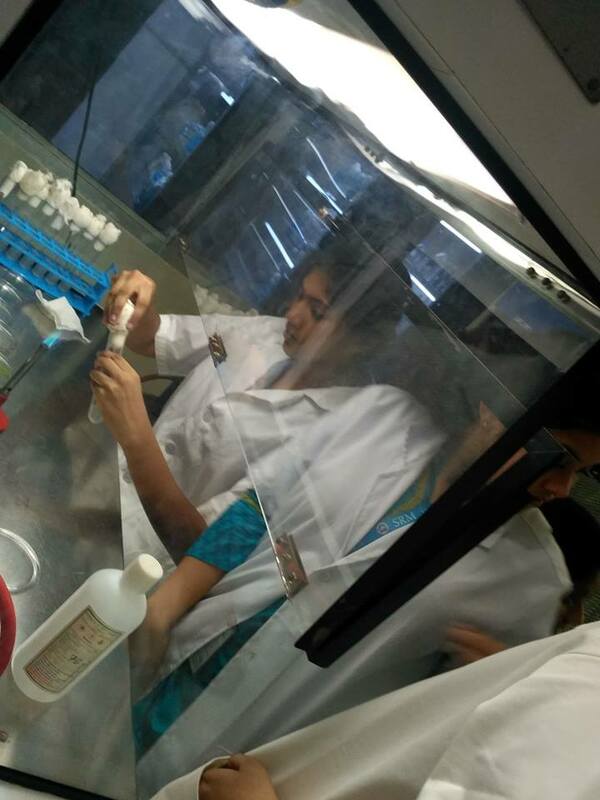 Bio Students of Std XII has been taken to Bio technology Dept of S.R.M University on 31.08.2018 for the program Rariora-2018. 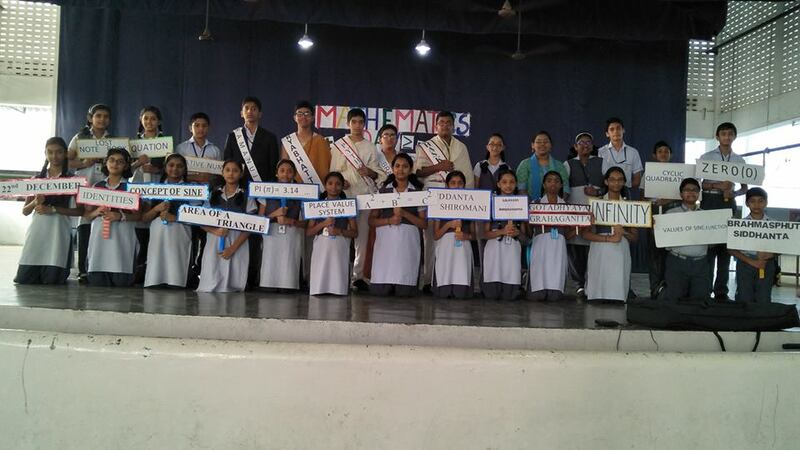 The theme for the event was ‘God Cells’ (Stem cells). 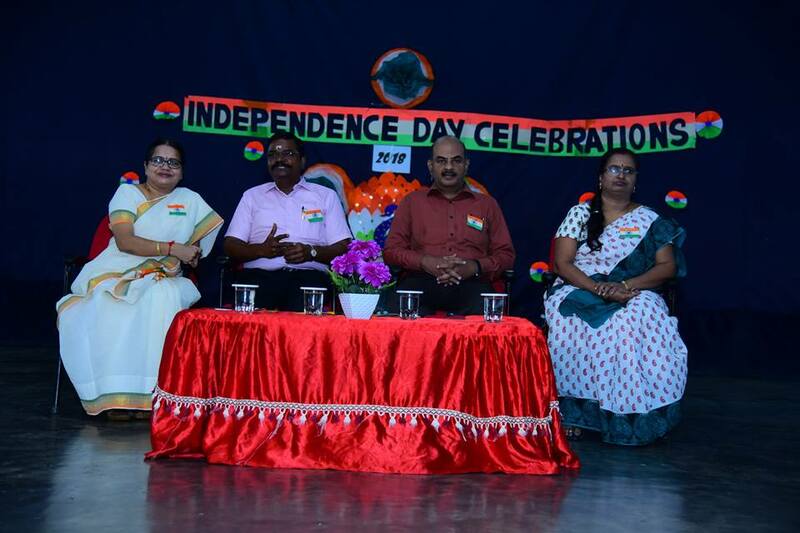 Independence day celebrations was held in our school premises on August 15th 2018. 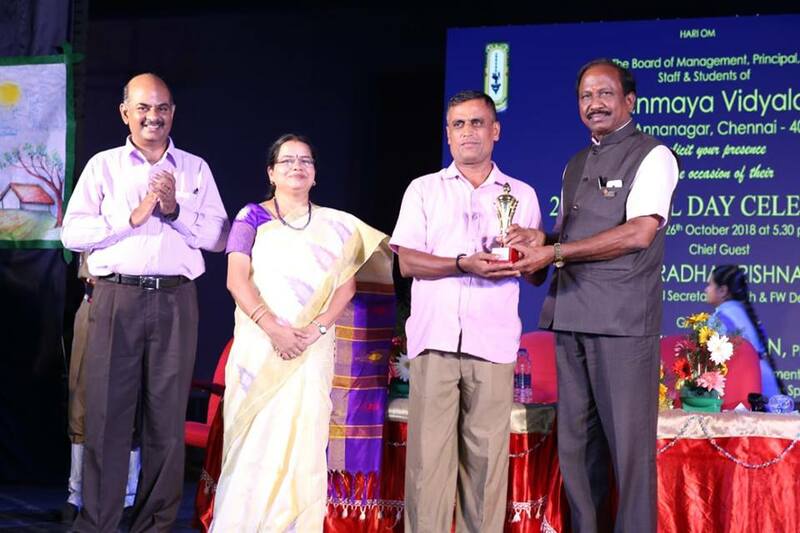 The events were presided over by the Chief Guest Dr. S Pandian (Additional commissioner of Income Tax). 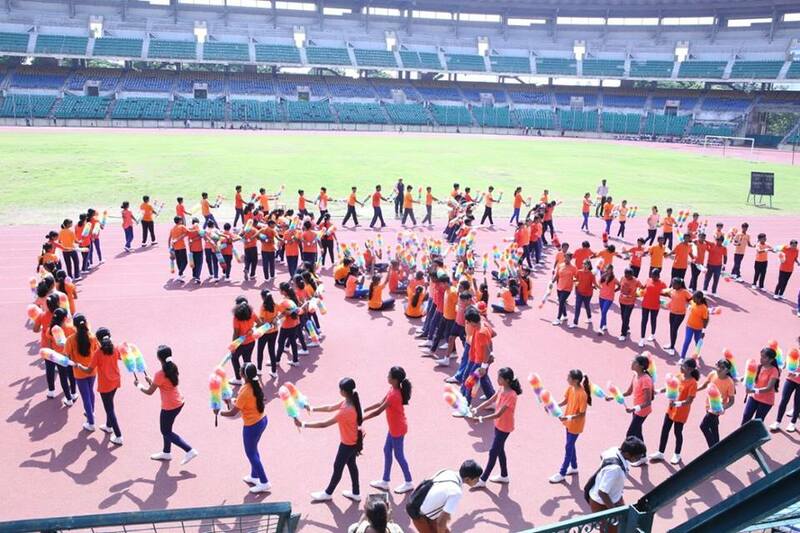 The sports day was conducted on 27th August 2018 at the SDAT Jawaharlal Nehru Stadium. 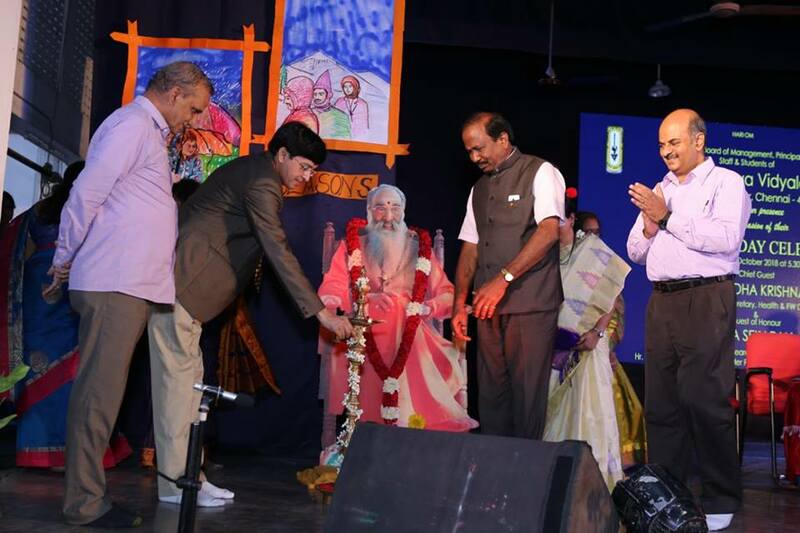 Chief guest, Shri. M Janakiraman, Superintendent of customs, (Central Excise & GST). 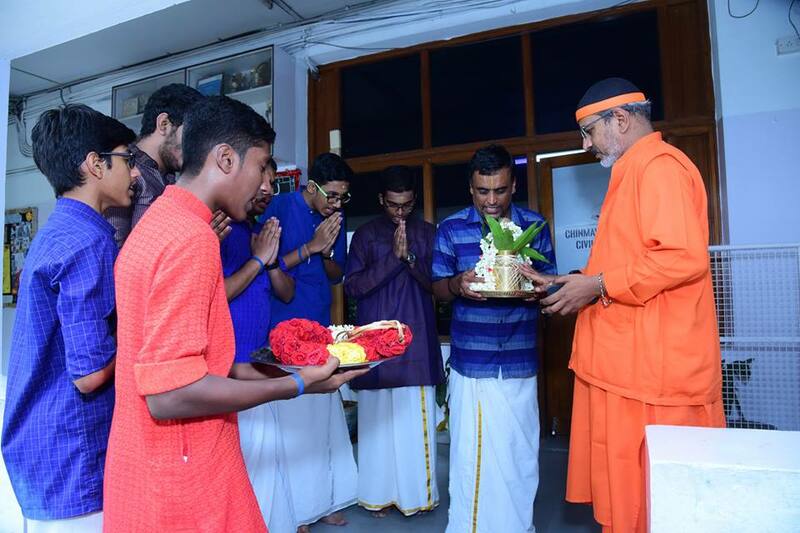 The closing ceremony was graced by the presence of Shri. 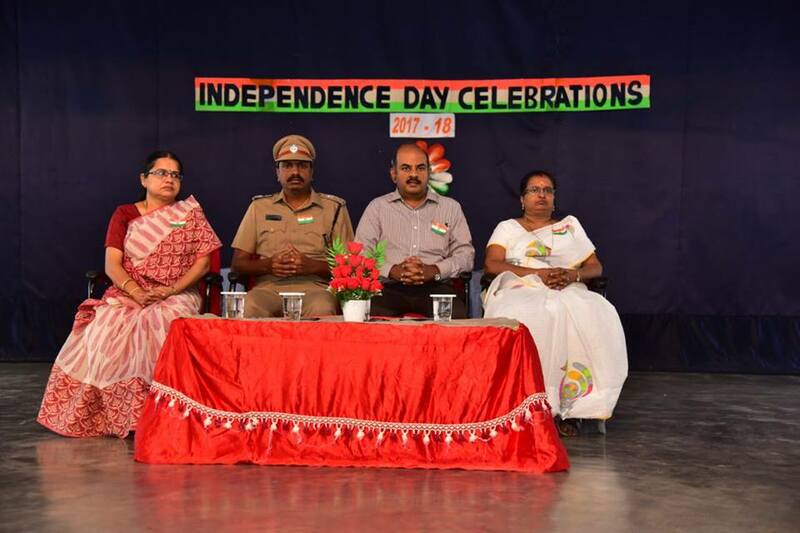 S. NAVANEETHA KRISHNA PANDIAN, Superintendent of customs, (Central Excise & Service Tax). 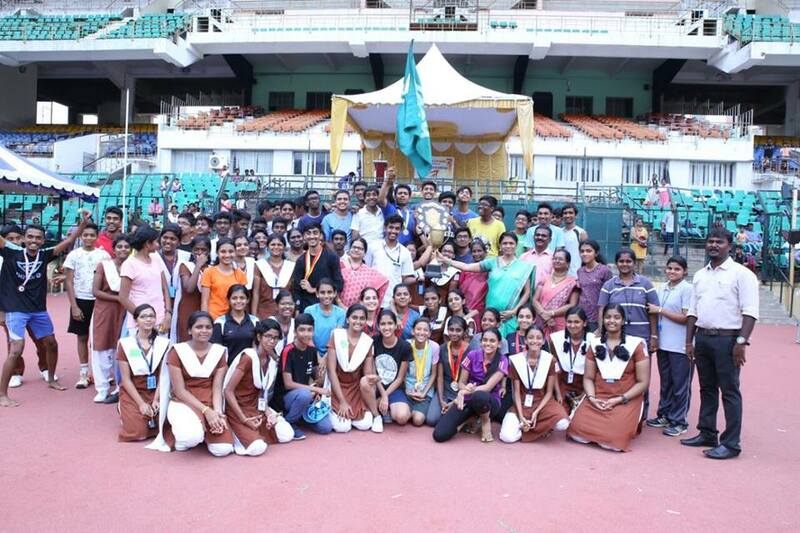 Students, Parents and teachers actively took part in the events and won prizes. 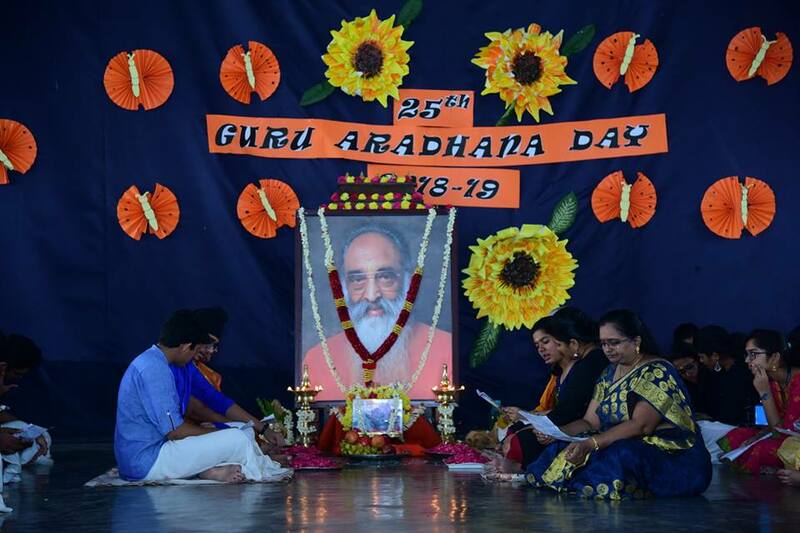 The students of the Vidyalaya & staff observed the 25th Guru Aradhana day by recalling the greatness of Gurudev and by offering our gratitude to our great teacher. 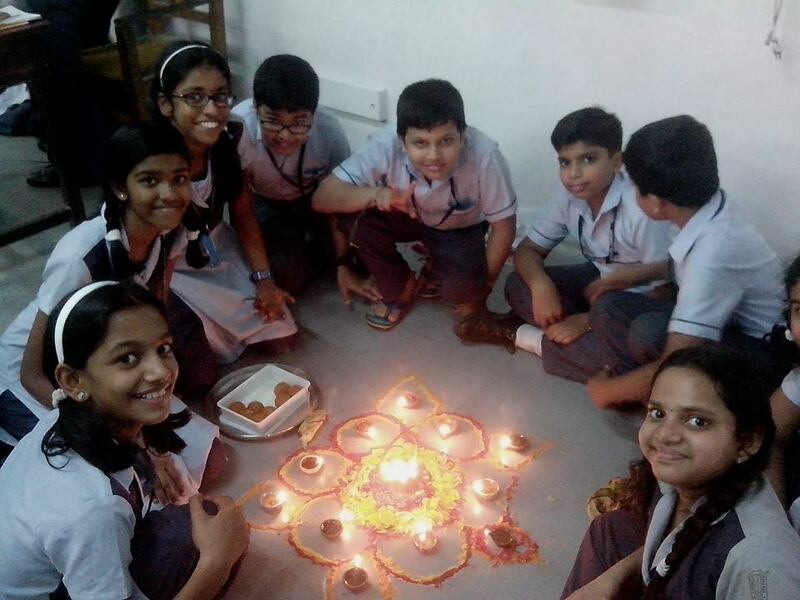 The day began with the paduka puja performed by the students of classes XI & XII. 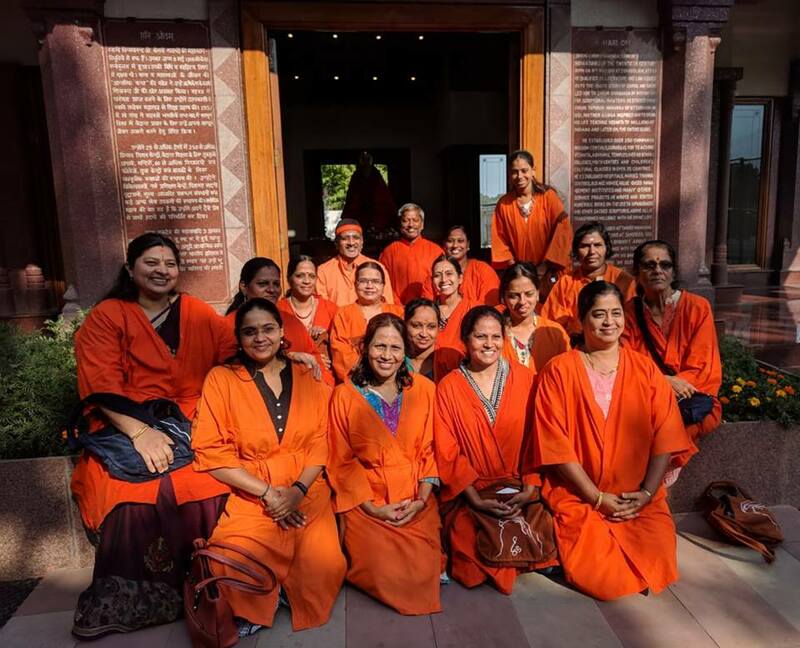 H H Swami Tejomayananda’s peace message was read out in the assembly and the 18th chapter of the Bhagawat gita was chanted by the students. 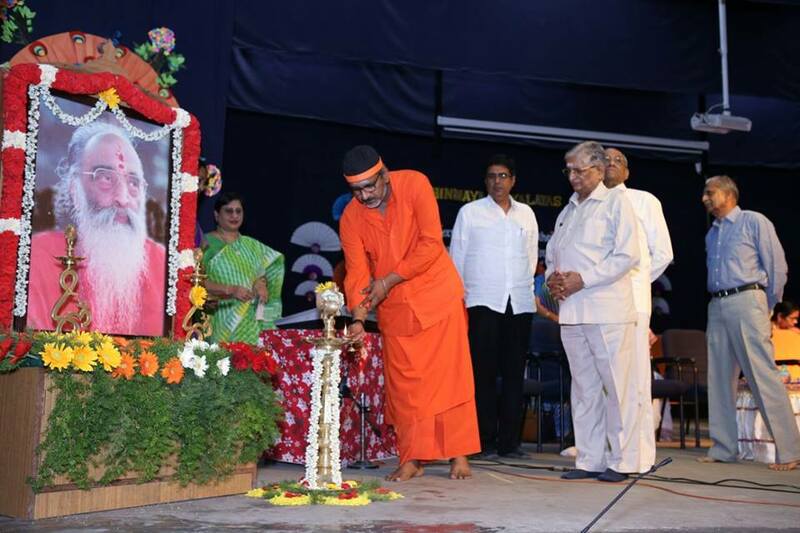 H H Swami Mitrananda presided over the various activities performed on stage in connection with the Guru Aradhana day. 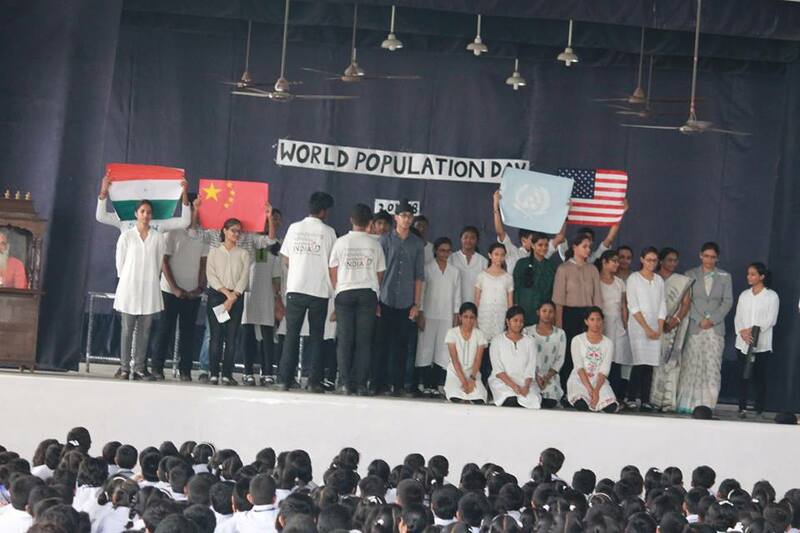 Earth is the only known planet to live, let it be spacious” World Population Day was observed on 31st July in our school, as an initiative to create awareness on the burning issue of over population. 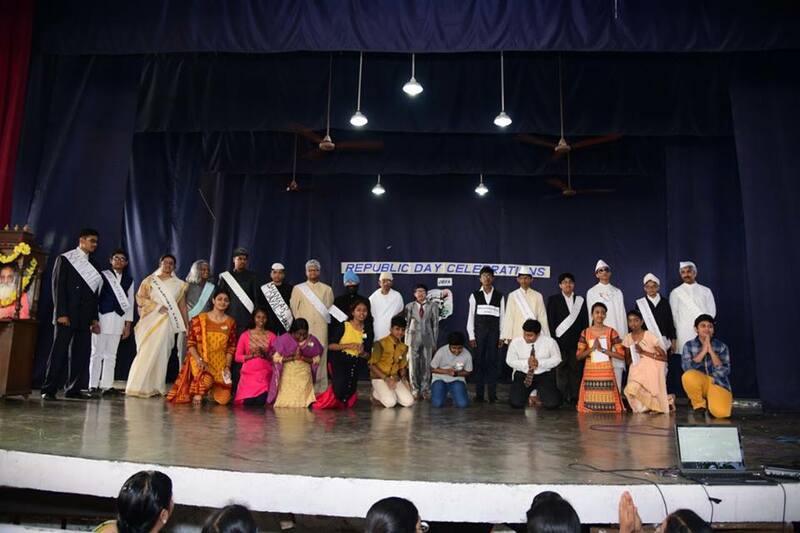 A skit was presented by the students of Class XI- C in which the problems faced by the society due to overpopulation and their possible solutions were depicted. 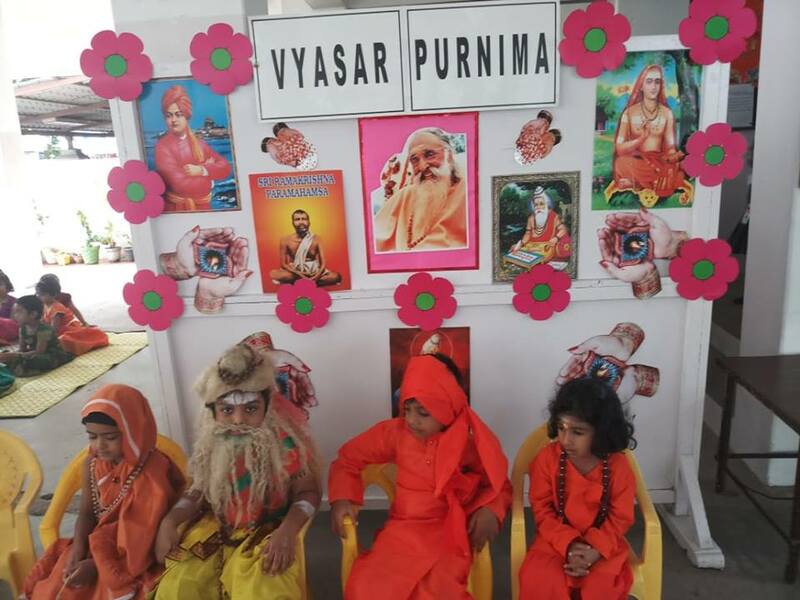 Guru Purnima day was celebrated at our Vidyalaya on 27.7.2018 to remember the great Guru Veda Vyasa. 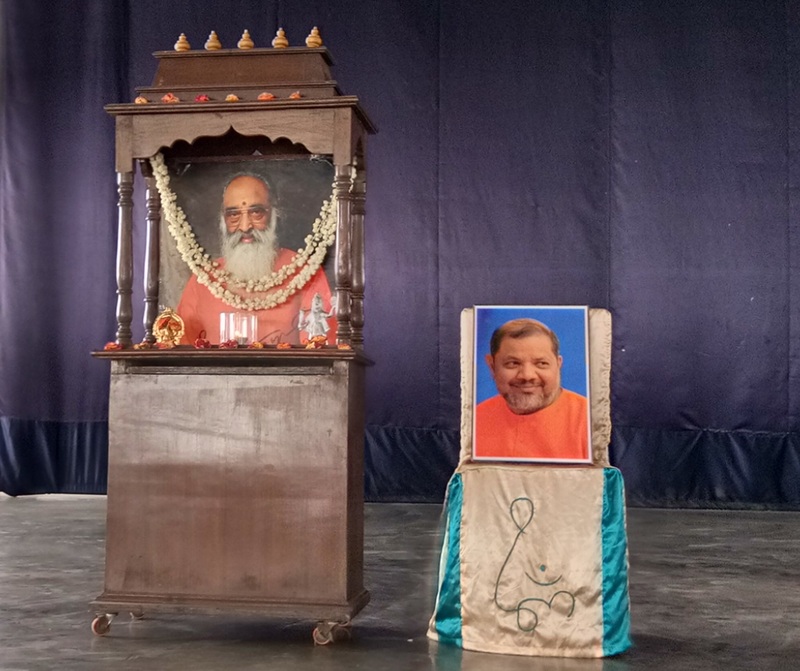 The programme started with a prayer song, our Sanskrit teacher chanted Vyasa ashtothram, children chanted Guru stotram and Kruthagnatha written by our Guruji. 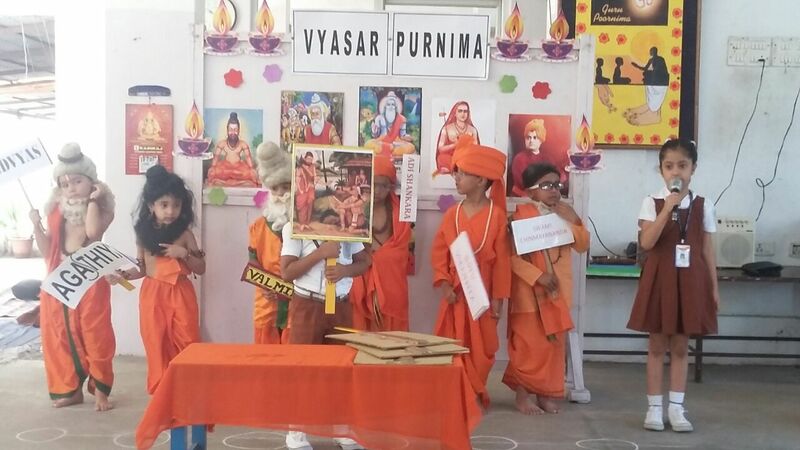 Students from std III, IV and V presented a skit on the life history of vyasa. 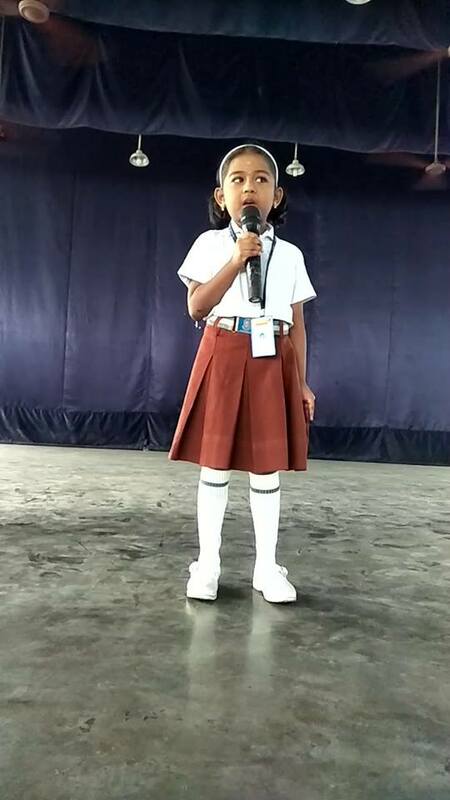 Special CCA activities like Elocution and essay writing were done for the primary classes on the topic “Parents as your Guru”. 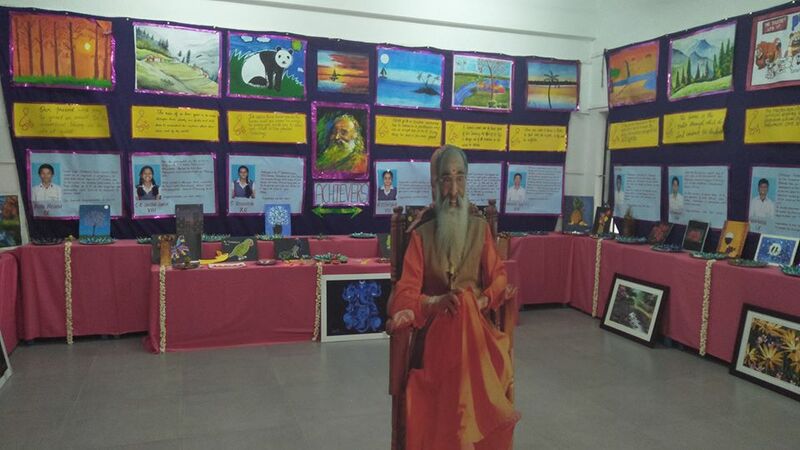 Middle school students did a collage on the topic “Guru Parampara”. 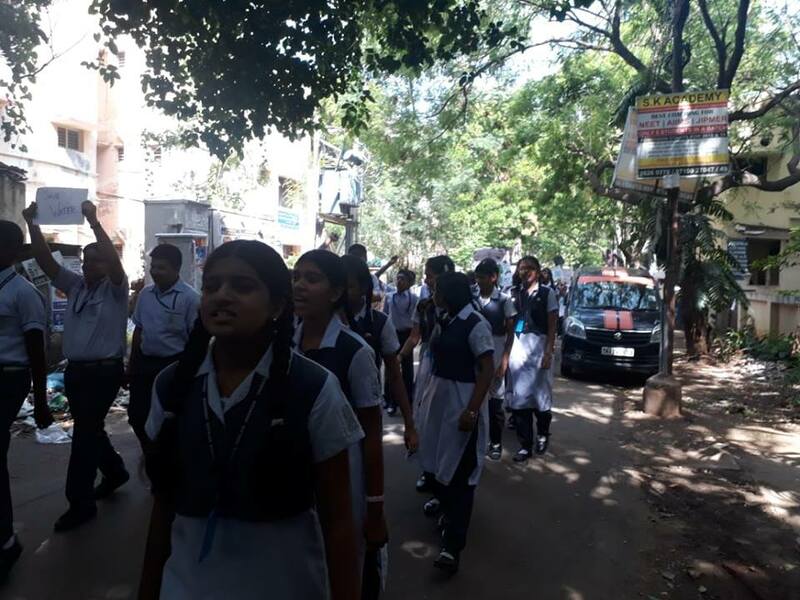 Environmental protection by seva students The students of class VIII as a part of their seva project, took part in a rally on 5th July 2018 to save water. 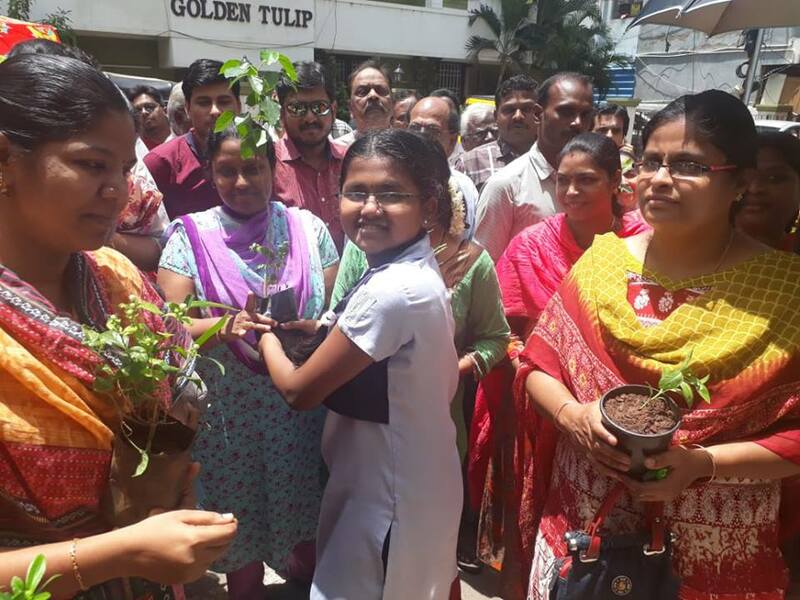 Various activities were conducted in connection with Vanmahotsav week which was observed from 1st July to 5th July. 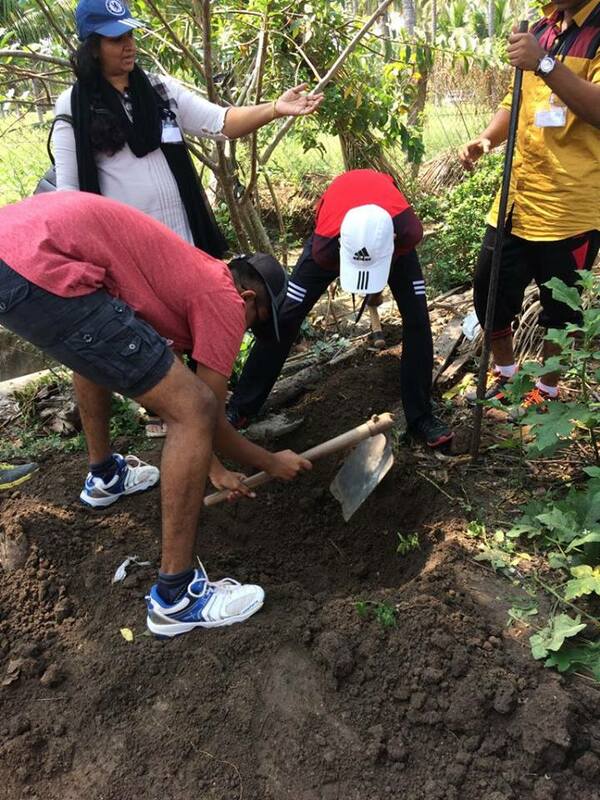 The students became aware of the importance of protecting and preserving the environment for a better living and create a better society. 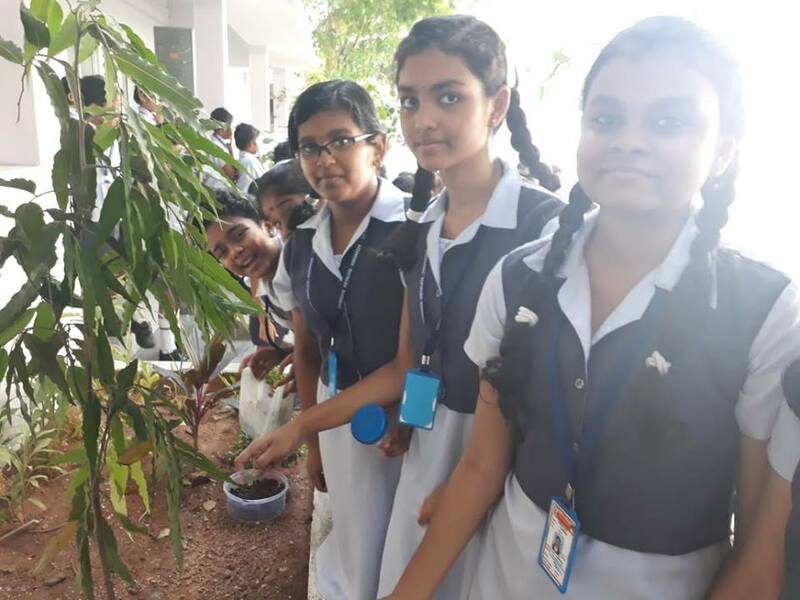 The students of class VII & VIII planted saplings in the school campus and also distributed saplings in the neighbourhood. 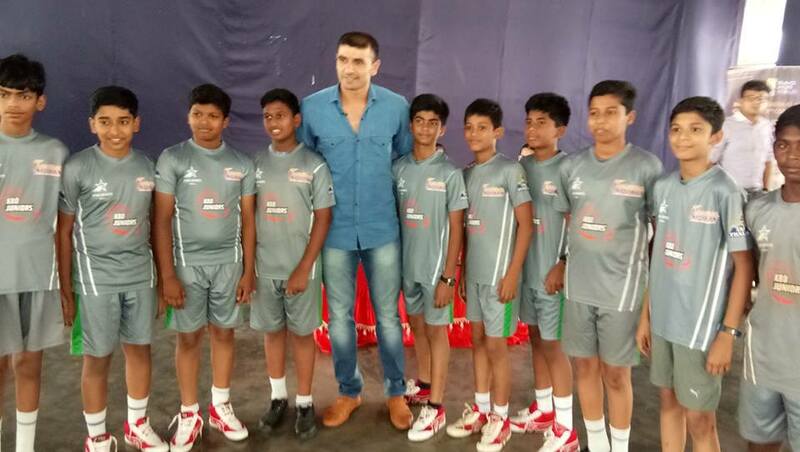 Indian kabaddi Team Captain & Tamil Thalaivas captain (Pro-kabadi) Mr. Ajay Thakur visited our school on 10.7.2018. 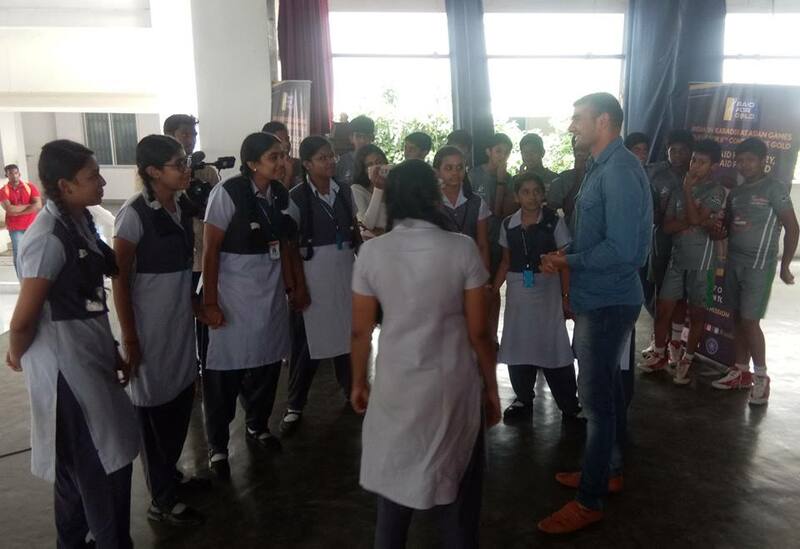 Children were very much thrilled to see the cool & humble captain who has fetched 4 gold medals for India. 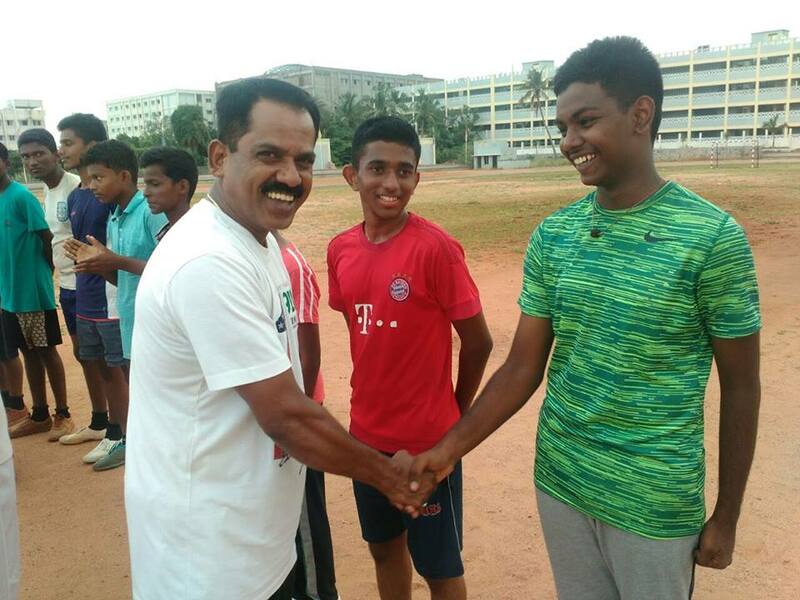 He interacted with the students and taught few techniques & tactics for the junior boys and girls team. 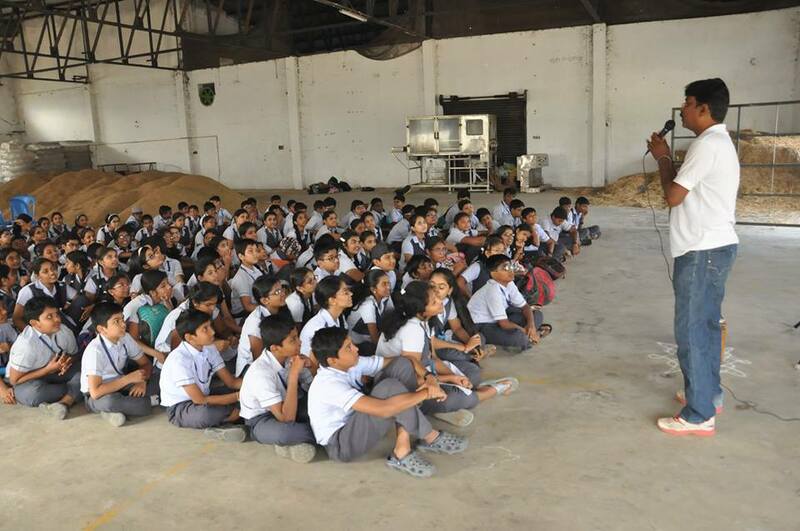 Children came to know about a star player and his excellence. 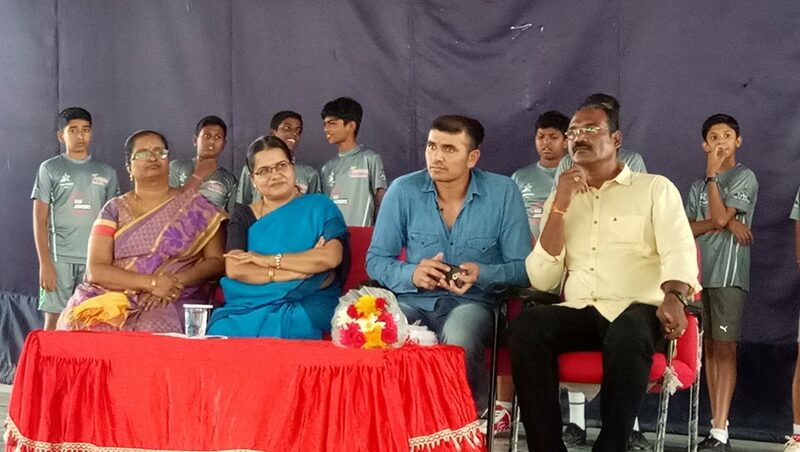 They also came to know about the game “Kabaddi” and its importance through out the country. 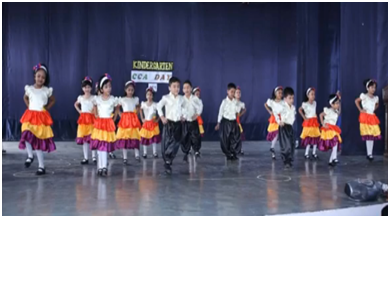 Children are highly motivated to participate in the higher level of tournaments. 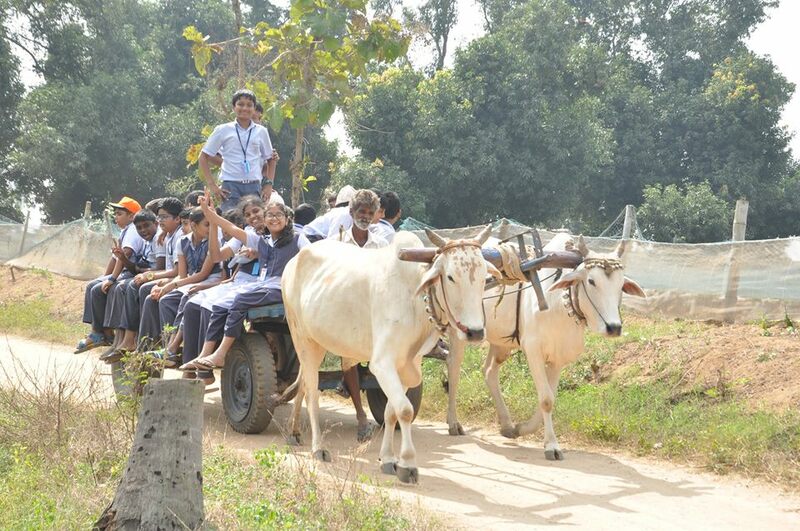 Siddhabari - It was a trip to be cherished for a life time. 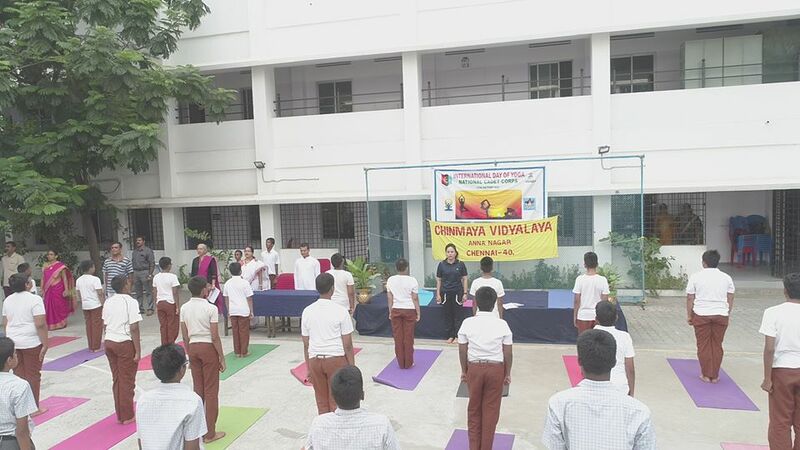 Teachers from all over the Chinmaya Vidyalaya were part of the program. 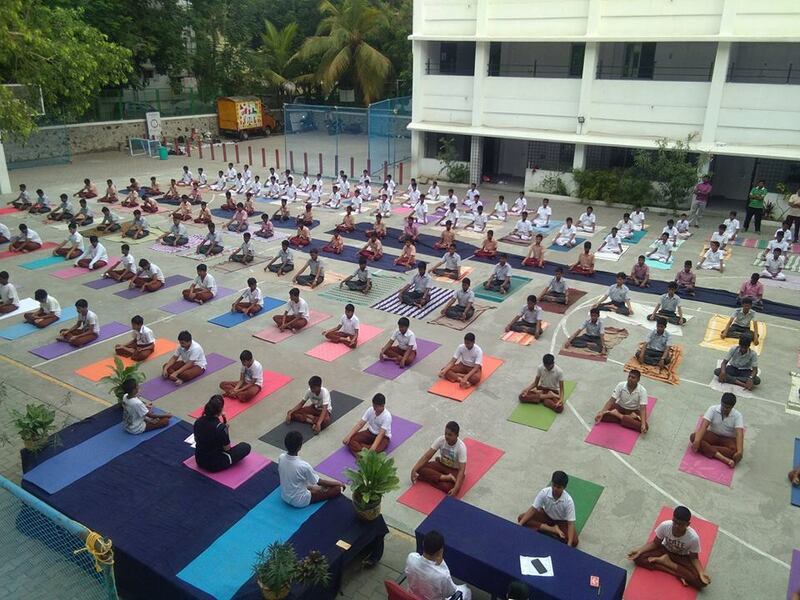 World International Yoga day was observed in our Vidyalaya on 21.6.2018 at 6.30 a.m. Chief guest for the event was Shri M Narendra Founder Shiva Yoga Kendra . 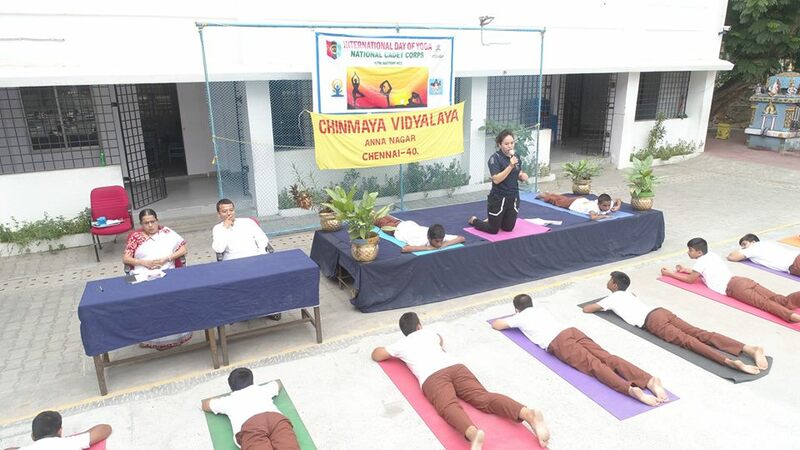 He emphasised on doing yoga to maintain the healthy body & mind. 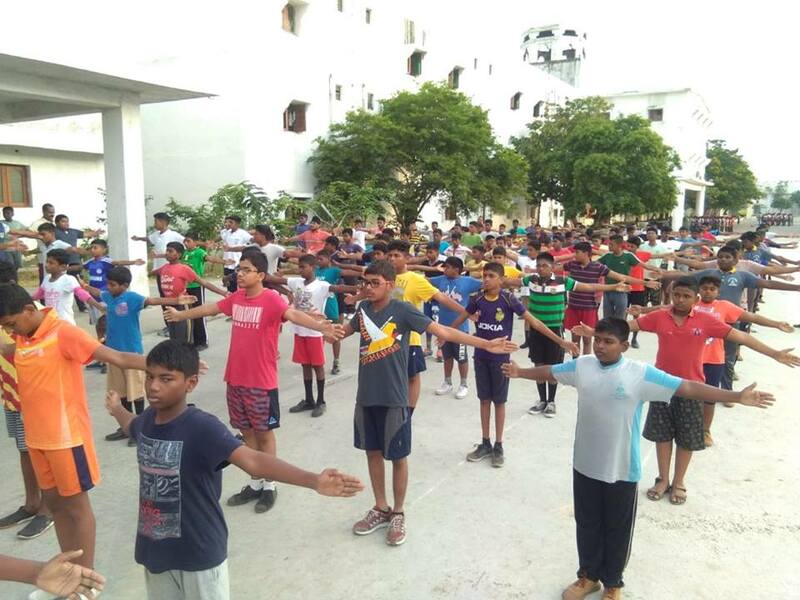 Yoga Teacher Demonstrated the steps in doing the yoga and the NCC cadets followed the same. 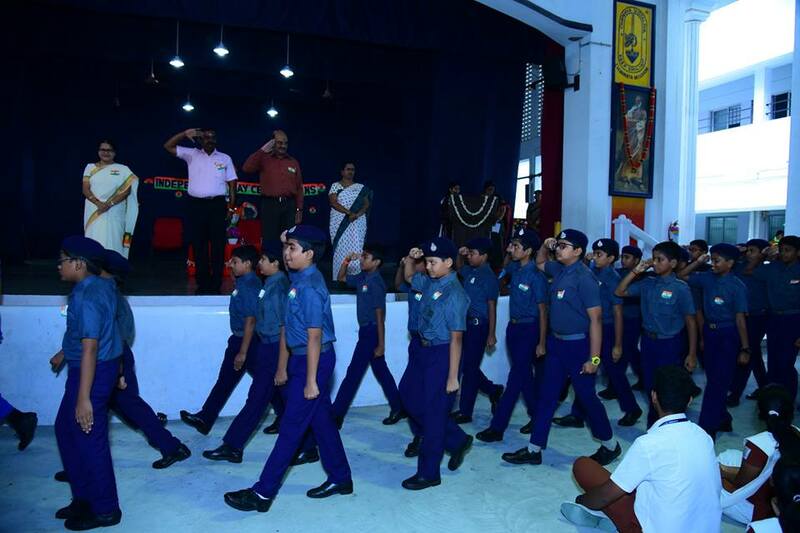 300 cadets have taken part in the above mentioned event. 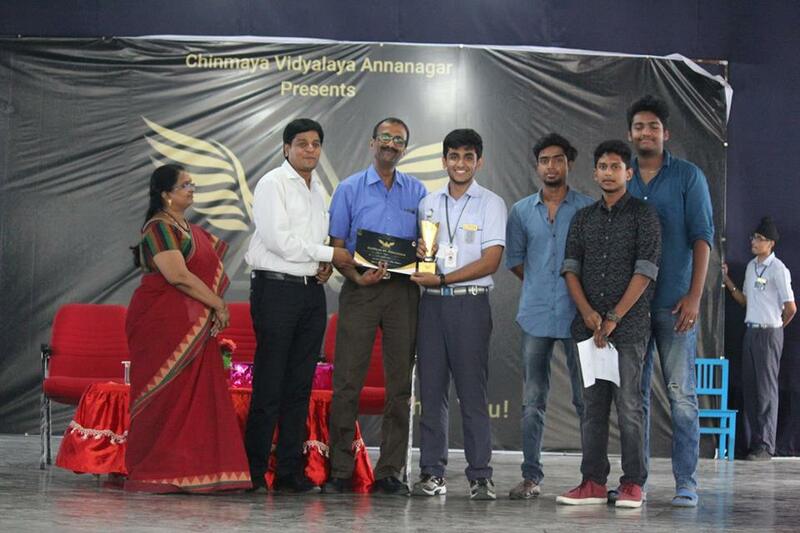 Cadets from Chinmaya Vidyalaya, Anna Nagar, DAV school Mogappair, Government higher secondary school Villivakkam, Sethubaskara higher secondary school Ambattur and Vel tech Engineering College Avadi were the participants on this great event. 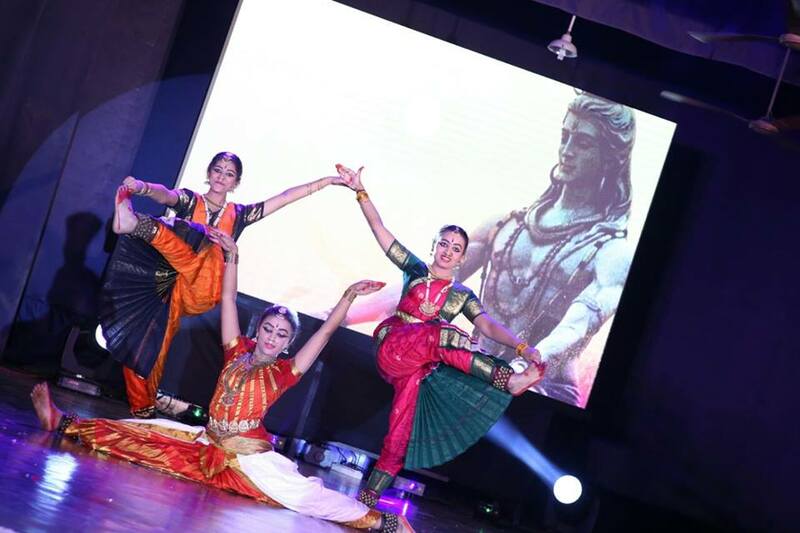 The entire team performing yoga in the early morning was cynosure to the audience and was very effective. 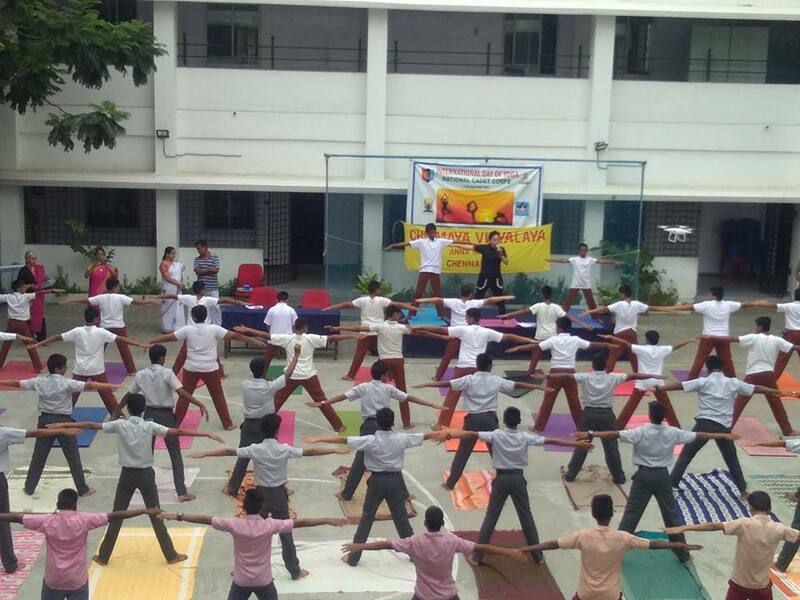 Students also promised to do the yoga regularly after the yoga day. 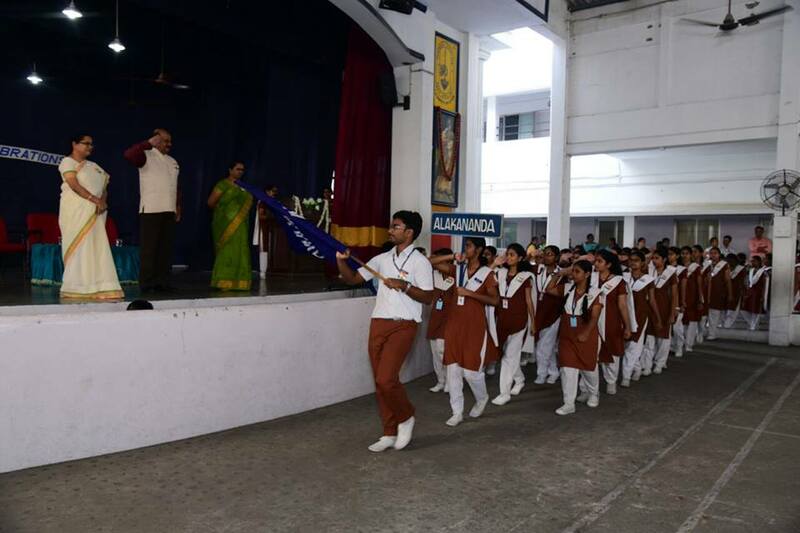 The Investiture Ceremony of the student Council members was held on 21st June 2018 at the school auditorium. 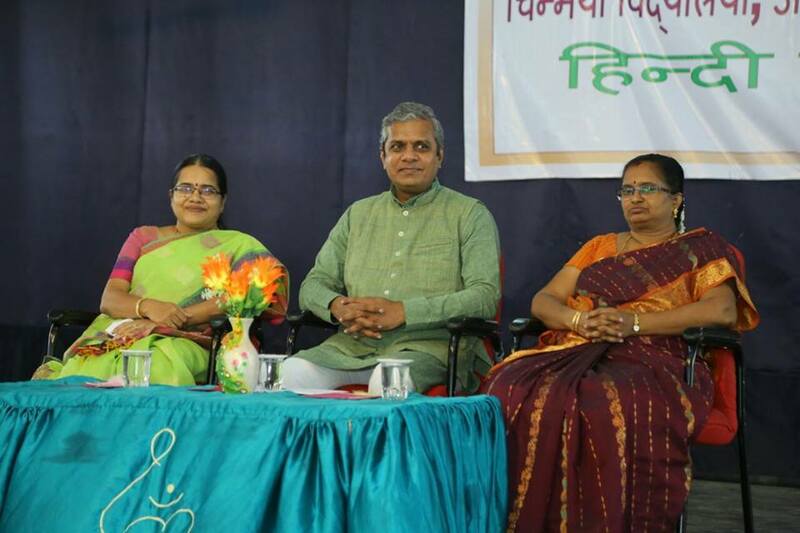 The Chief Guest for the function was Shri. 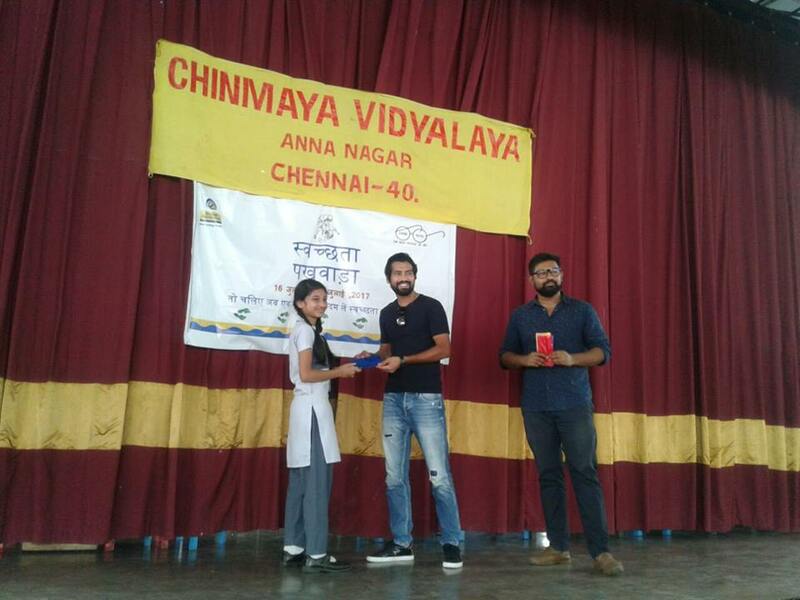 R. Suryakumar, Hon.Correspondent, Chinmaya Vidyalaya, Anna Nagar. 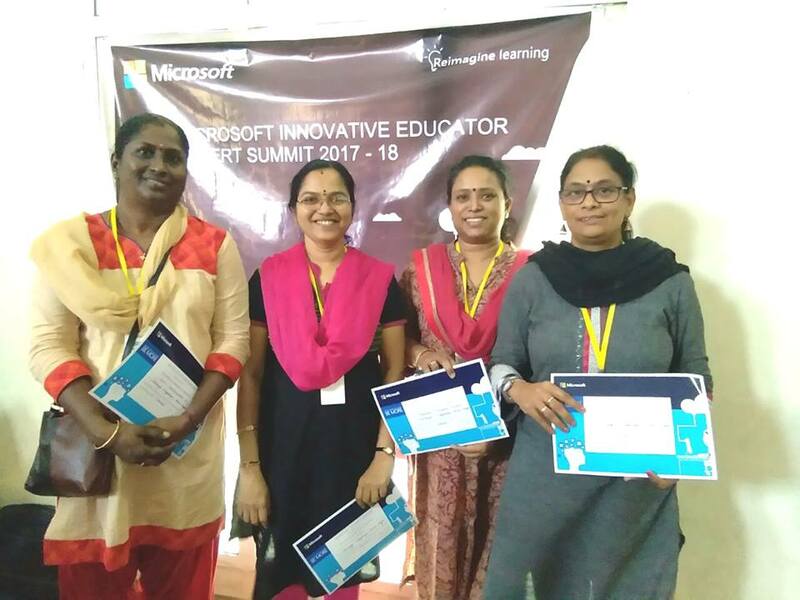 Our teachers Mrs. Latha.T, Mrs. Devi Senthilkumar, Mrs. Renuka Krishnakumar and Mrs. T. Hemamalini attended ‘Microsoft Innovative Education Experts’ (MIEE) Meet in Chennai on March 26th 2018 (Monday) at Mahindra World School, Chengalpet conducted by Microsoft. 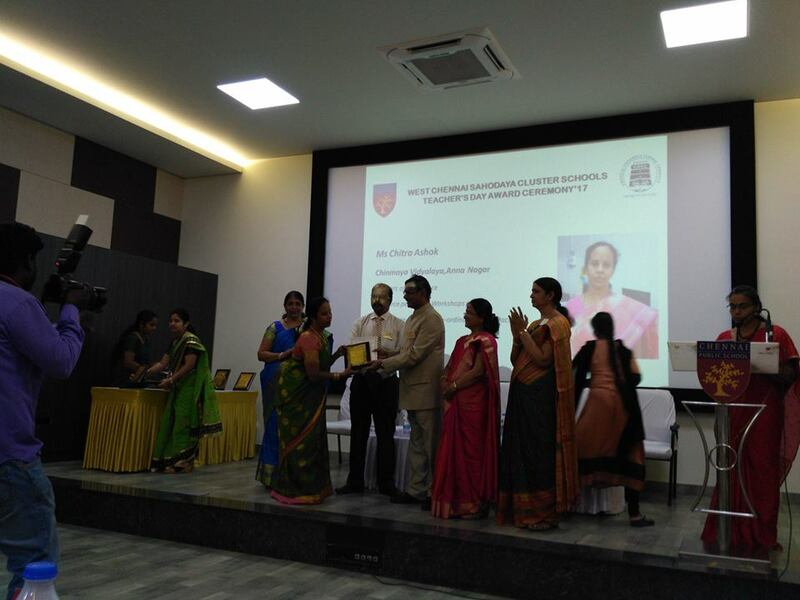 This meet was offered to all MIE experts in Chennai and the objective was to provide an opportunity to develop professional skills using cutting edge techniques, innovation practices and collaboration in education by MIE Master Trainers and these teachers are excited to be a part of their journey in creating an environment of innovation in education using technology. 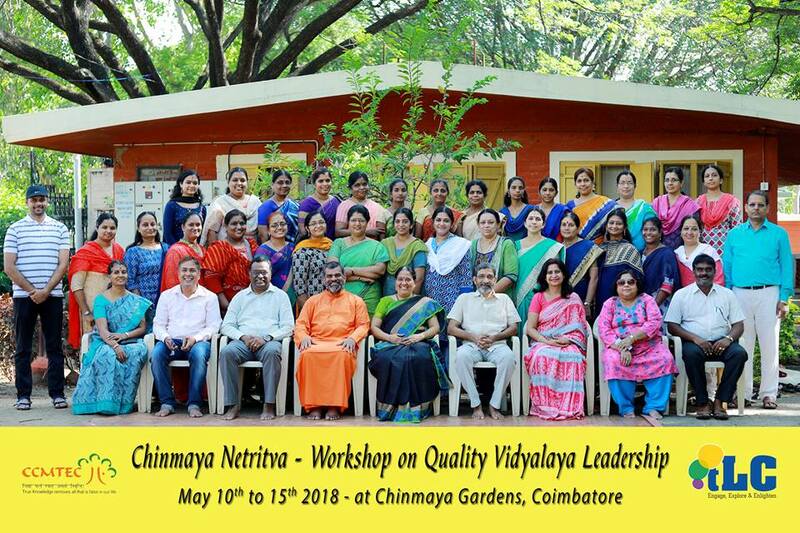 Workshop on Quality Vidyalaya leadership “Netritva-VII” was held in the month of May from 10th to 15th 2018 at the Chinmaya Gardens, Coimbatore. 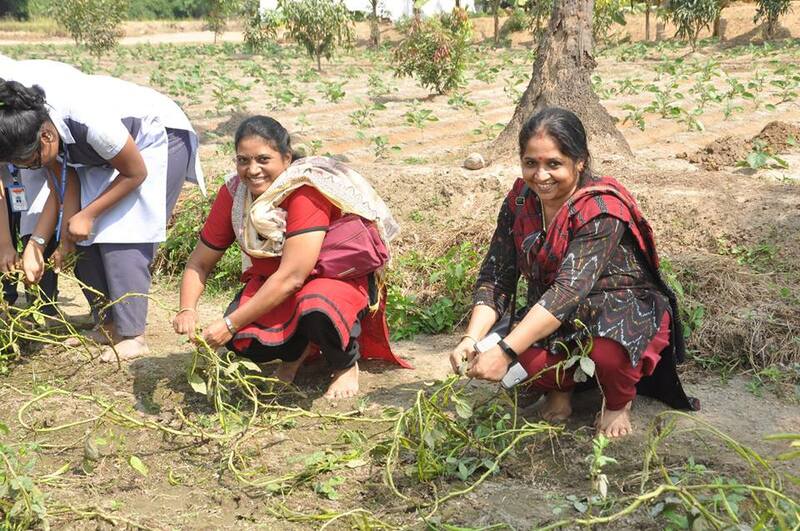 Mrs. Usha Joseph and Mrs. S.K. 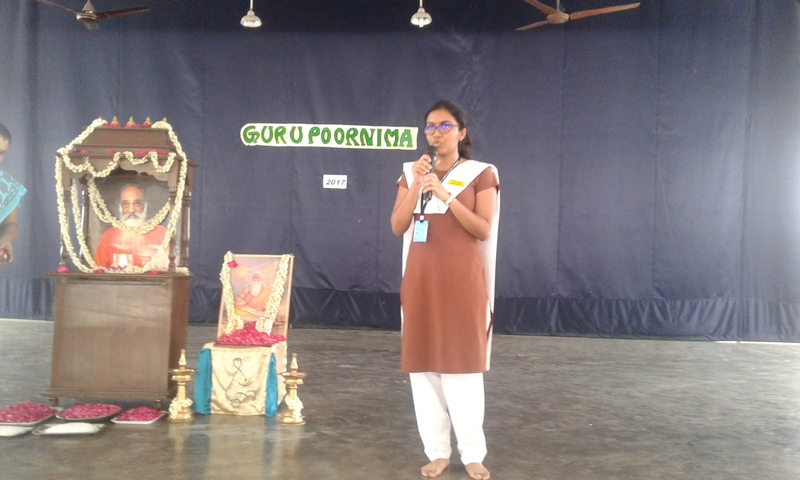 Prameela attended the same. 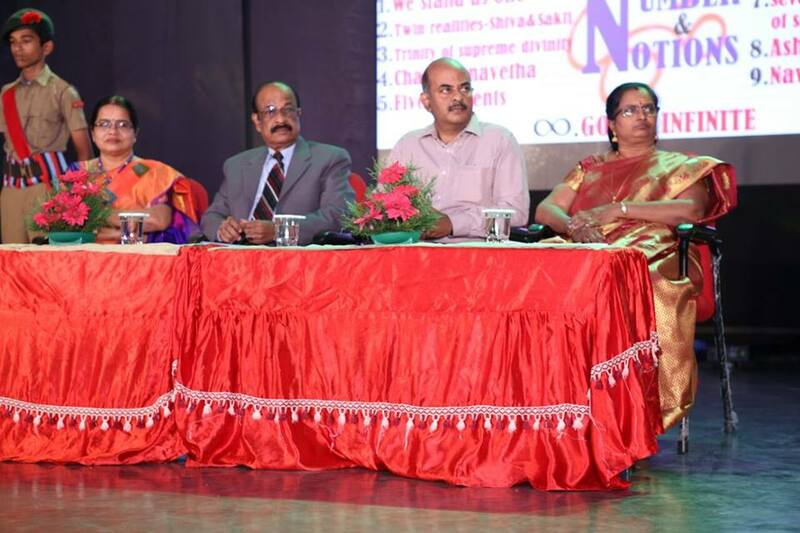 The faculty for the program was Dr. A Senthil Kumaran and Mr. R. Subramanian. 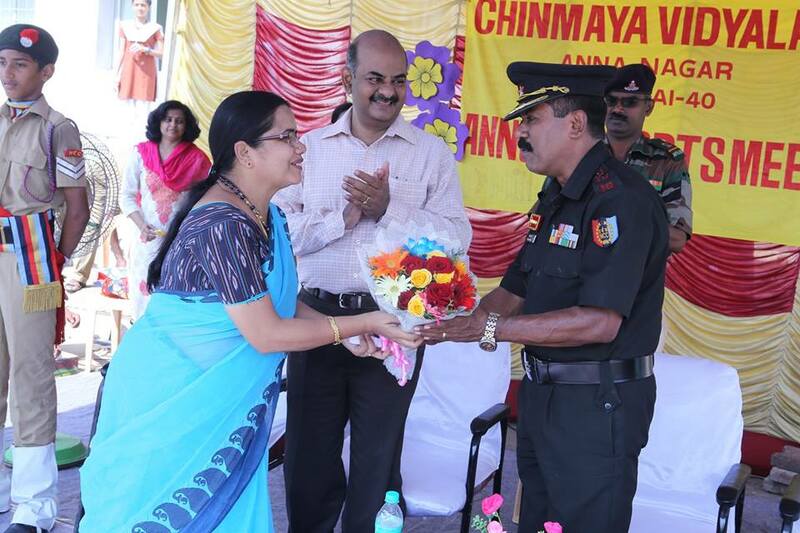 NCC camp for the year 2018 – 19 was held in Satyabama College. 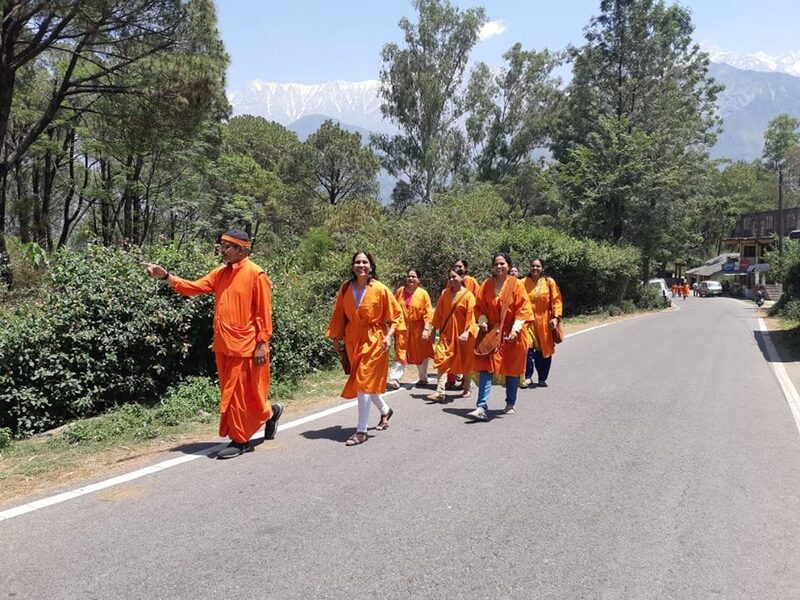 The camp was held from 21st to 30th of May. 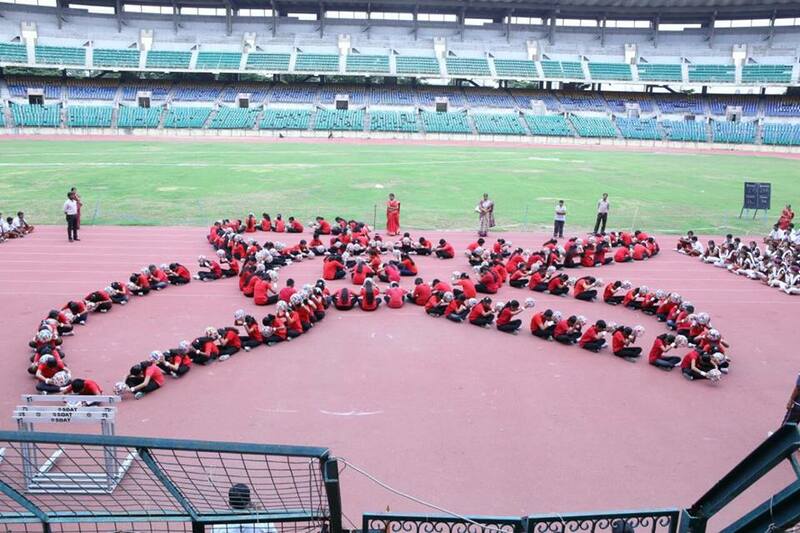 Children from all over Tamil Nadu came to attend this Combined Annual Training Camp. 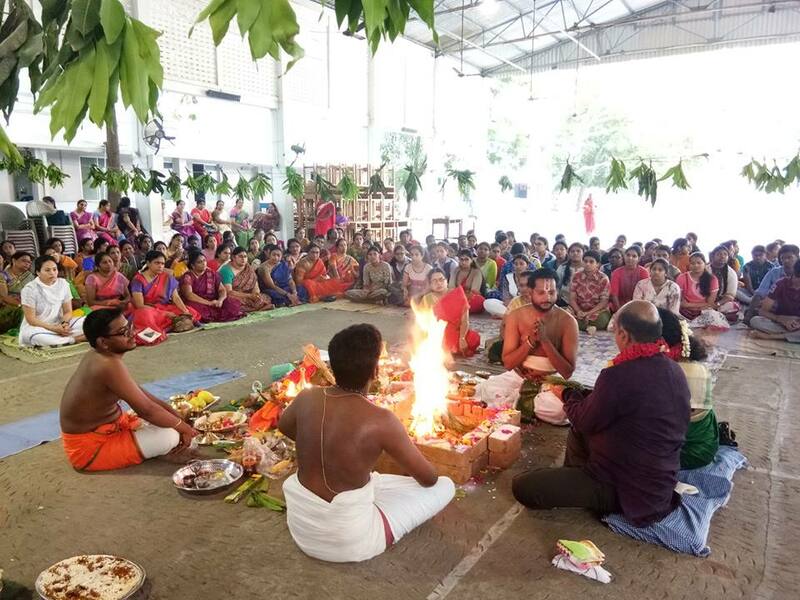 Havan is one of the most important rules laid down in the vedic scriptures for householders and is a part of the external sanatana Dharma. 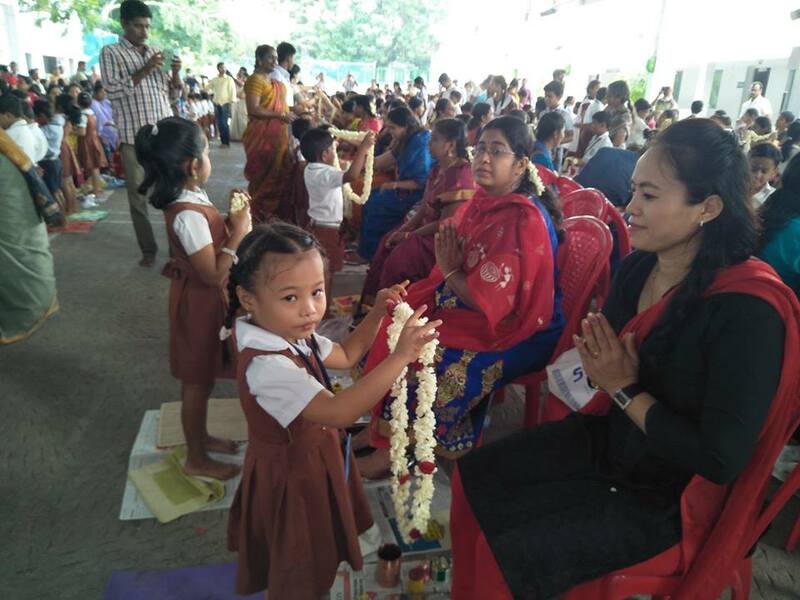 Ganapathy homam, Hayagreeva homam and Dhanvantri homam were conducted on our school campus on 27.4.2018 to ensure health, long life and spiritual well being of everyone. 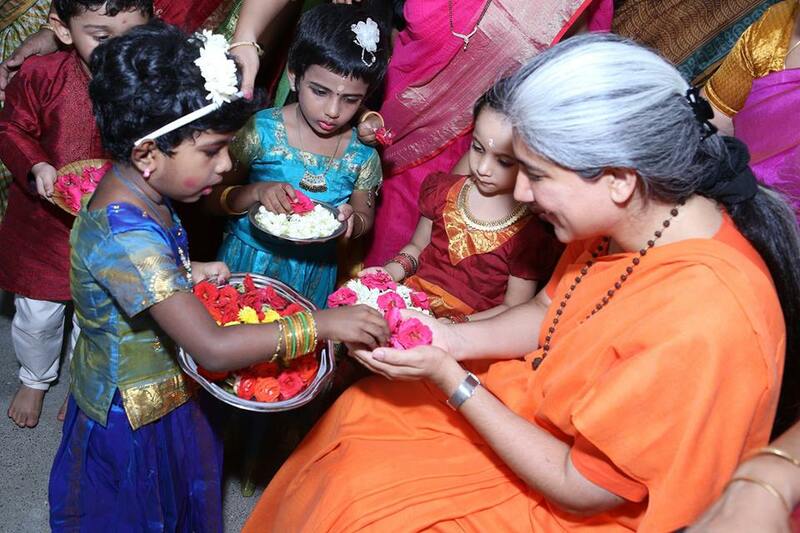 Havan purified the entire atmosphere and left a divine impression in everyone’s heart. 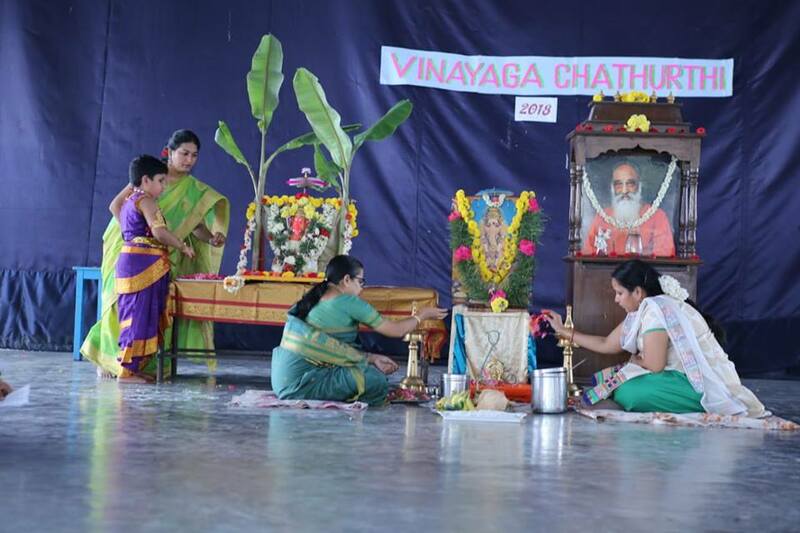 Holy verses chanted during the havan, relaxed everyone’s mind and brought them closer to god. 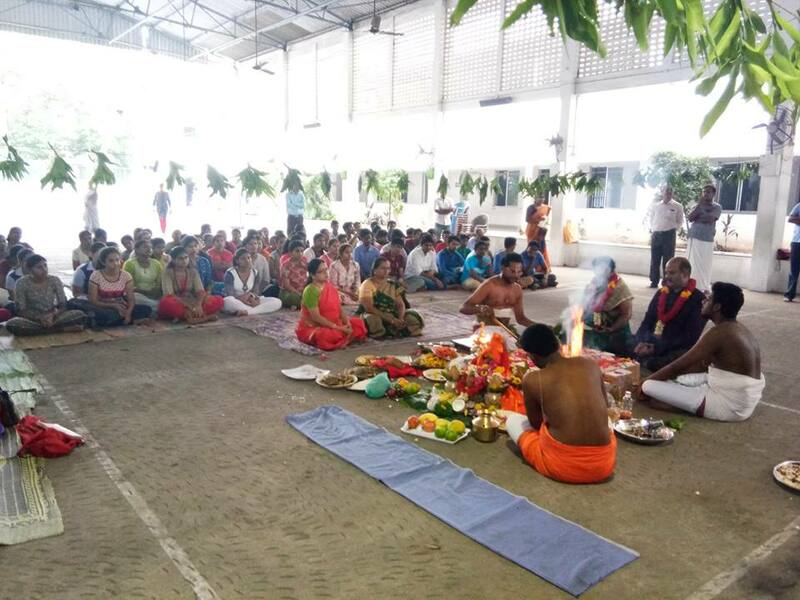 It was a nice opportunity for the teachers to come together on one family and perform the pooja. 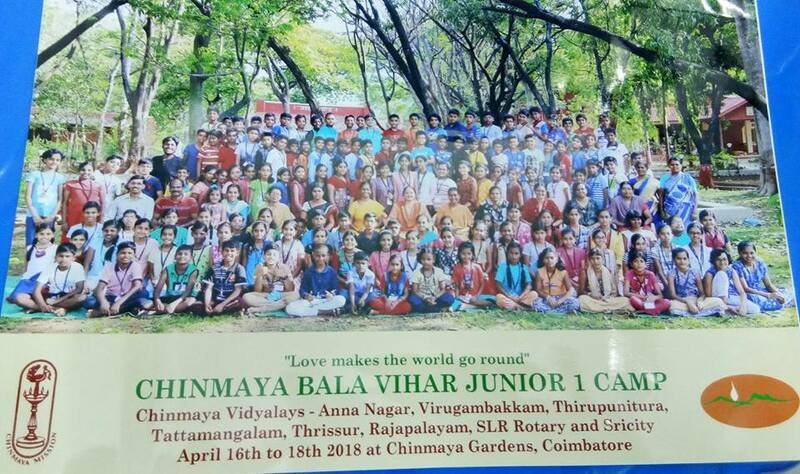 Junior Balavihar camp was conducted from 15.4.2018 to 18.4.2018 in chinmaya garden, Coimbatore. 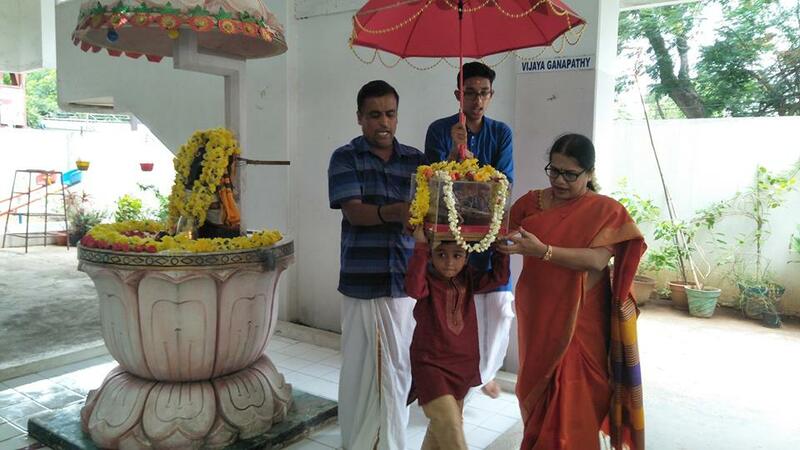 Chinmaya Jayanti was celebrated at Chinmaya vidyalaya Annanagar on 08.05.2018. 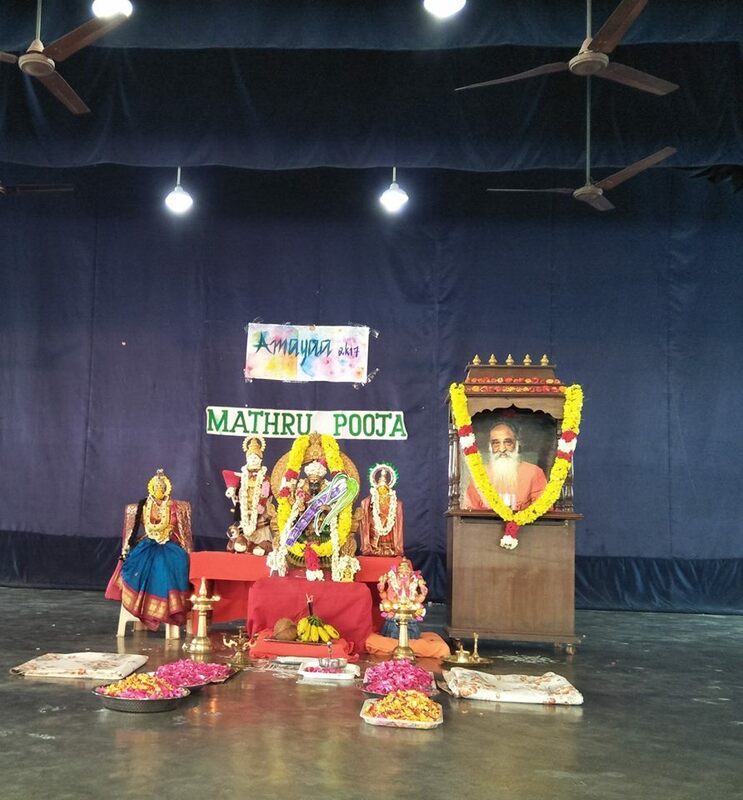 Sanskrit Teacher Mr. Kannan & Mr. G P Ravi chanted Guru Stotram , Guru Ashtothra Namavali, Guru Paduka stotram . 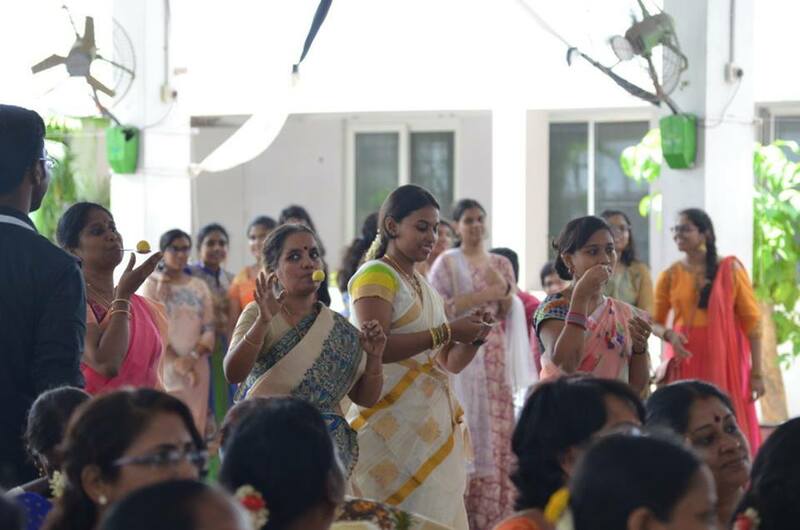 Few Bhajans on Gurudev was rendered by all the teachers assembled for pooja. The entire atmosphere was so serene and filled with spiritual divinity. Let us all invoke the Gurudev’s blessing. 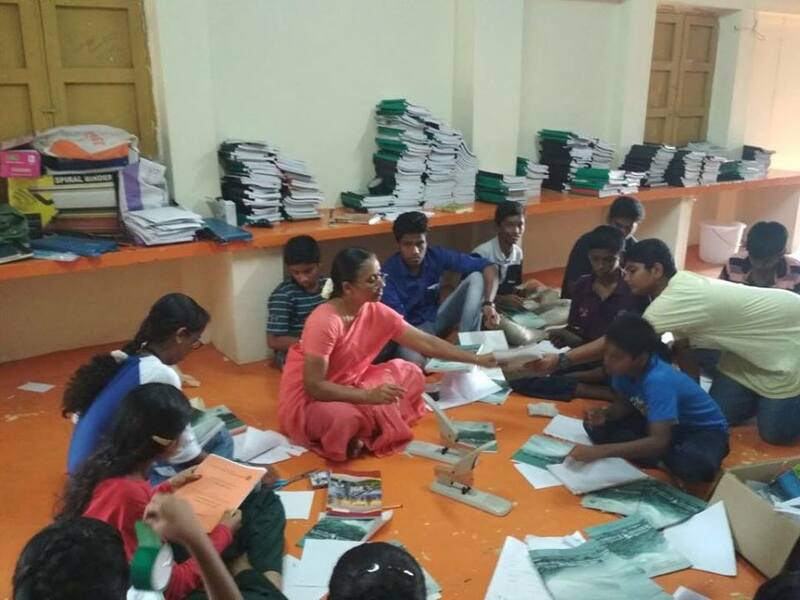 CCMT EC organised the VI Annual Hari Seva camp at Chinmaya Gardens, Coimbatore from 24th April to 28th April 2018 in which 144 students from 15 CVS and vision schools learnt the art of contributing to the society selflessly. 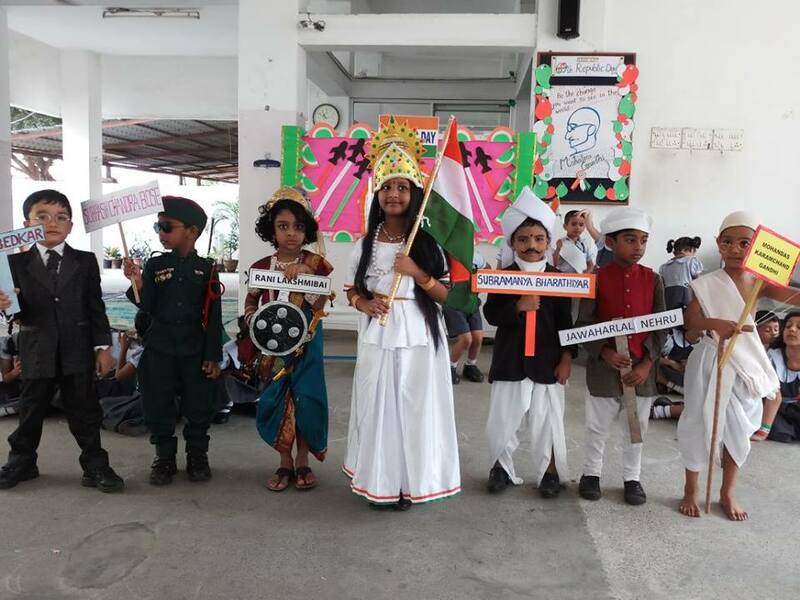 On 26.01.2018 Republic Day was celebrated in a grand manner in the school premises. Our Correspondent Shri. 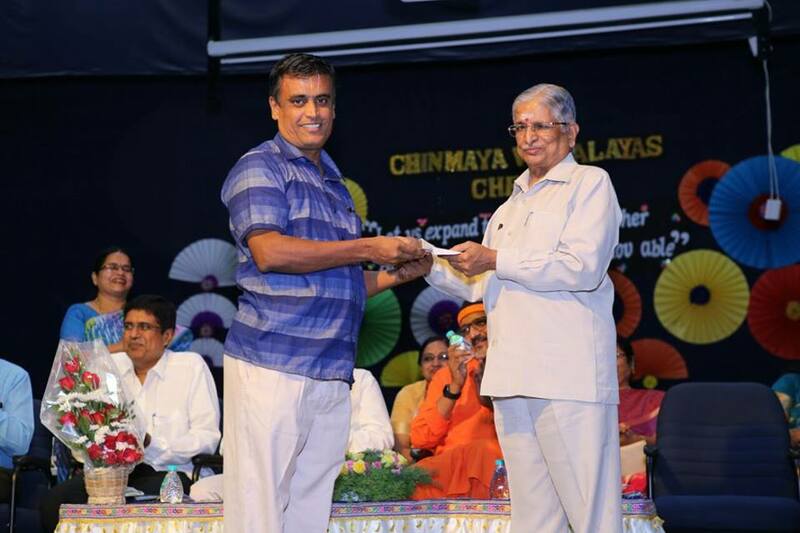 R. Suryakumar was the Chief Guest. 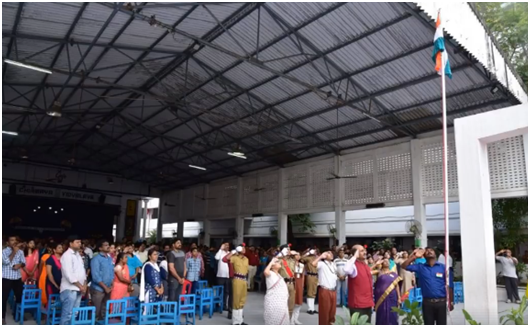 The National flag was hoisted followed by the march past. 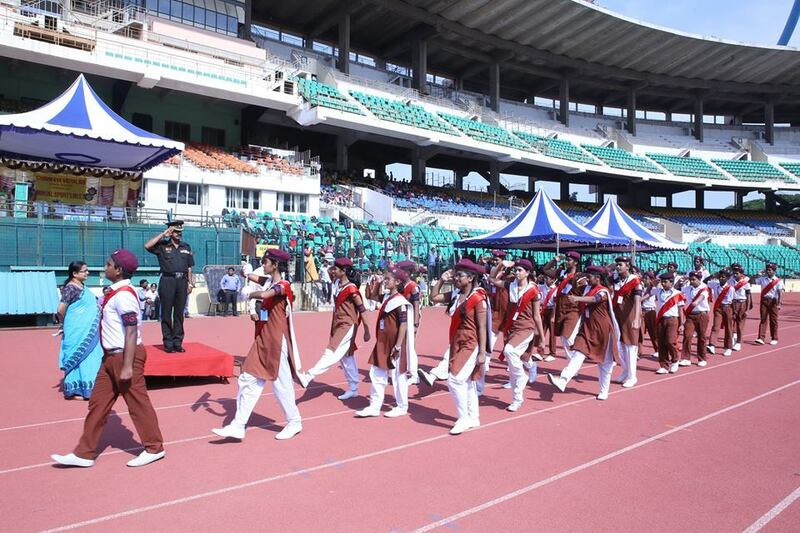 NCC cadets, RSP, Scouts and Guides and different houses of the school participated in the march past. 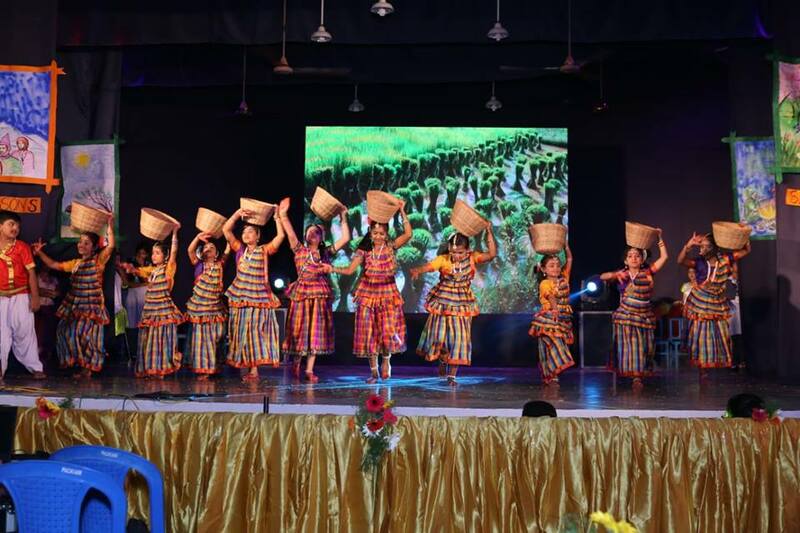 The Cultural program showcased by the social department projected the Social evils like child labour and deforestation. 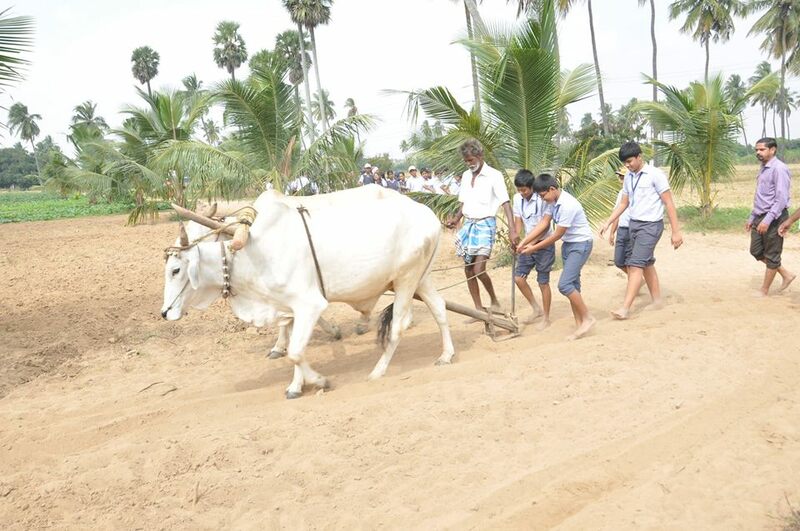 They also focussed on the importance of farming and compulsory education till the age of 14. 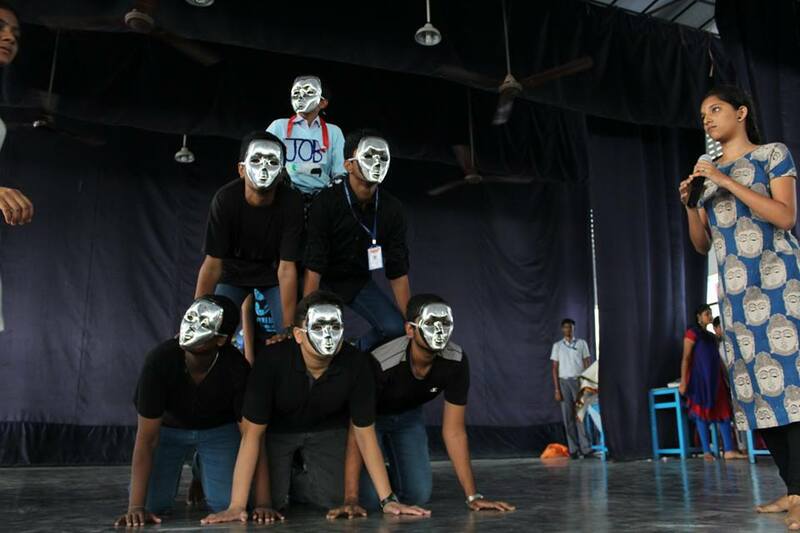 The Tamil skit detailed about the importance of the day and also briefed about the 14 presidents of the Republic India. 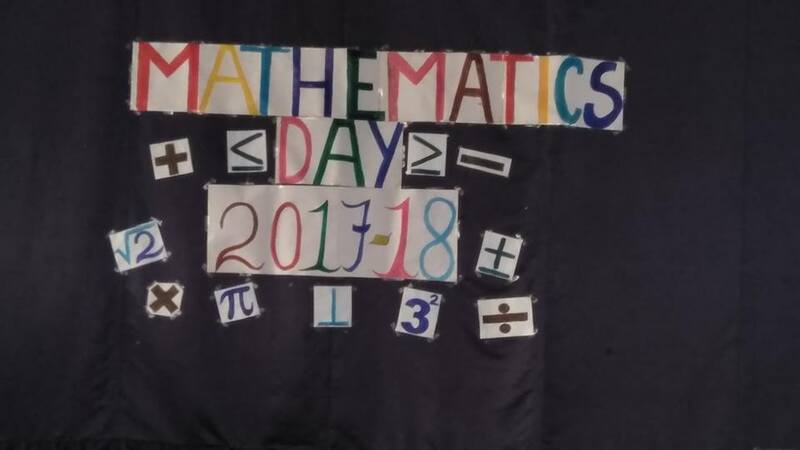 English day was held on 30th January 2018 in our school auditorium. 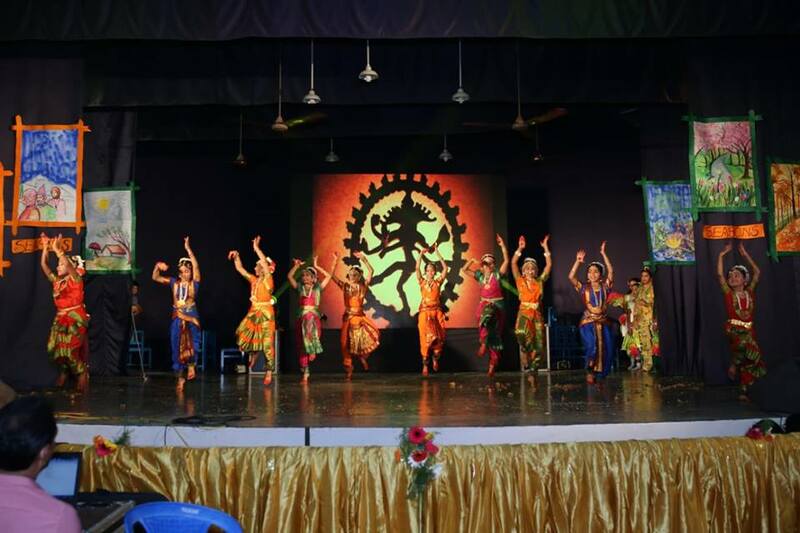 It was a mega event where students from all classes had taken part. 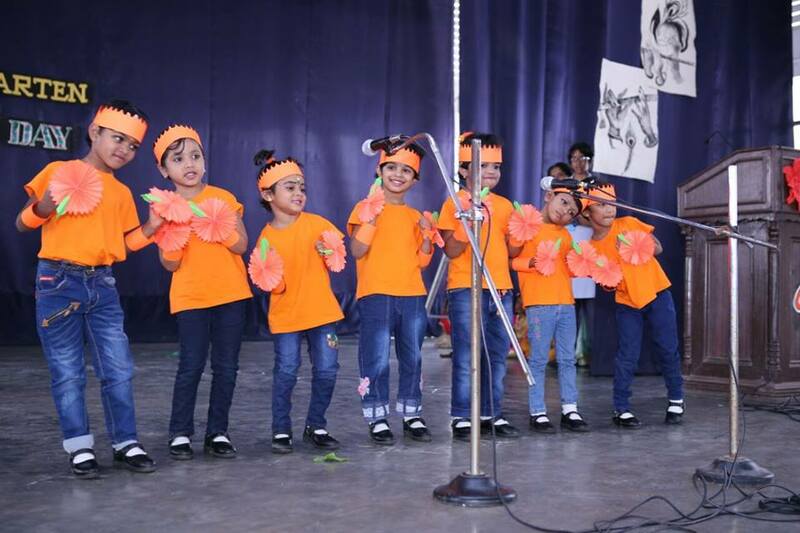 With cute little toddlers performing a masquerade, to an innovative flocabulary and the gripping role of Macbeth, which kept the audience craving for more. We re -lived the Shakespeare Era for a short time. We could feel the rage and the desire of revenge of mark antony from Julius Caesar which was followed by a humorous spoof that made us all laughing. 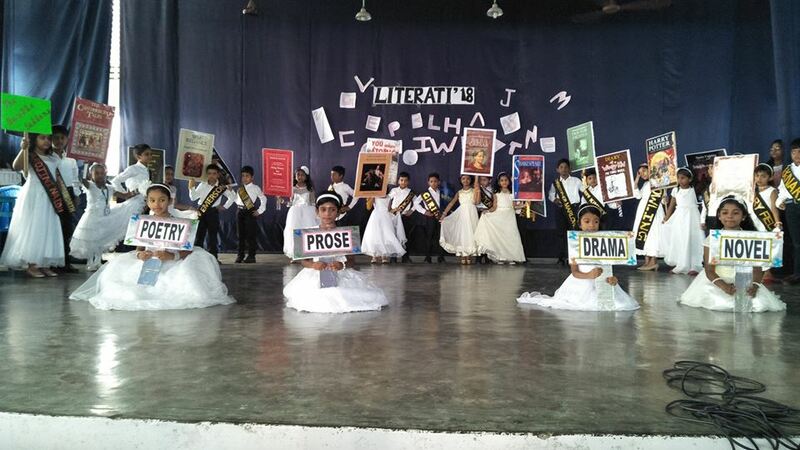 Overall literati 2018 was a grand success and had the audience mesmerised. We look forward to many such events. 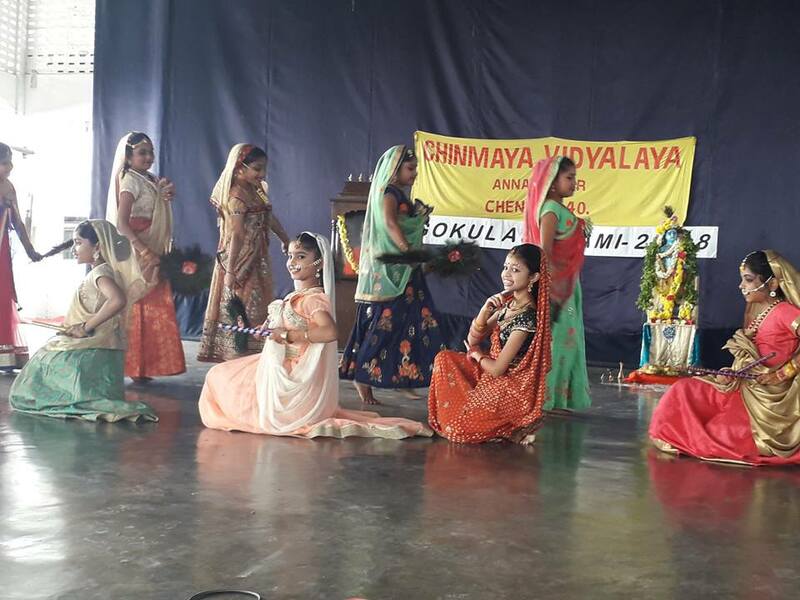 28th Annual day Celebration at Chinmaya Vidyalaya Annanagar on 12.01.2018. 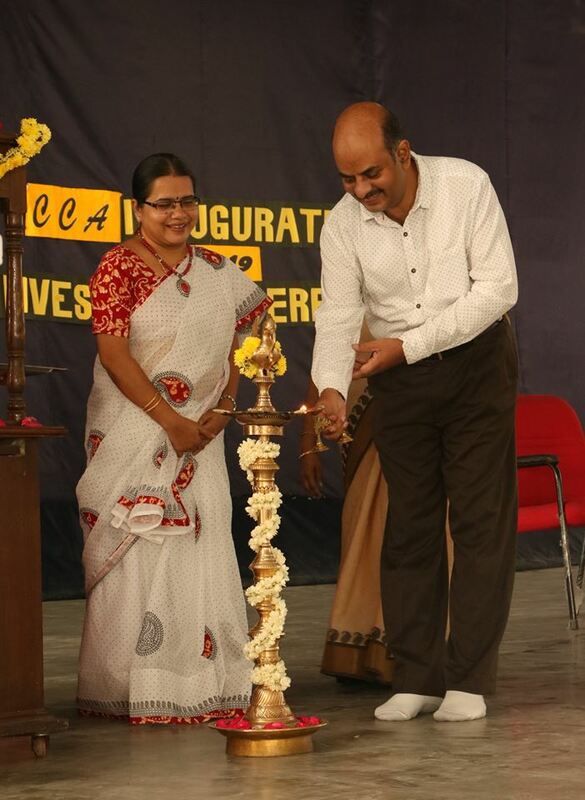 Chief Guest: Dr. E. Ilamathiyan (Director, Amity Global Business School, Chennai-86.). 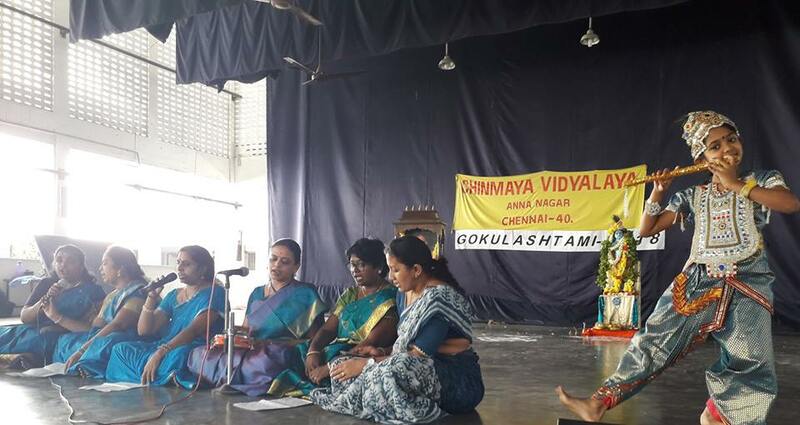 Chinmayavil Thiruvaiyaaru” was held on 19.1.2018 in our music room. 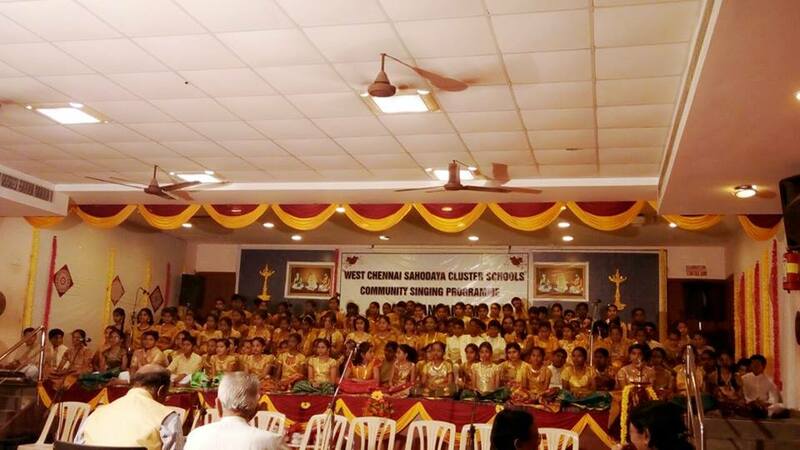 All music students along with the music teacher sang pancharathna keerthanas followed by thiyagarajar krithis. 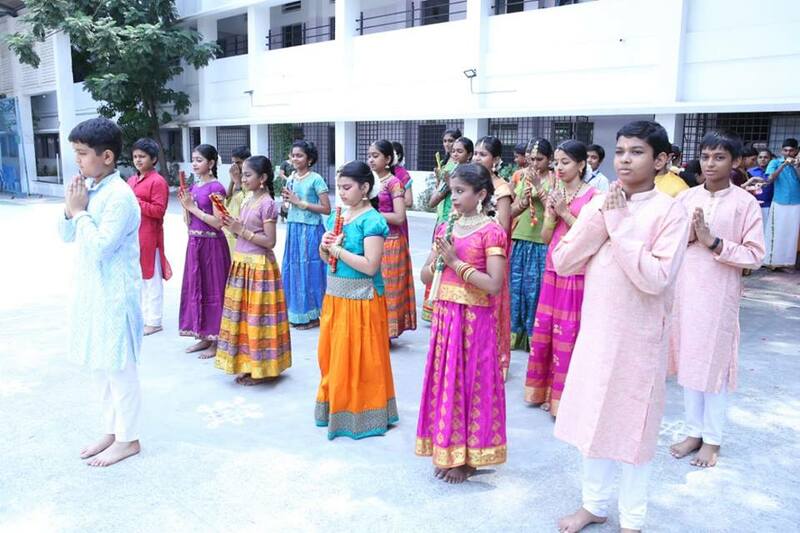 One of our students played violin on Thiyagarajar keerthanai.Whole school was vibrant with the musical concert. 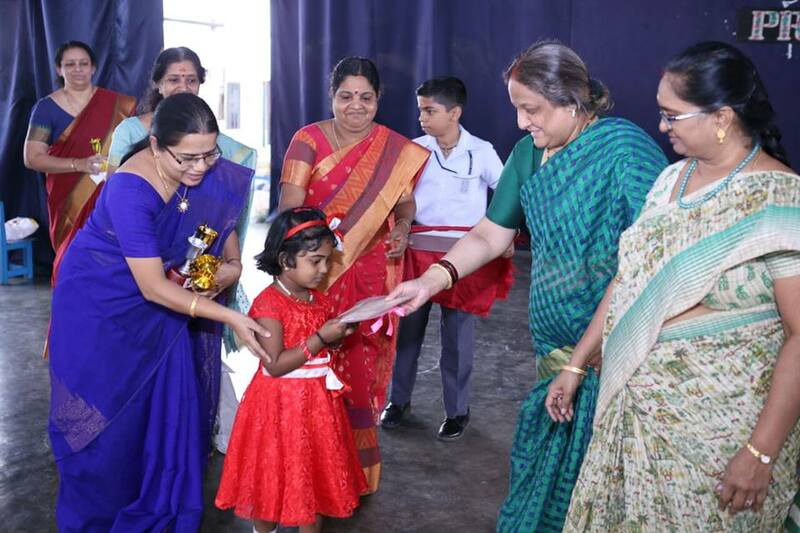 The Annual kindergarten Prize day for the year 2017-18 was held on 23rd January 2018. 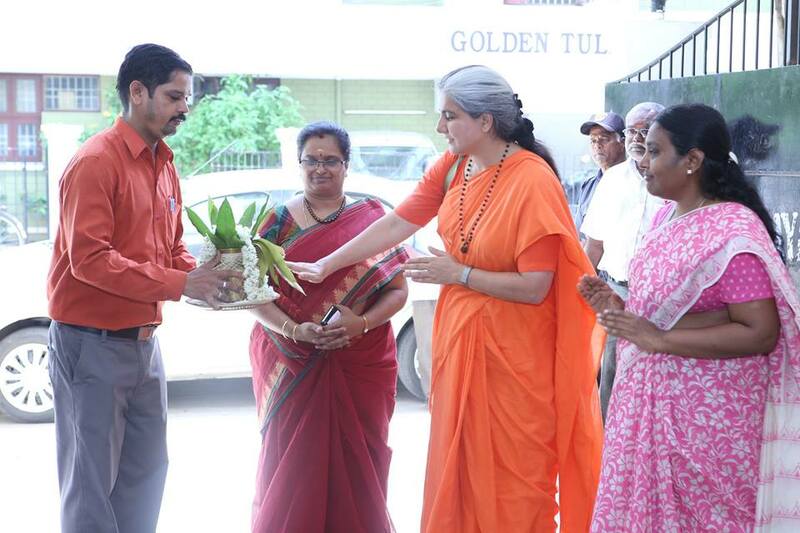 The chief guest for the event was Mrs. Abirami Goel (Parent and former student of Chinmaya Vidyalaya, Taylor's road). The Annual scouts camp for the year 2017-18 was held at Avadi from 18.1.2018 to 22.1.2018. 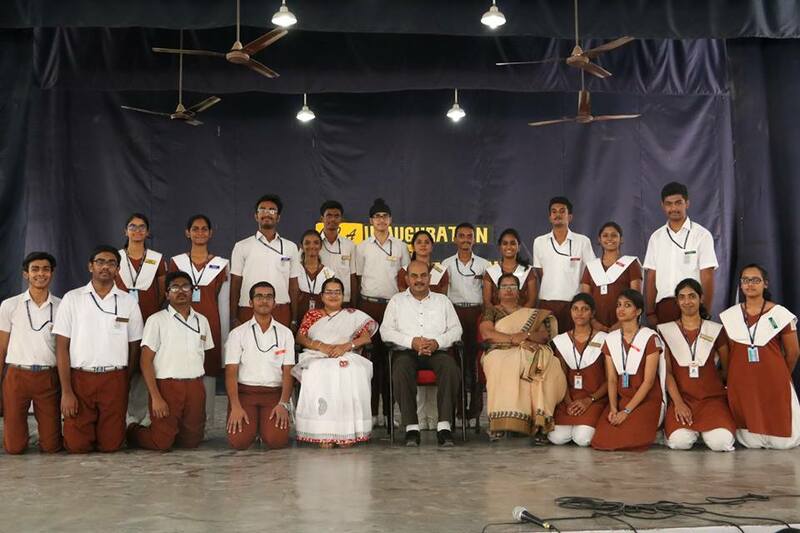 13 students and the scout master Dr. N Srinivasan attended the camp. It helped the scout cadets to learn about different life skills like First aid, Tent pitching, to make the gadgets, and patrol making. 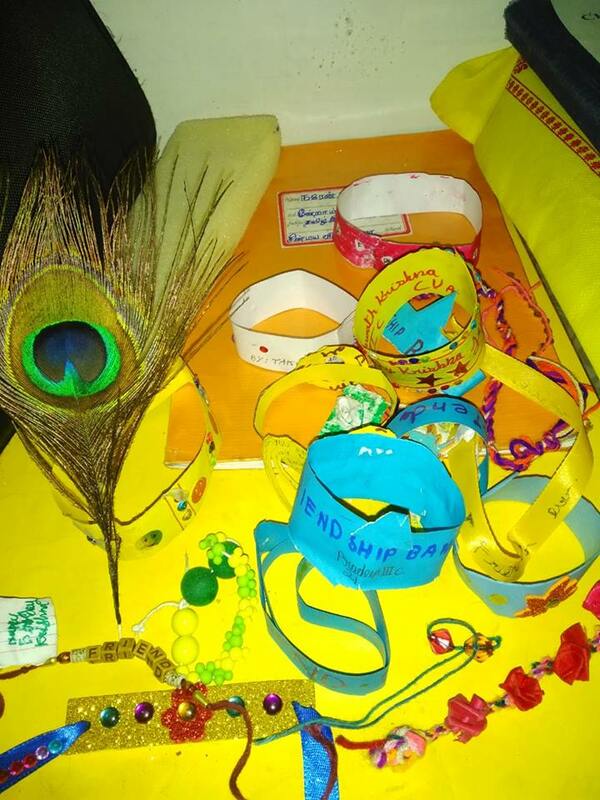 Our school bagged 3rd position in craft competitions. The camp was concluded with camp fire and all campers enjoyed the camp with zeal. 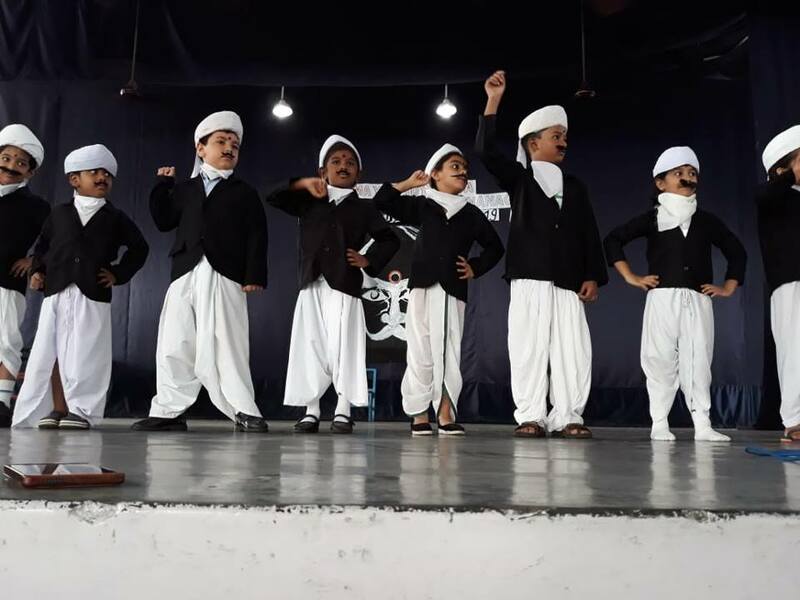 Ganasangamam 2018 was held on 5.1.2018 at Sindhi Model school - Kellys. 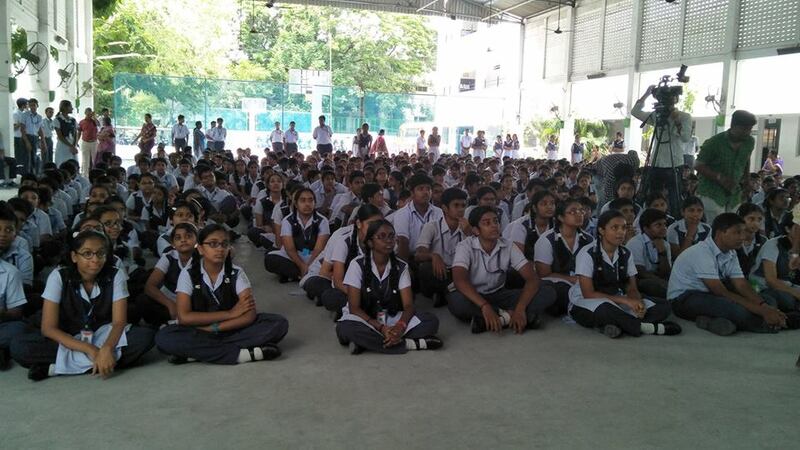 140 students from 18 schools participated in this event. Smt. 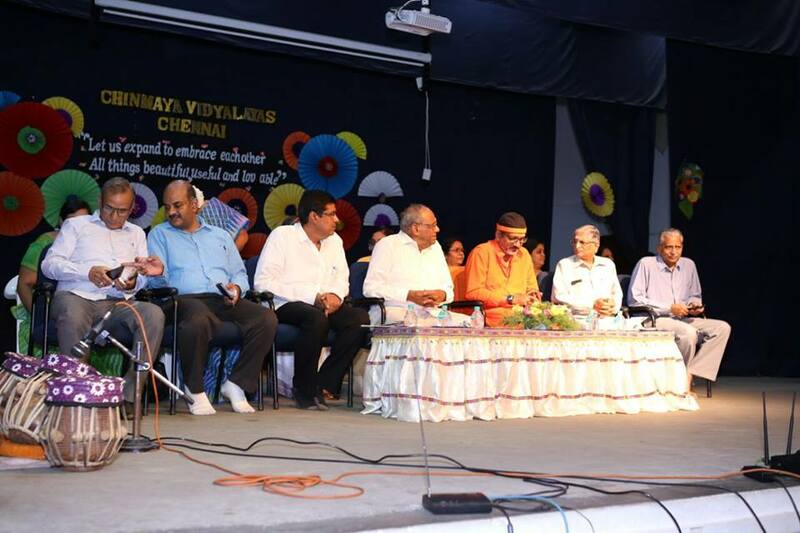 Vasundhra Rajagopal (Eminent Carnatic musician) was the chief guest for the program and kalaimamani Smt. 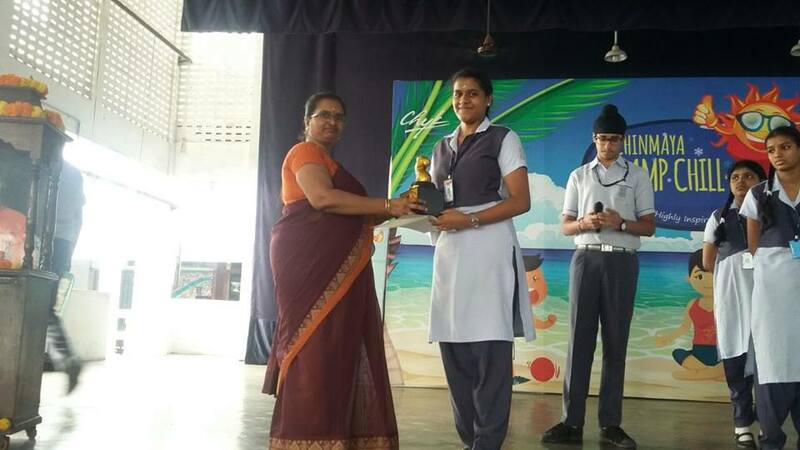 Girija Ramaswamy (T.N government Music college) was called as guest of honour. 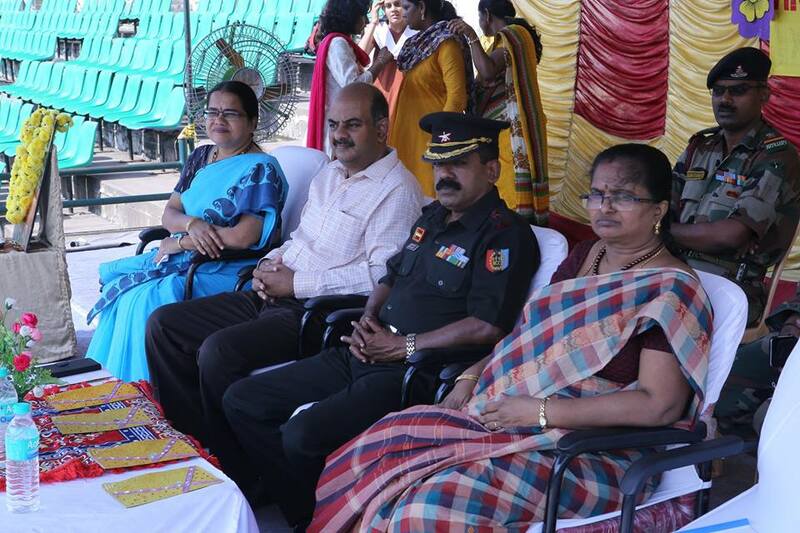 All school Principals graced the occasion. 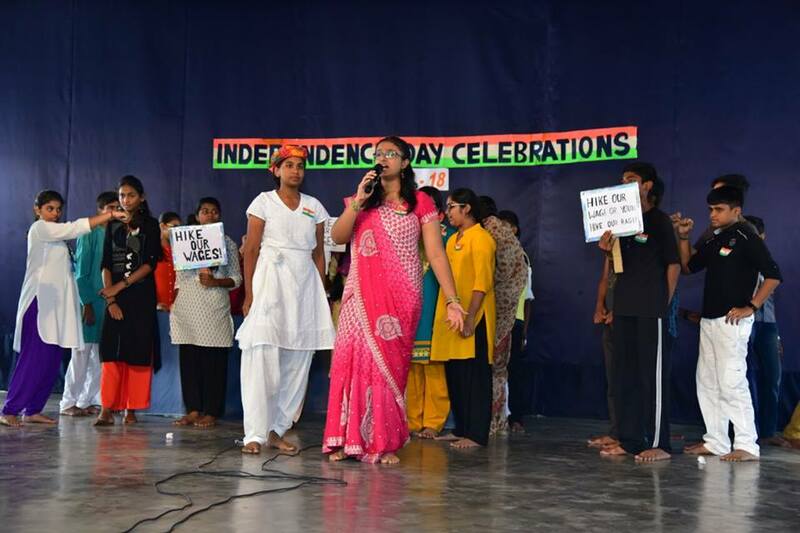 10 National Integration songs were sung. 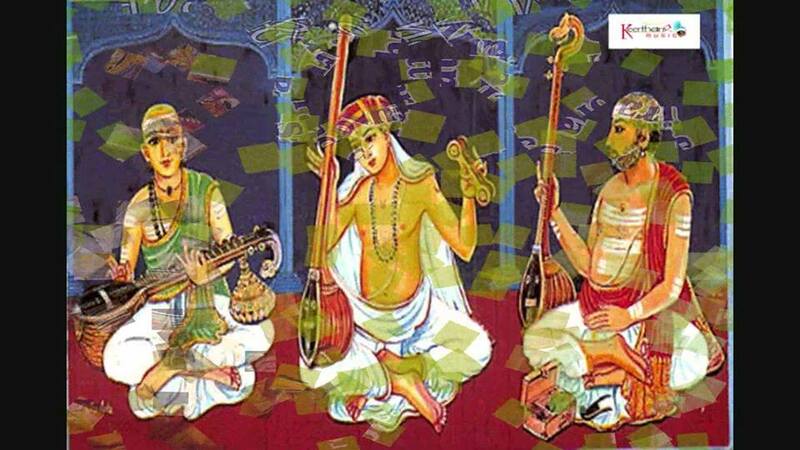 Songs were in different languages like Sanskrit, Tamil, Bengali, Malayalam and two songs in telugu and two songs in Hindi, Thillana and abangs . 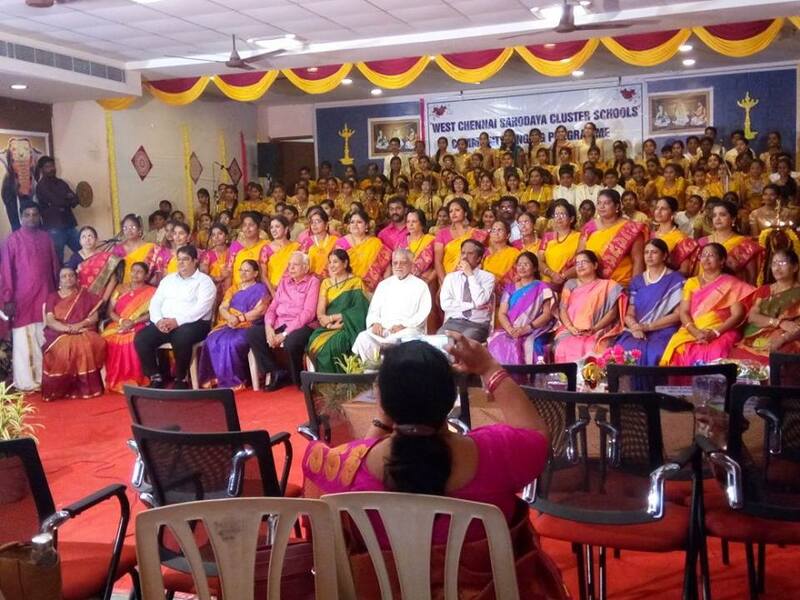 All music teachers of different schools contributed lot for grand success of this program. 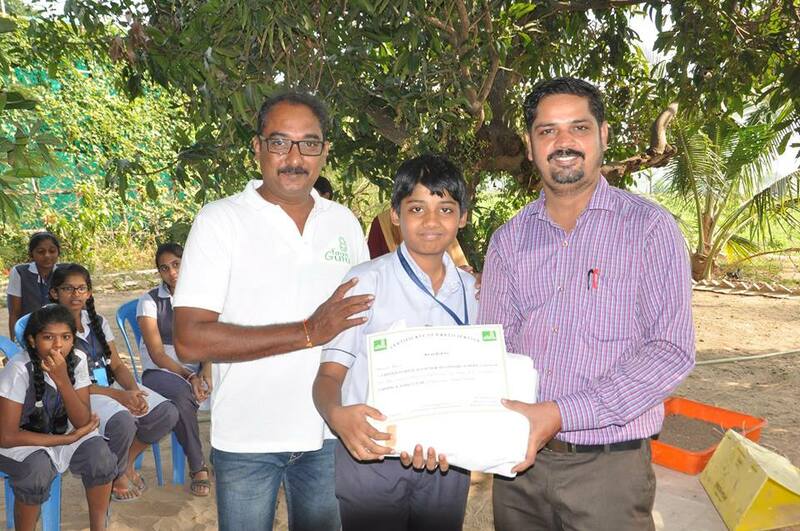 Teachers and students have received the certificates. 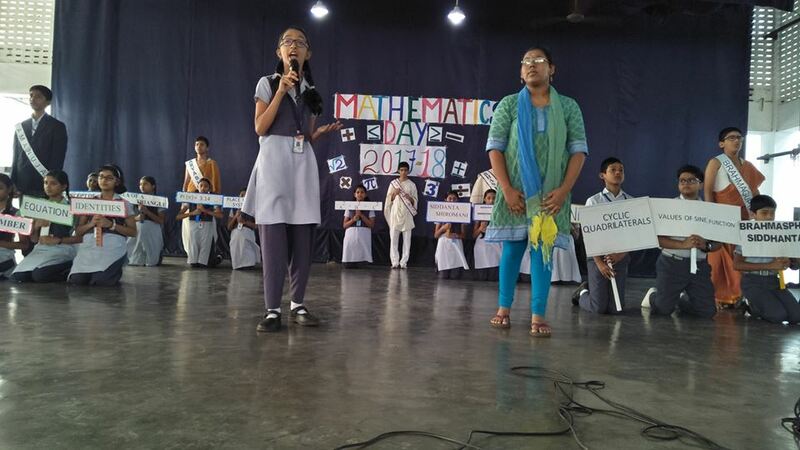 The mathematics day was celebrated on 5.1.18. the program began briefing the students on the significance of National mathematics day which falls on the 22nd of December the birthday of the renowned Indian Mathematician shri. 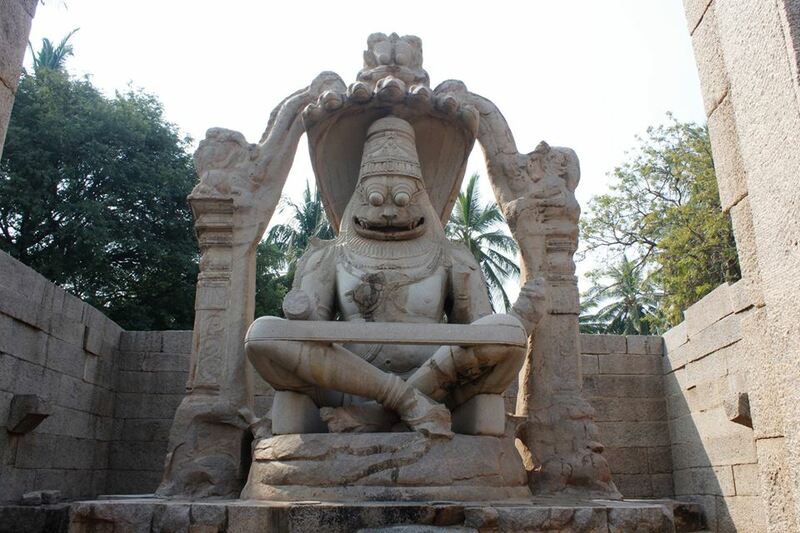 Srinivasa Ramanujam. 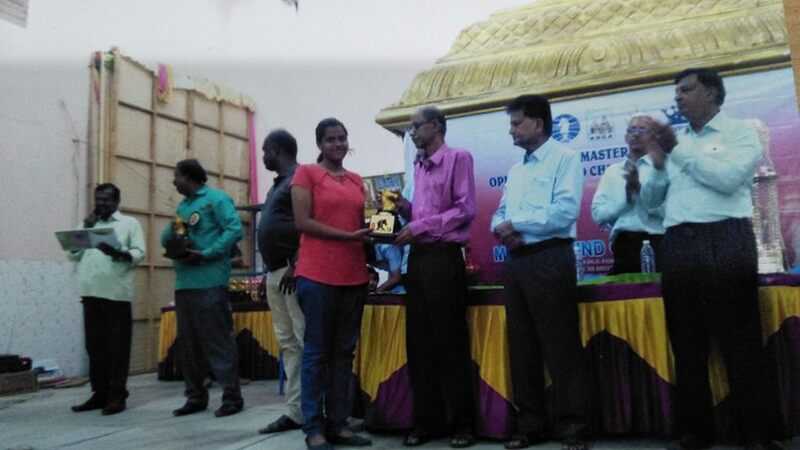 S. Vismitha of class XI participated in the 3rd Mastermind open FIDE rated chess tournament held from 27th December 2017 to 30th December 2017. 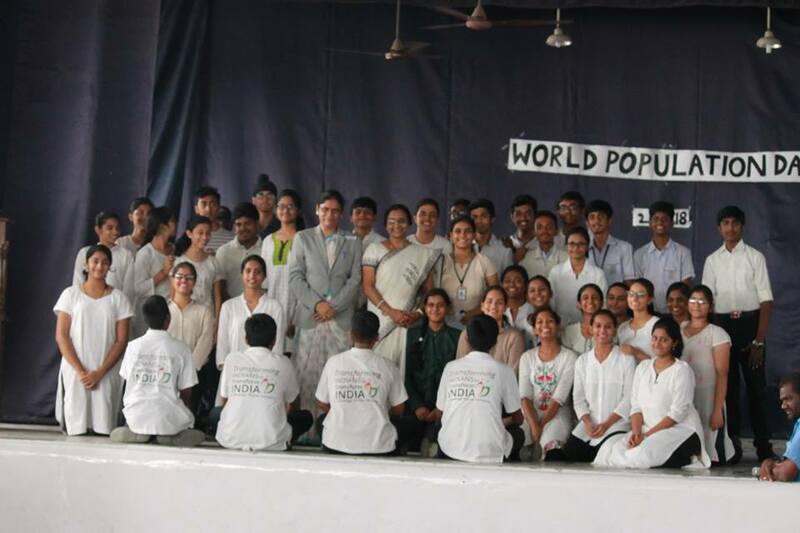 Around 300 participants from all over the world took part in this event. 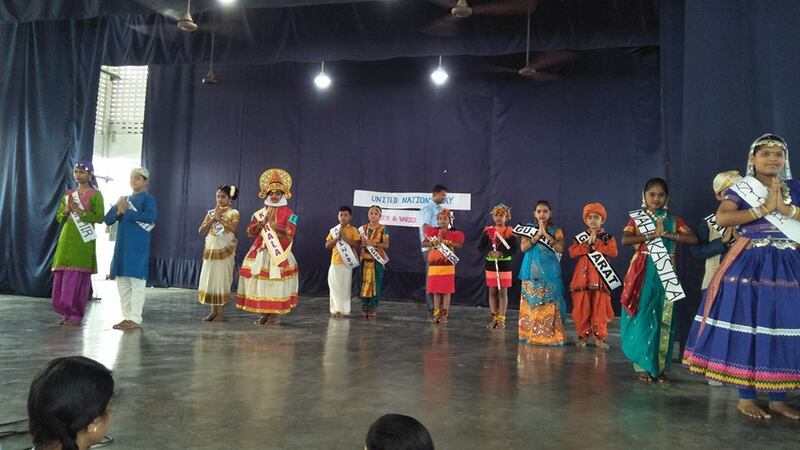 she won the 3rd prize in the Under-18 girls category. 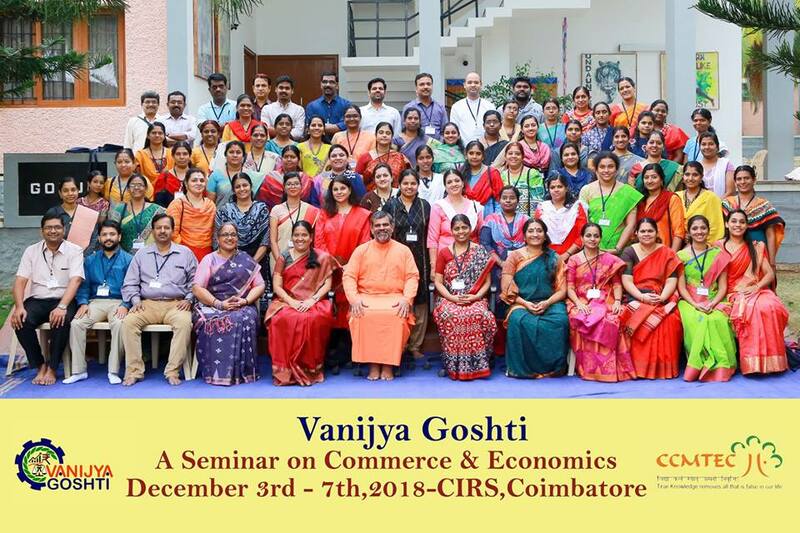 We congratulate S. Vismitha for her remarkable achievement. 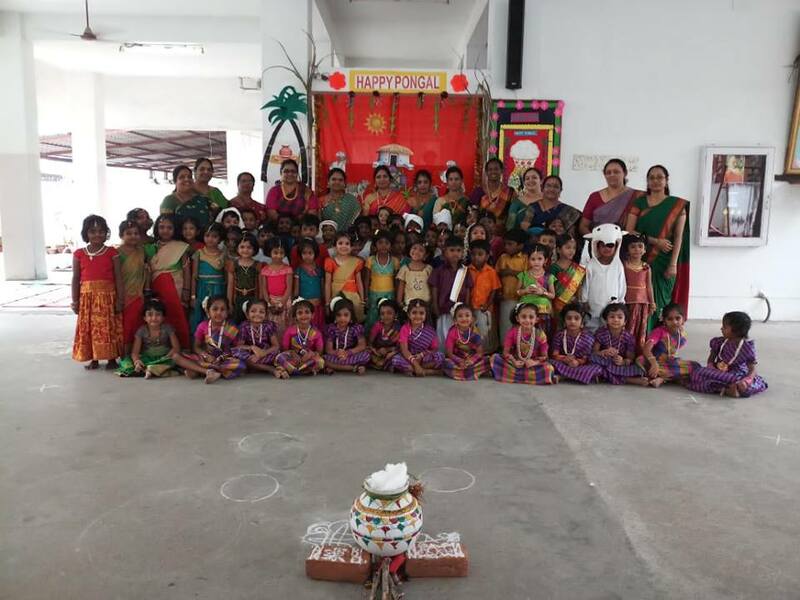 The project day of the kinder garten was held on 21st December 2017. 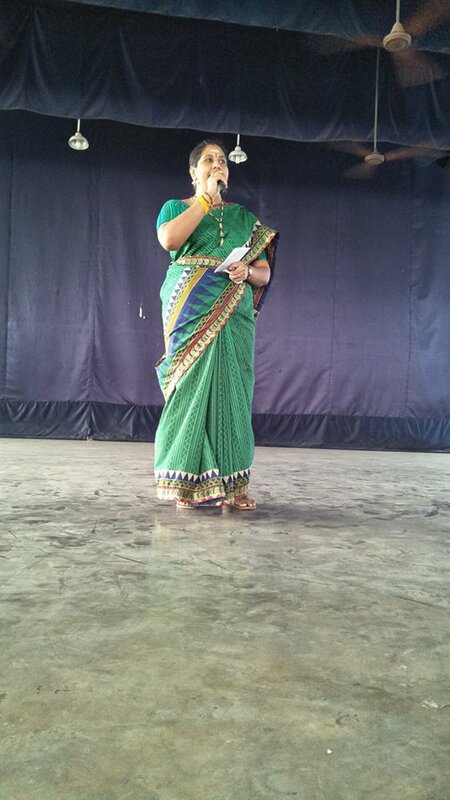 Mrs. Sugandhi Raja (Smile Montessori) was the special guest for the occasion. 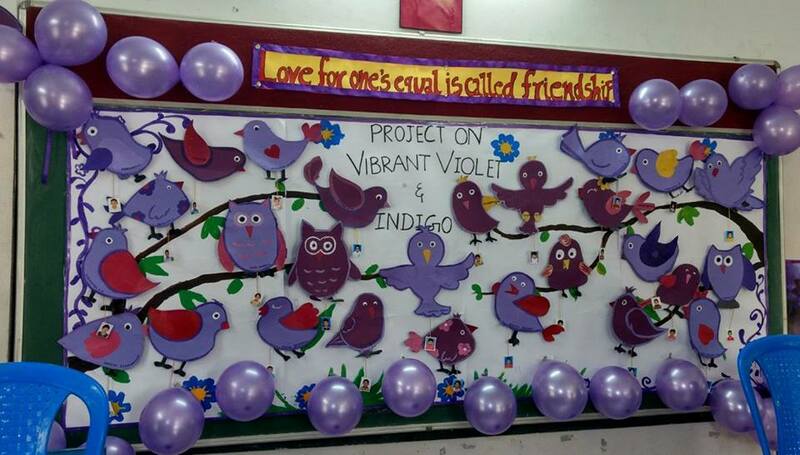 The topics for the project were colours for LKG and God and Goddesses for UKG. 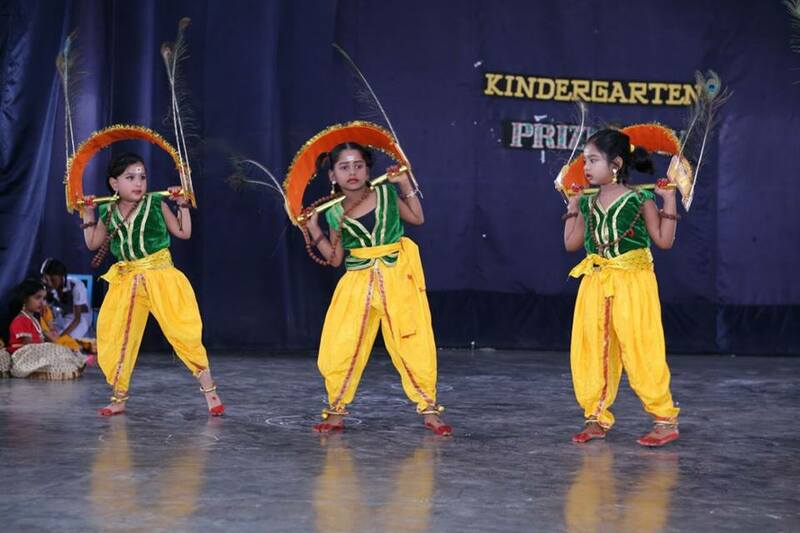 Children participated with great enthusiasm and displayed their skills very effectively. 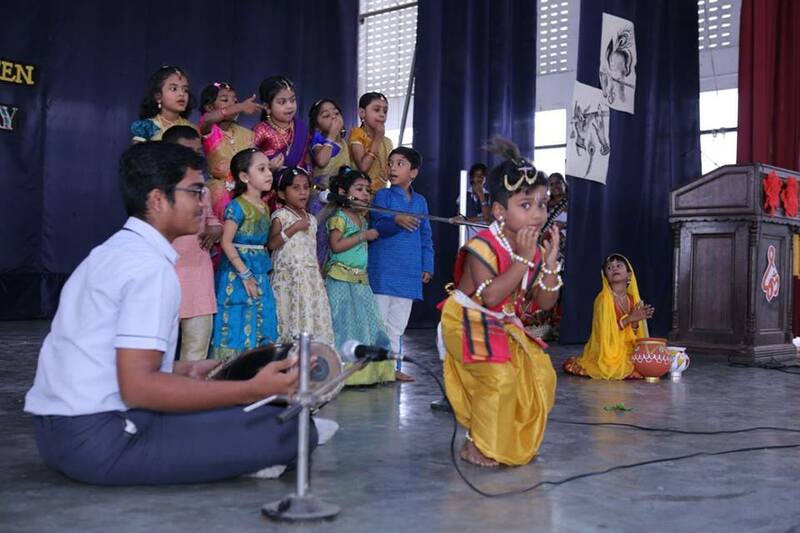 Activities performed by the children were light & sound show, puppet show, dances, skits, magic show, songs & bhajans. 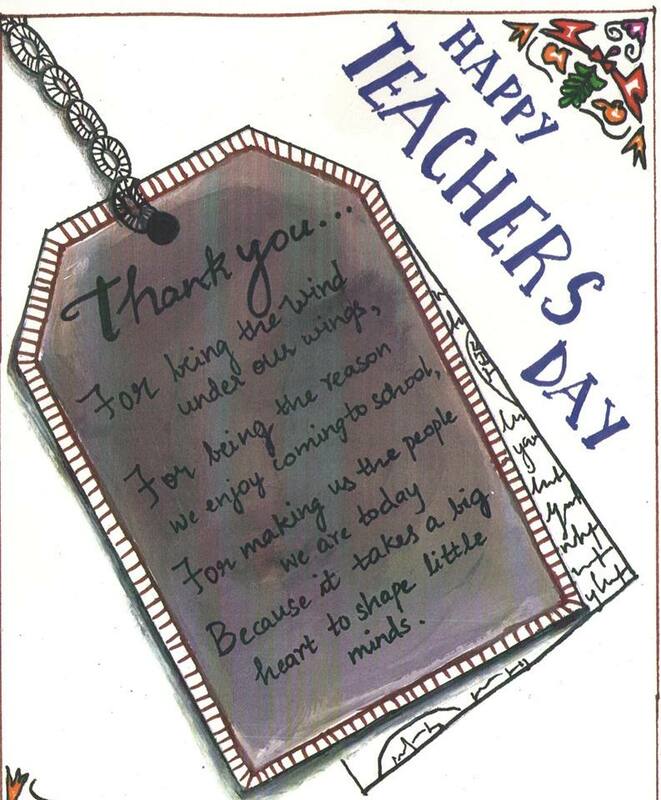 Congratulations to all the Kinder garten teachers and the students. 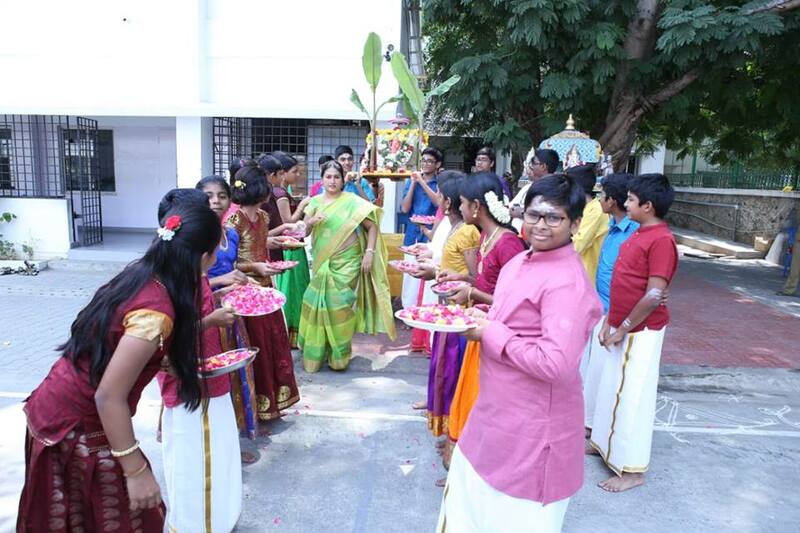 Hanuman Jayanthi was celebrated on 18th December 2017 in chinmaya vidyalaya Annanagar. 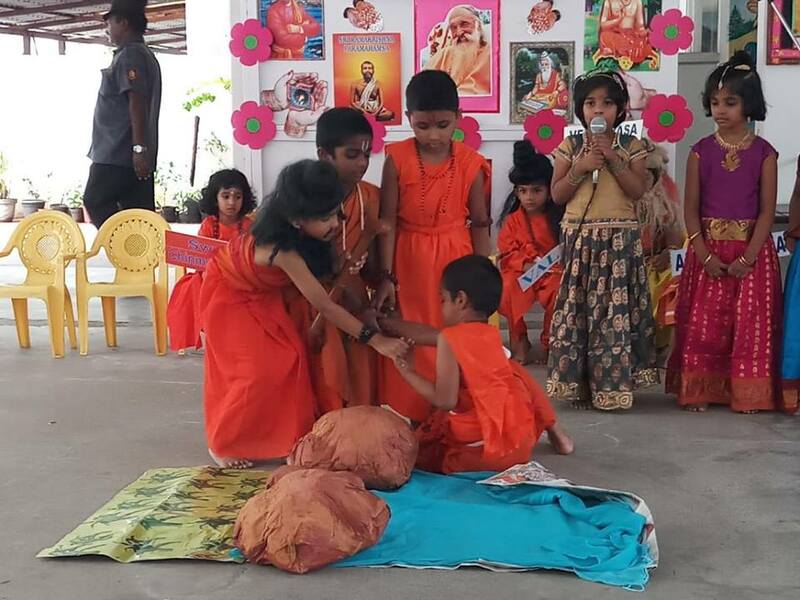 The importance of Hanuman Bhakthi was explained to the children. 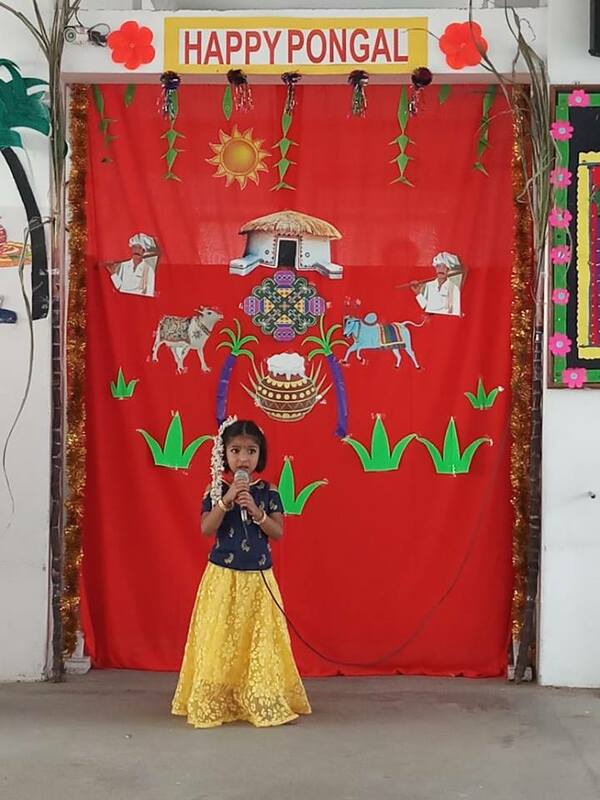 A puppet show on sundara kaandam was performed by an LKG child under the guidance of the teacher. 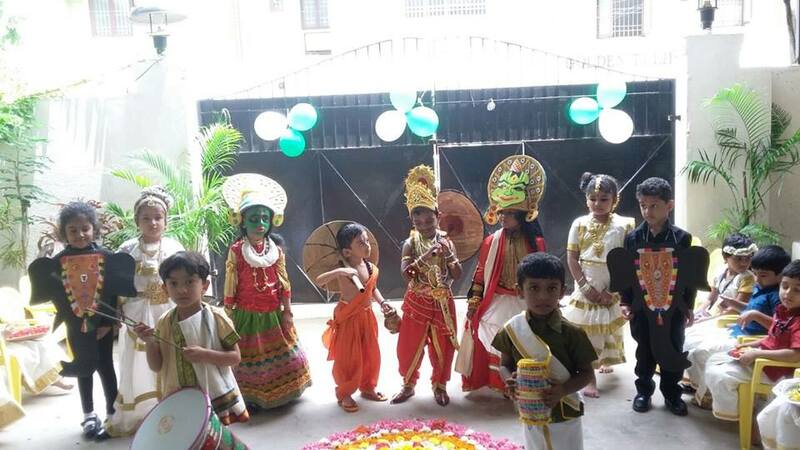 Children chanted hanuman chalisa and a few Bhajans. 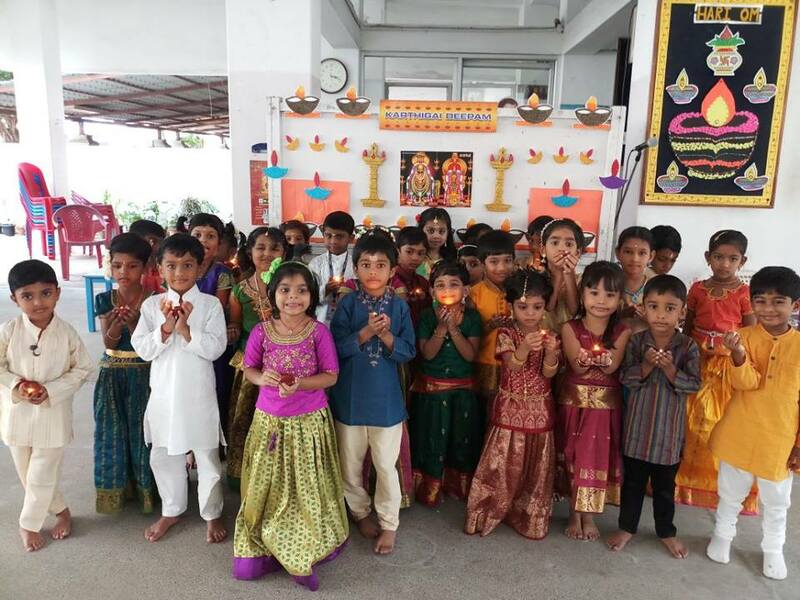 “Sri Rama Ramethi” was chanted by the children & teachers. 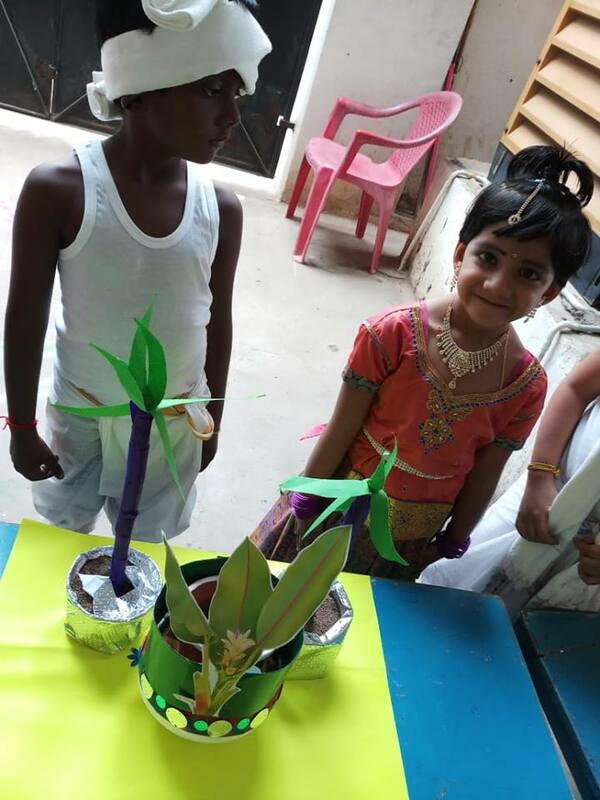 Finally an activity was done by UKG children -they wrote Sri Rama Jayam on a small piece of paper and the paper was threaded as a garland and offered to Hanuman. 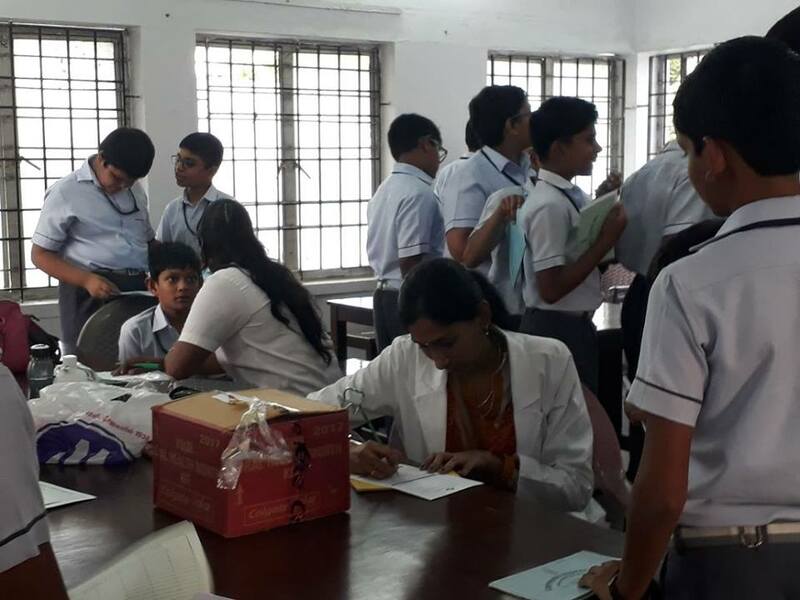 Medical camp for the students of class LKG to XII for Dental check up , eye check up and General check up respectively. 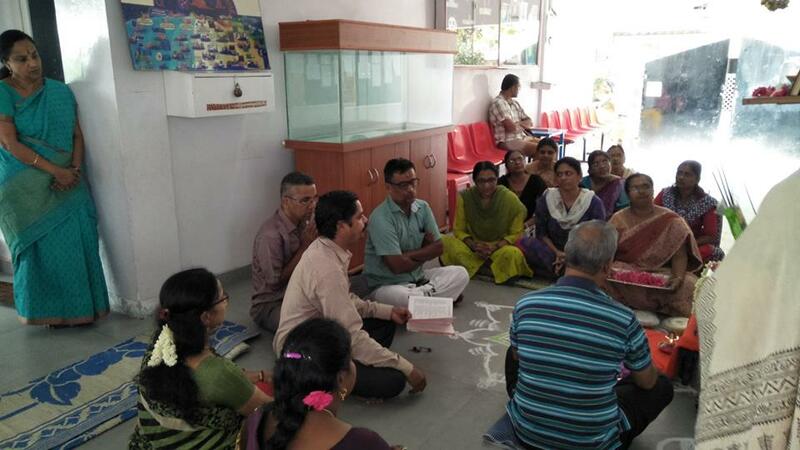 The camp was held between 16.11.2017 to 19.11.2017. 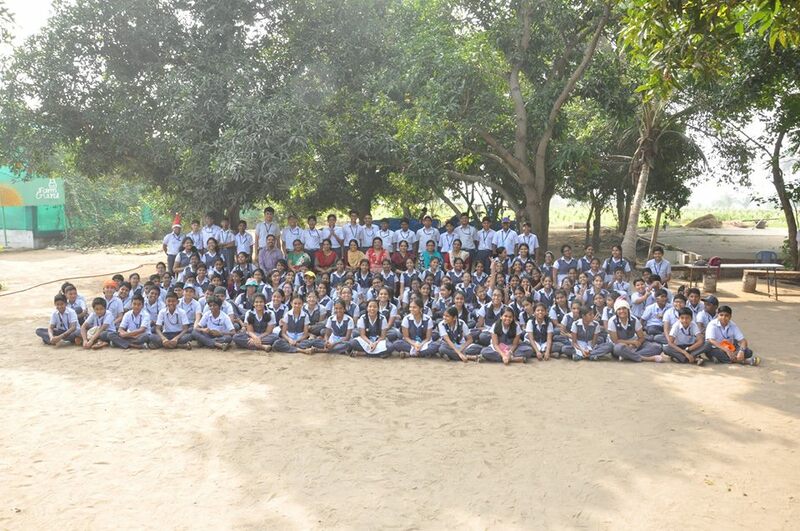 The teachers and the parents felt that the camp was very beneficial for them and were thankful to the management. 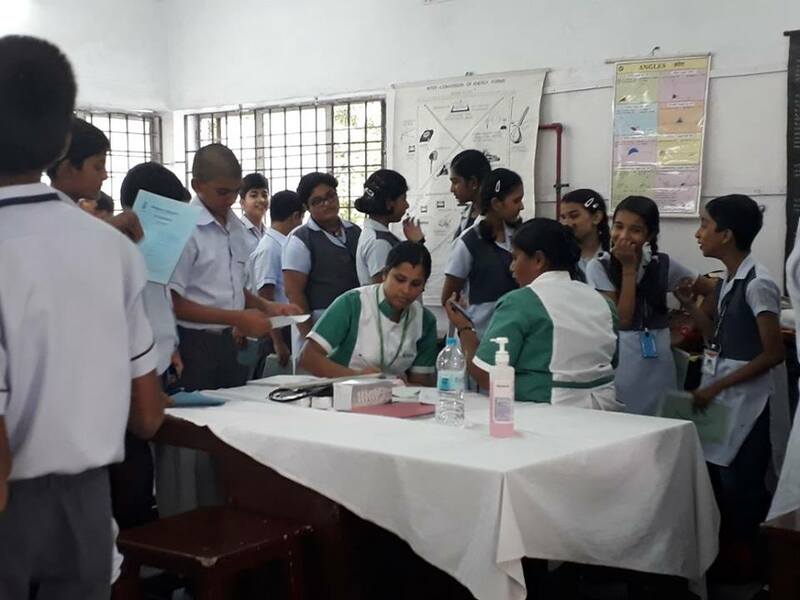 Students also came to know about the general health and hygiene. 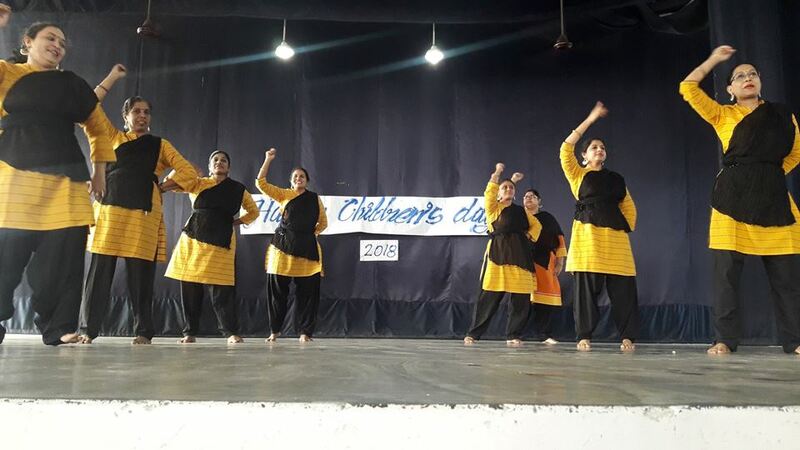 To express their love and affection to the children, teachers have entertained them with a variety programmes like singing motivational songs dance and games. 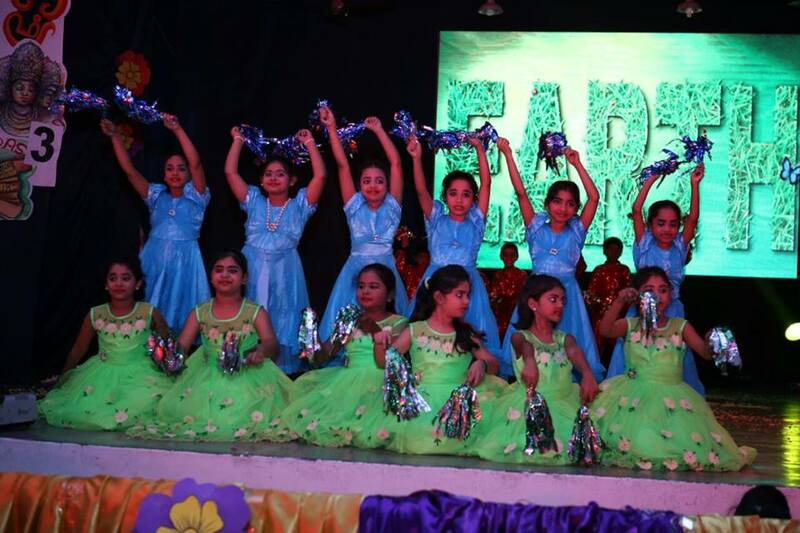 Children were very happy to see their teachers performing on the stage. As per the quote “They inspire you, they entertain you, and you end up learning a ton even when you don’t know it”. 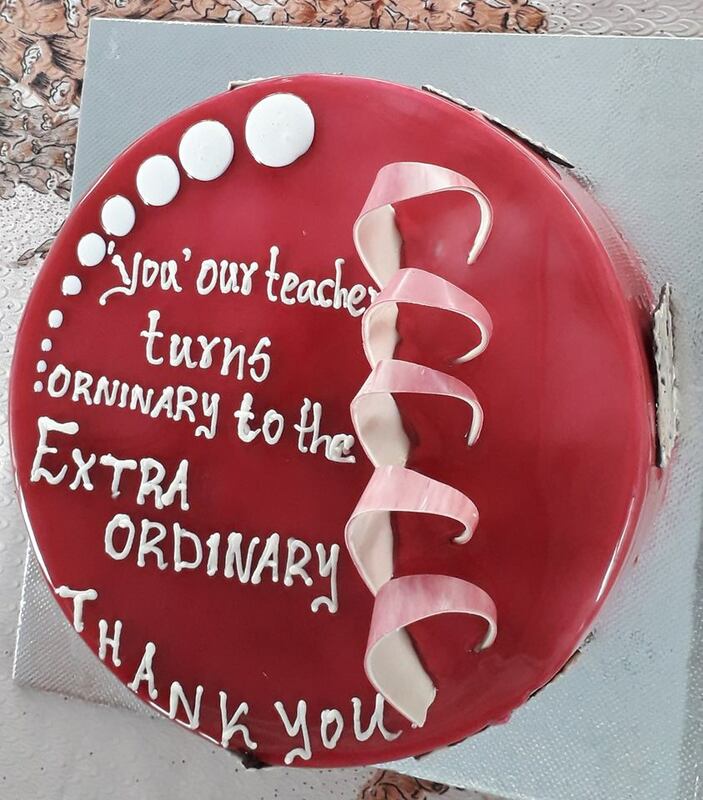 Our teachers have done their wonderful job to prove it. 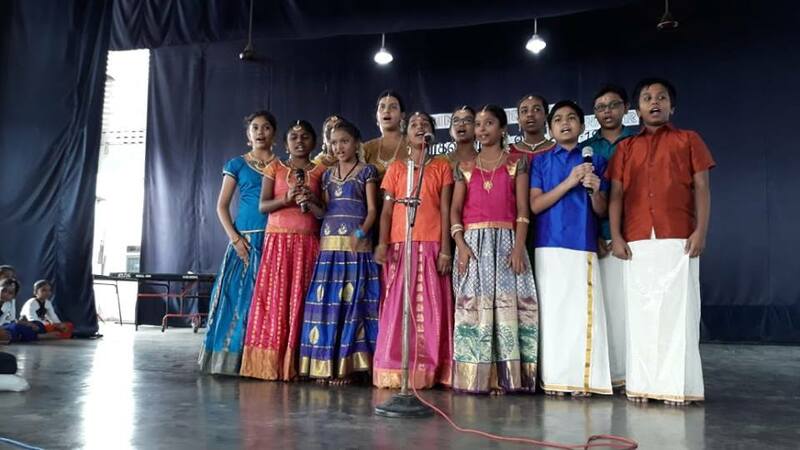 Subramaniya Bharathiyar’s 135th birthday was observed in our vidyalaya on 11.12.2017. 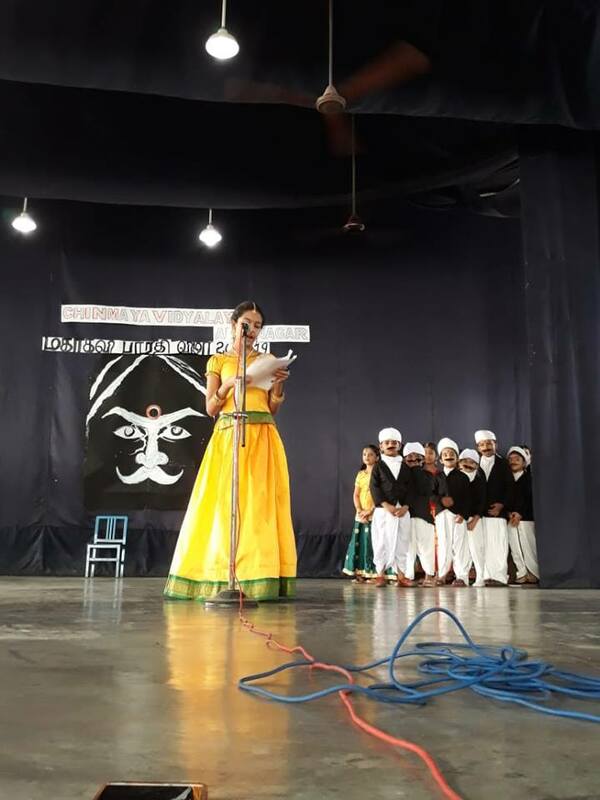 Students from primary and high school gave speech about Bharathiyar. 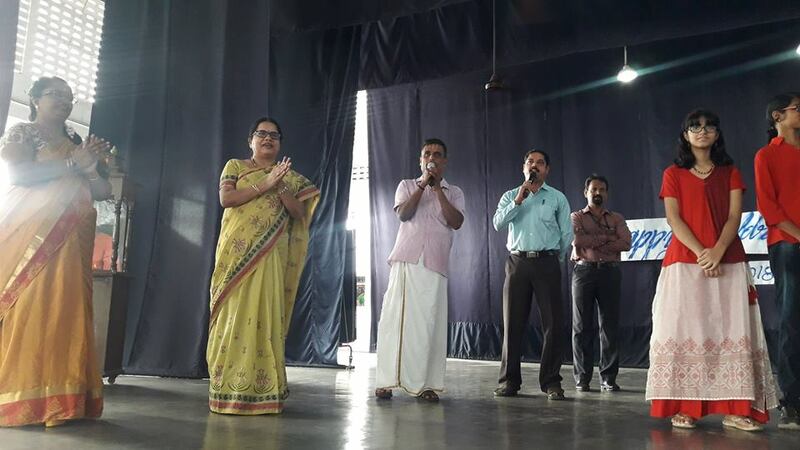 Teachers form Tamil Department and few students sang the Bharathiyar’s song. 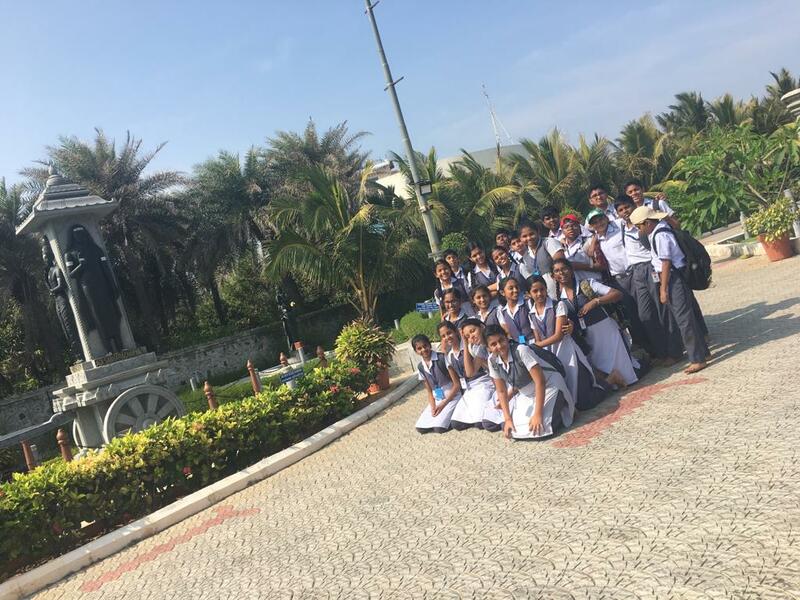 The way in which the teachers spoke about Bharathiyar and his contribution towards India’s freedom motivated all the students. 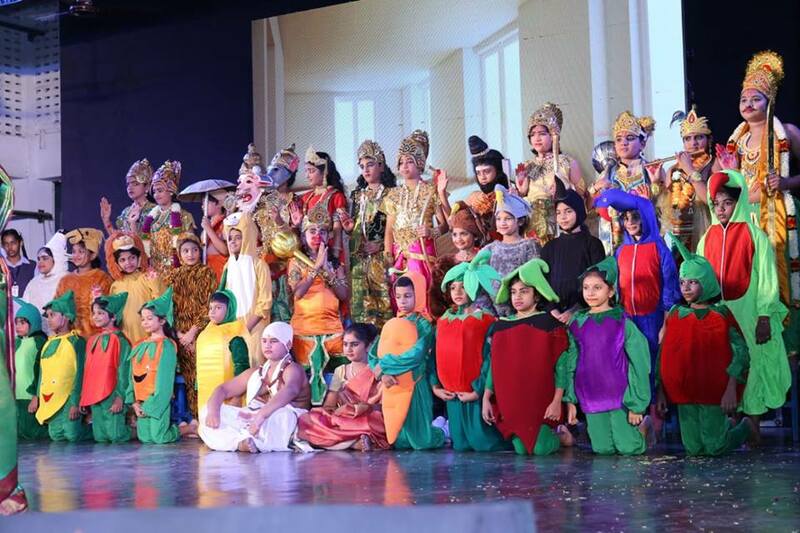 The entire show has created love and flair for Tamil language among the students. 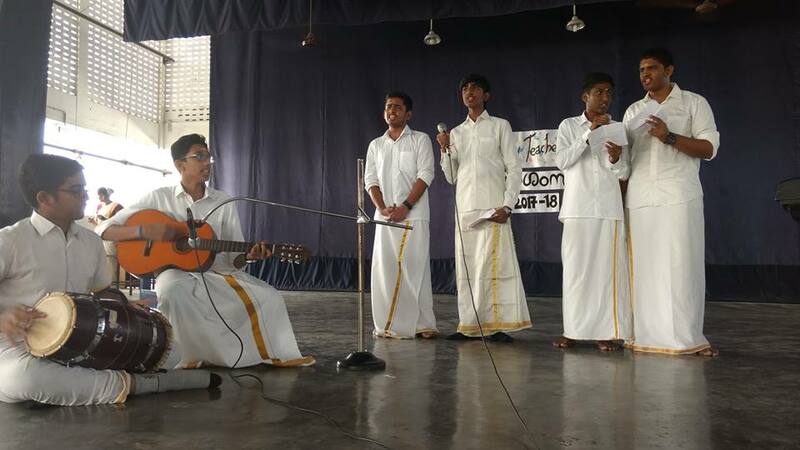 They were also inspired and decided to refer bharathiyar songs and to know his love towards our mother India. 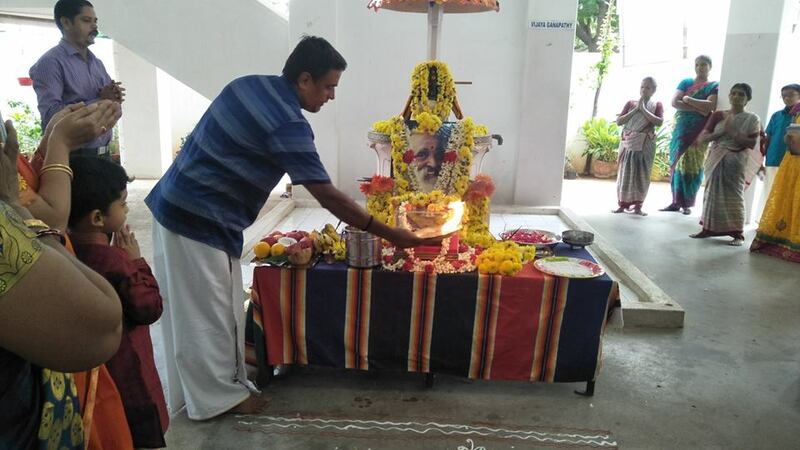 Mathru pooja was celebrated on 7.10.2017. The principal spoke a few words highlighting the importance of the day. 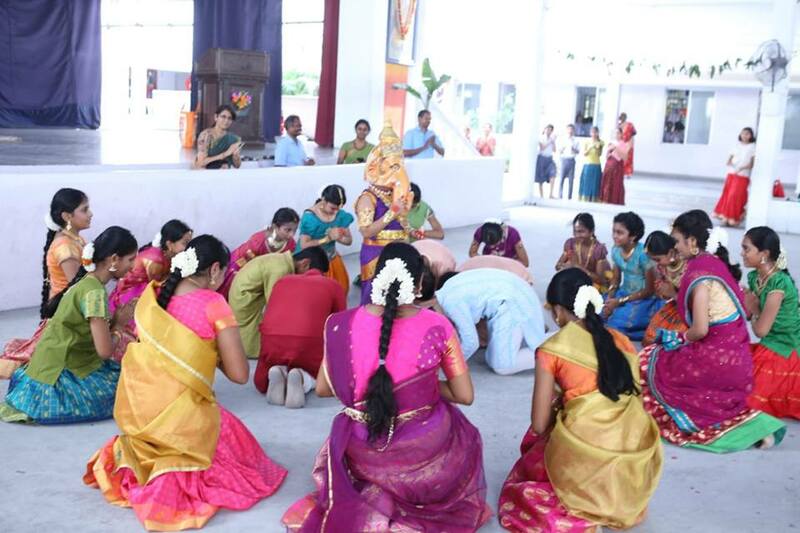 It is a celebration honouring the mothers of the family as well as the motherhood.The students of CVA were assembled in large numbers along with their mothers to perform the pooja.The stage was decorated in a grand manner (all deities were decorated, taking kuthuvilakku as a base by the teachers). 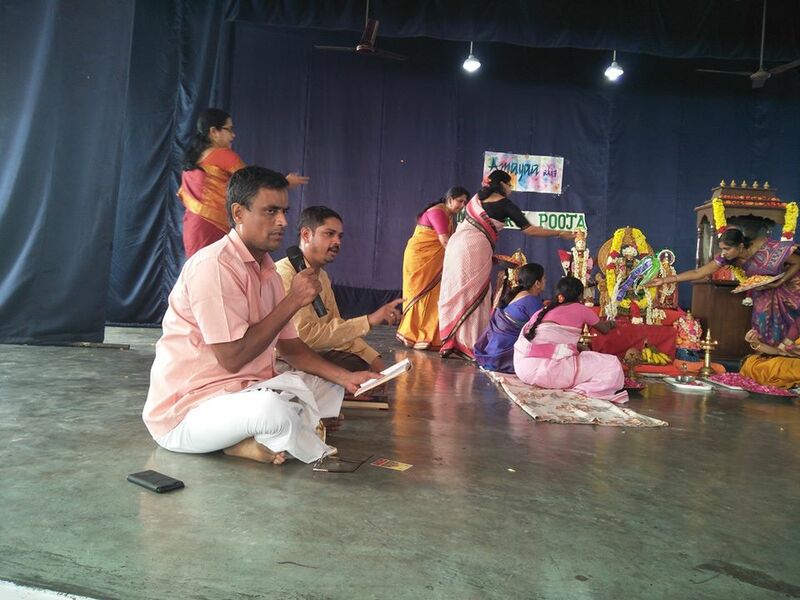 pooja was performed by our Sanskrit teachers Mr. S Kannan and Mr. G P Ravi. 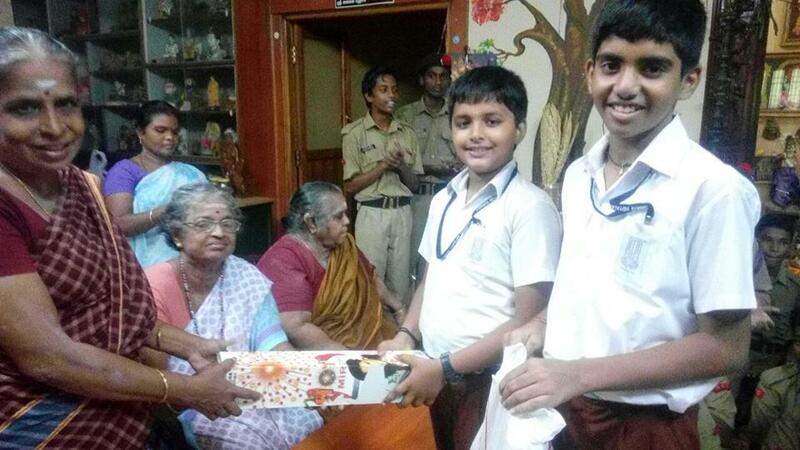 Prasadams was distributed to all the parents and students. To attach ourselves to the DIVINE is to detach ourselves from the UNDIVINE. To walk into the LIGHT is to walk out of DARKNESS. 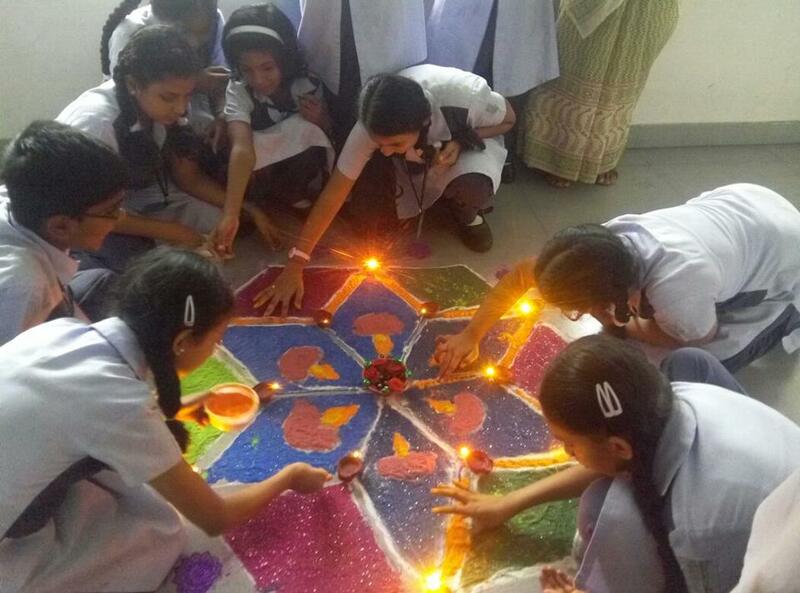 May this bright day, the festival of lights lead us in the path of PROGRESS and CONTINUED SUCCESS. 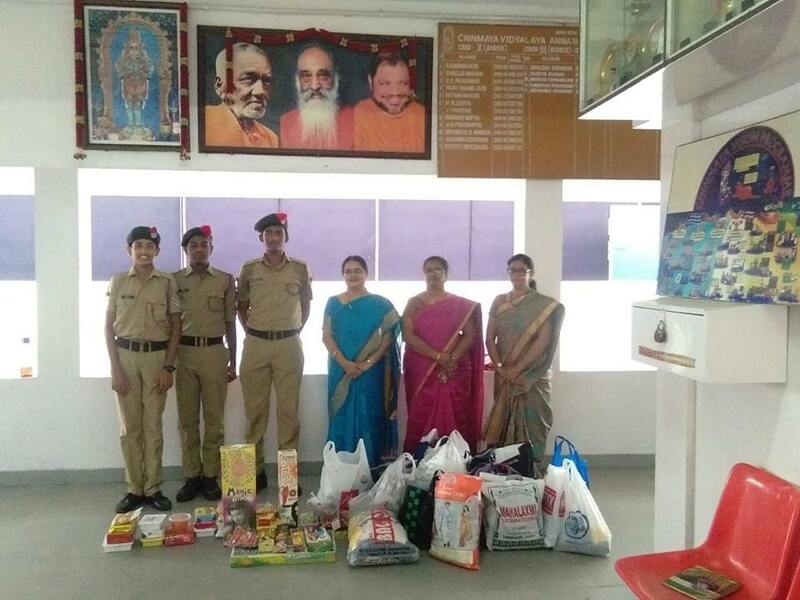 On account of Diwali Our Vidyalaya NCC Cadets/ Seva Students along with our NCC Master Mr.S.Kannan, NCC officials and our Principal Mrs.V.Gowrilakshmi visited the orphanage - Guild of Service Annanagar and donated crackers, clothes, sweets and also the cash amount of Rs.5800/- They also donated the same kind of materials and Rs.7500/- to “Avvai Home”- Home for aged. 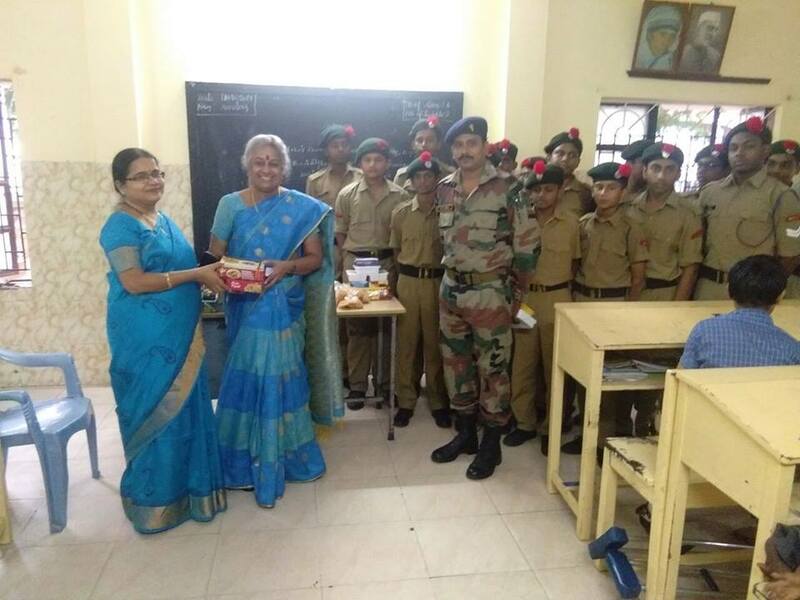 They visited the place along with our Computer teacher Mrs. T Hemamalini. 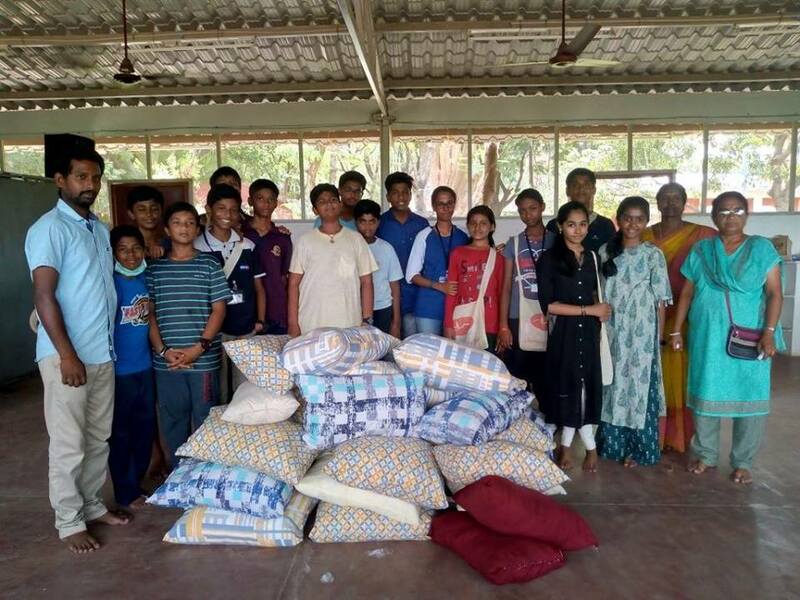 The inmates of orphanage and the Home for aged, enjoyed the presence of our students, their concern, love and affection. 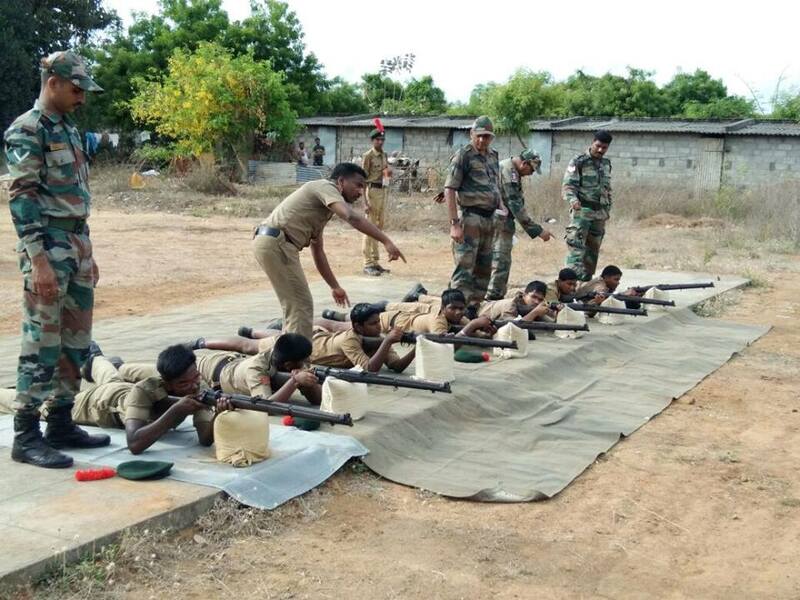 NCC camp(2017-18) was held at Sairam engineering college from 28th July to 6th August. 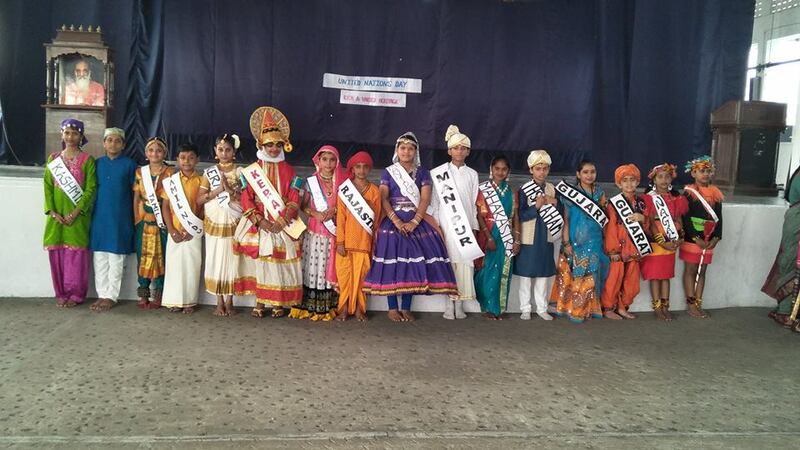 15 schools and 5 colleges have taken part. 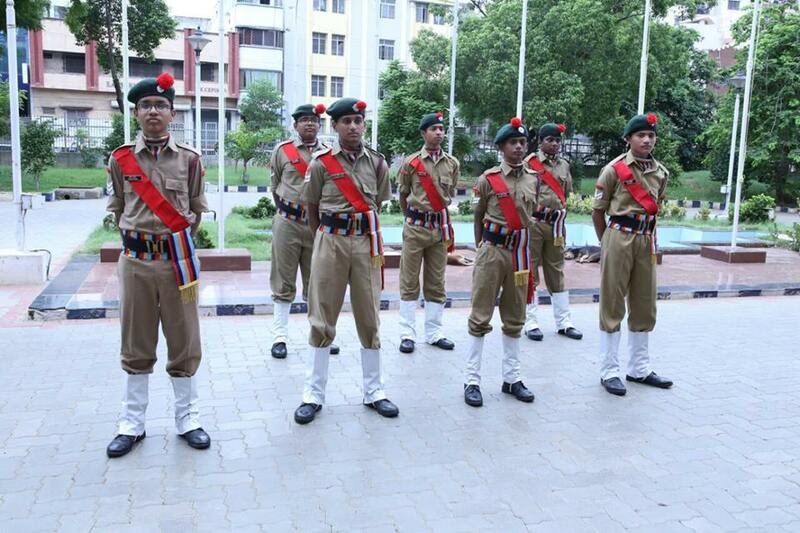 Our school cadets have won prizes in firing and sports events. 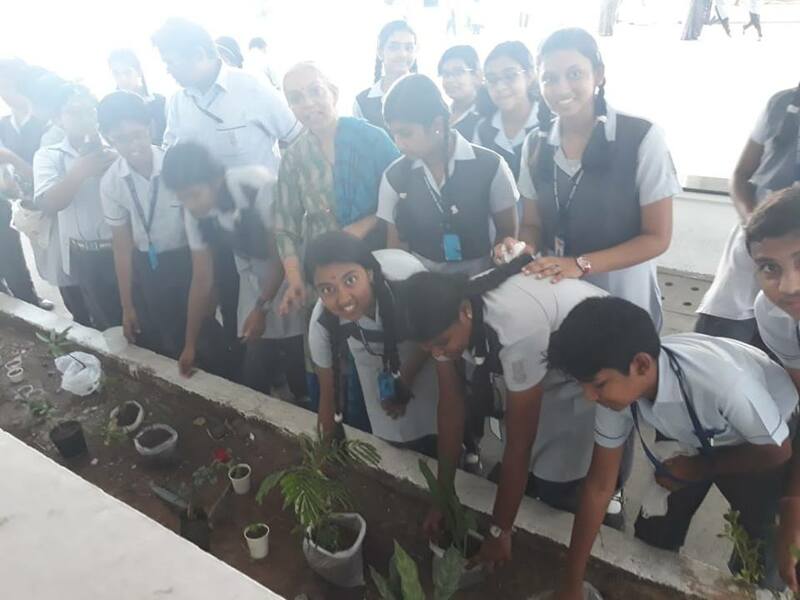 Swachh Bharat Abhiyan was observed in our school in association with BPCL to instill in students the sense of responsibility to keep our surroundings clean and be more responsible citizens. 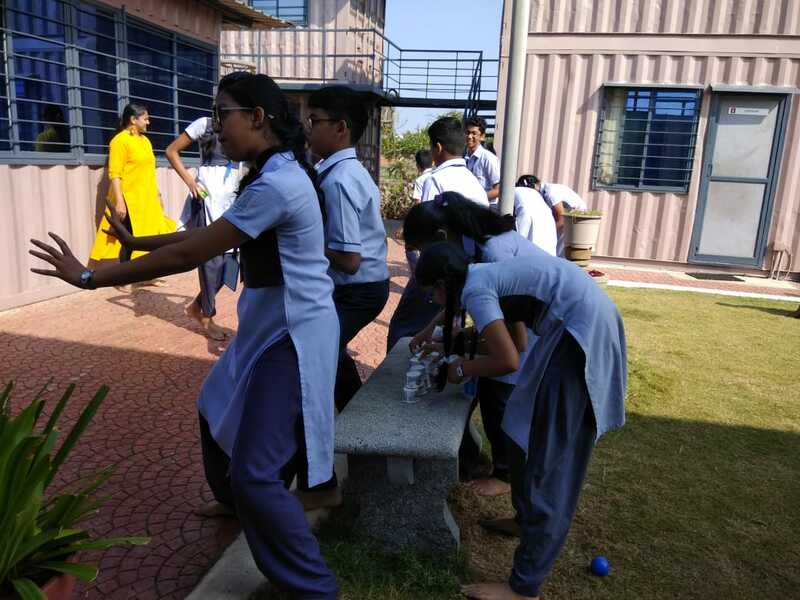 Students of class 8 enthusiastically took part in collage making on the topic Swachh Bharat Abhiyan and the best collage were displayed on the notice board. 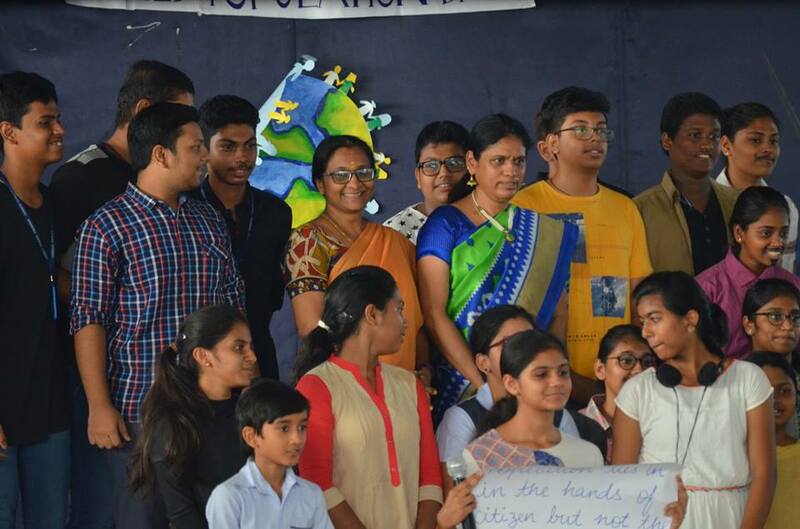 Elocution competition was conducted on the topic ‘Keeping India clean is the duty of every Indian’. 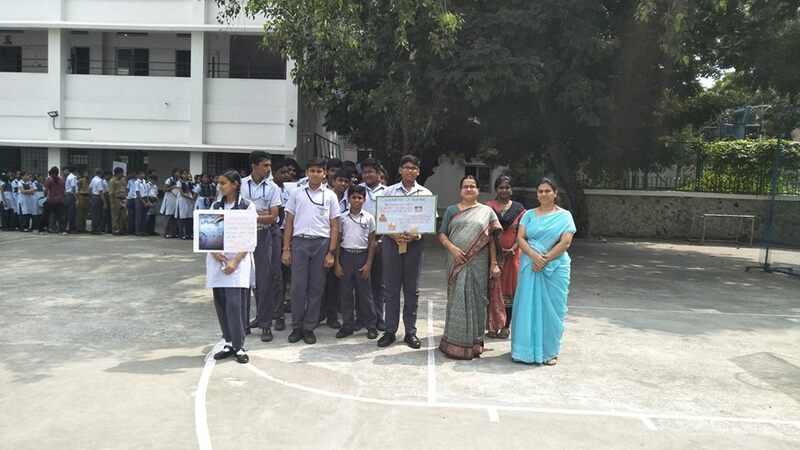 The winners of the competition were given Gift vouchers sponsored by BPCL. 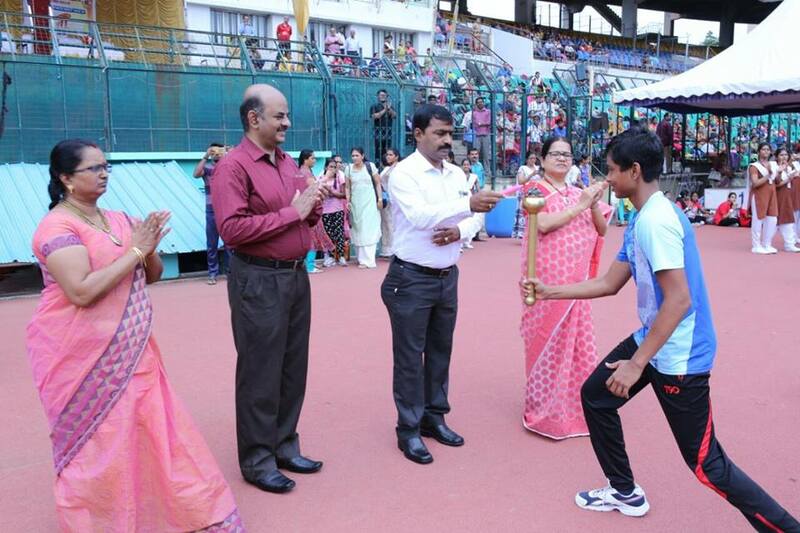 Mr.DevindarWalmiki-Member of the Indian hockey squad Rio Olympics gave away the prizes. 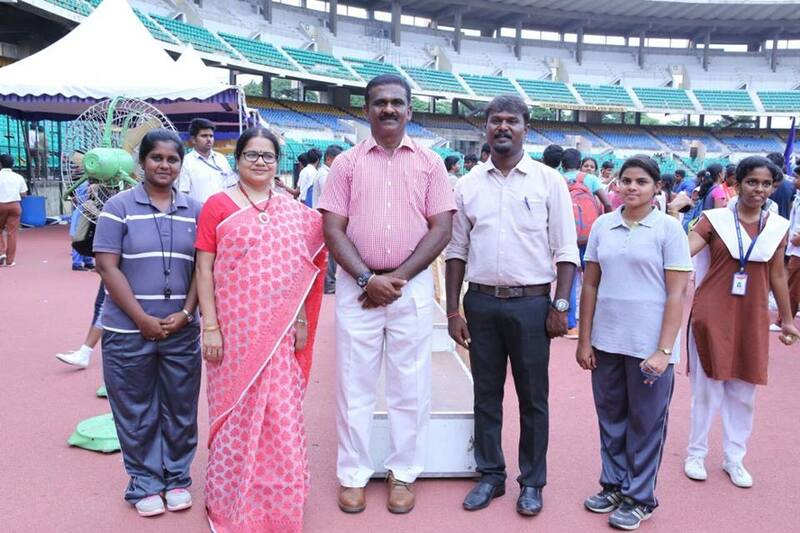 Mr.TusharKhandker a National player who played the common wealth games Asia & Asian Cup hockey tournaments and the former coach of the Rio Olympics Team was also present on the occasion. He spoke on the significance of Swachh Bharat Abhiyan initiated by our Government. 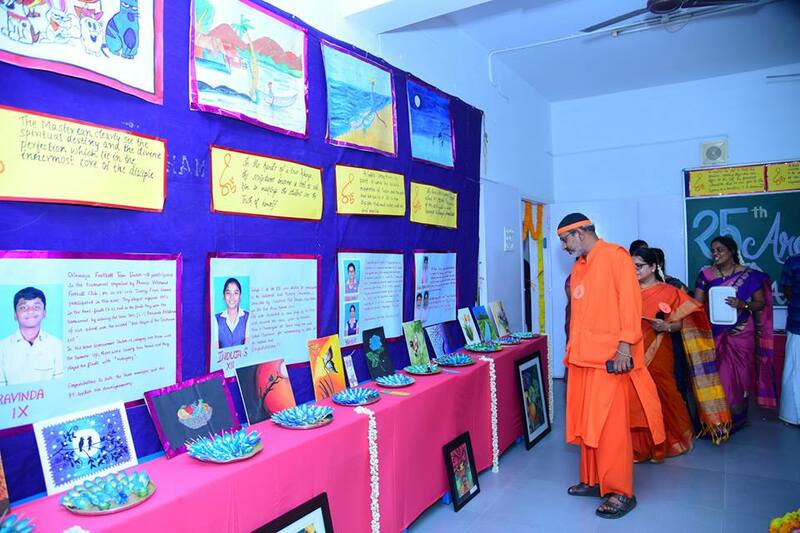 As a tribute to Dr. A P J Abdul Kalam on his 2nd Remembrance day, House of Kalam and Chinmaya University have come together for setting up Kalam Sandesh Vahini - which exhibits lots of information about Dr. Kalam’s inspiring life, his vision and his scientific work. 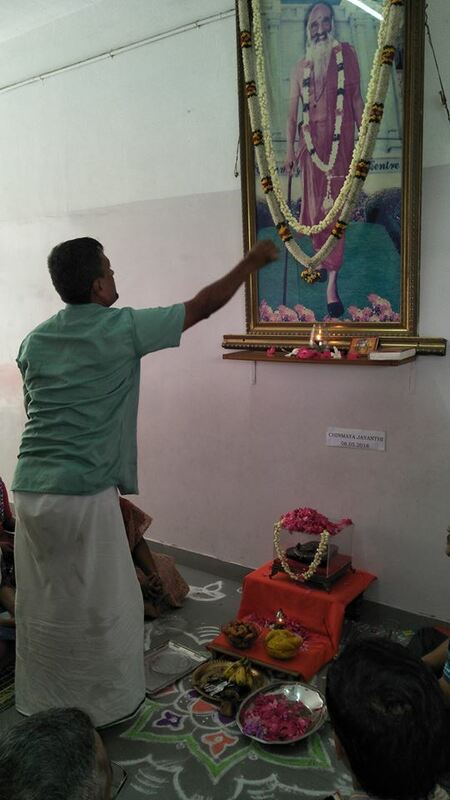 After the inauguration of Kalam’s memorial at Rameshwaram the Vahini was flagged off by our Hon. PM Shri. Narendra Modiji. 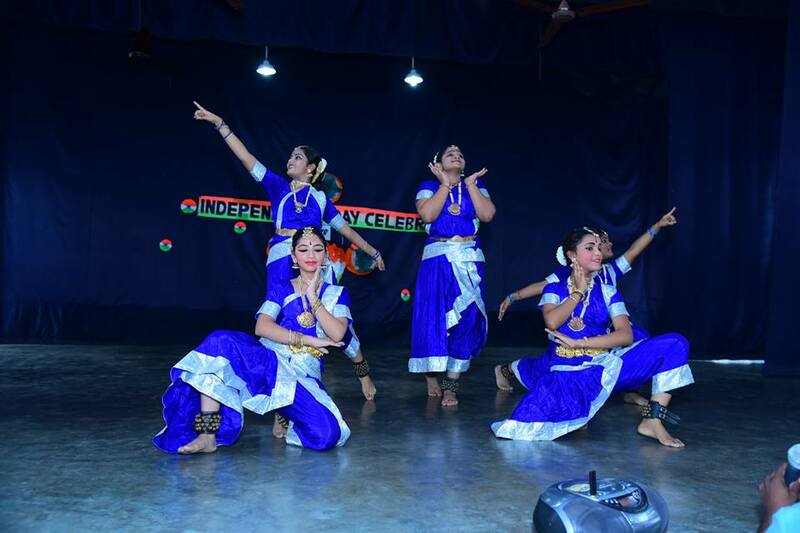 Vahini will go around important places in India from Dr. Kalam’s life and conclude on October 15 at Rastrapathi Bhavan. 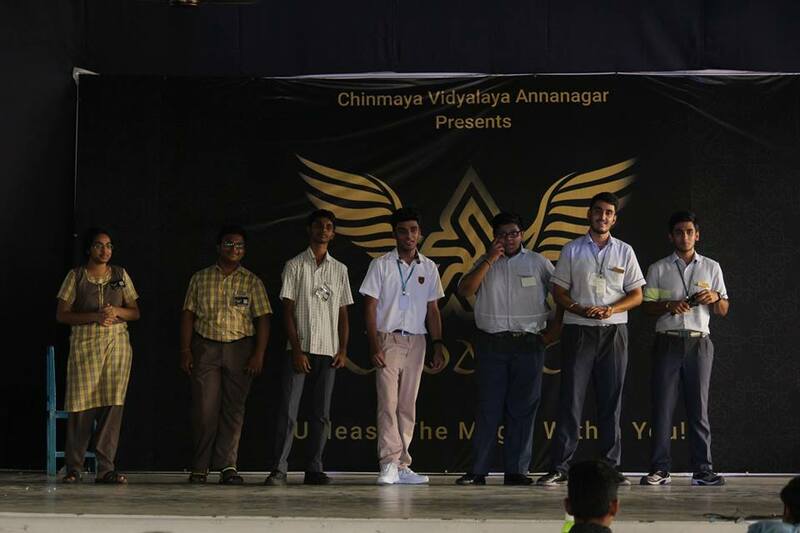 As a continuation of its journey through Chennai, as a first step it visited our Vidyalaya on 22.08.17. 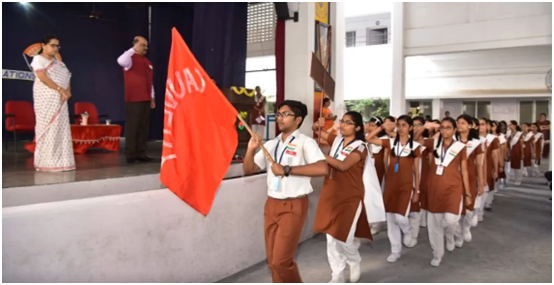 The students of the school welcomed the Vahini through various activities including a parade, a rendition of the song “KALAM SALAM” and by performing a skit. 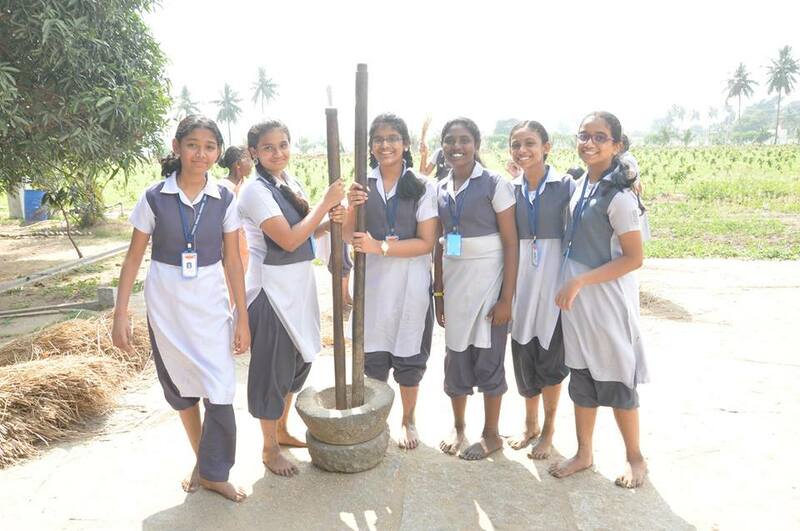 Staying true to Dr. Kalam’s dream of innovation the students gave a unique robotic floral welcome to the KSV and also demonstrated the launching of the indigenous rocket. 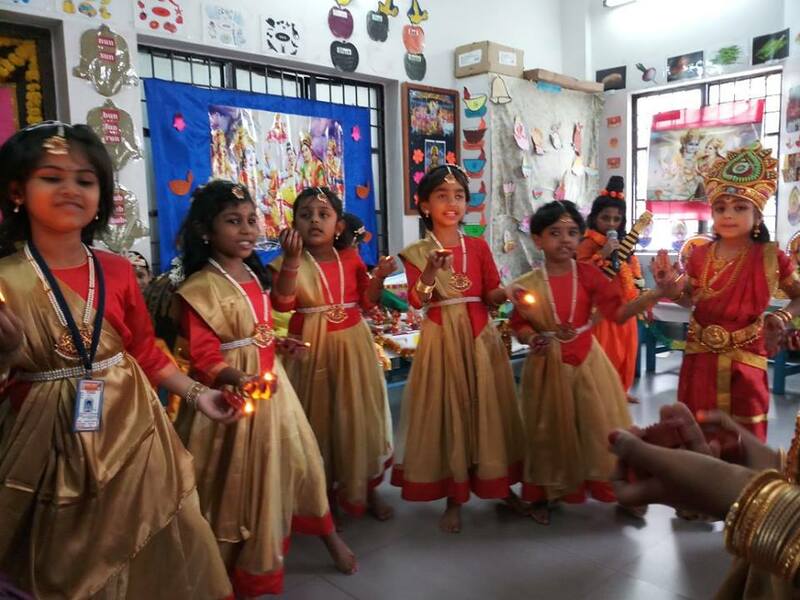 Before the celebration of Ganesh Chathurthi at home, Students understood the Significance , rituals and customs of Ganesh Chathurthi Celebration by participating in various activities like Palak making , Rangoli on Pillayar , clay modelling of Ganesha, kolukatai making etc. 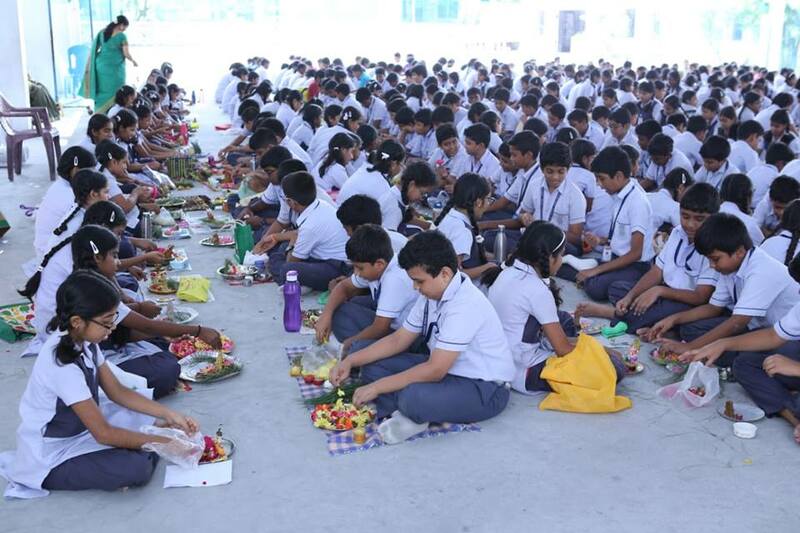 Pooja was also perfomed with chanting and bhajans the whole school was reverberated with the joy of celebration. 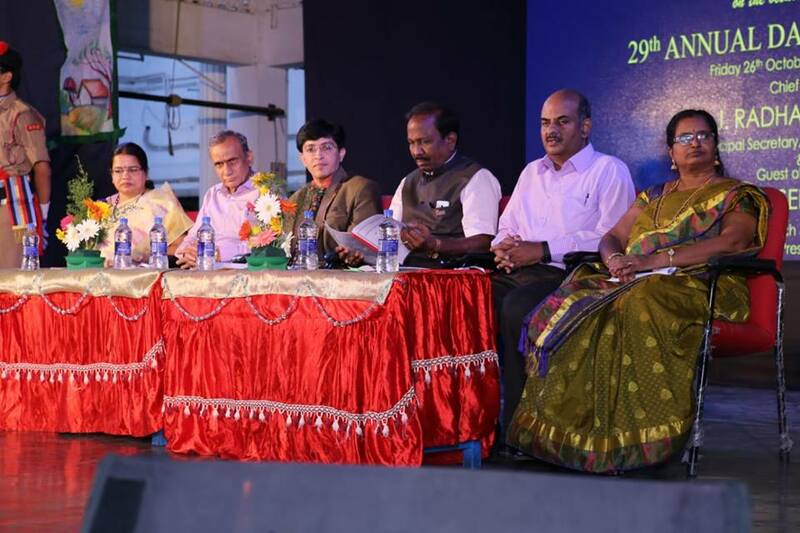 Vivarth – commerce fest was organised on 22.07.2017. To promote commerce related activities and indulge in competitions based on jobs available to commerce students after class XII. 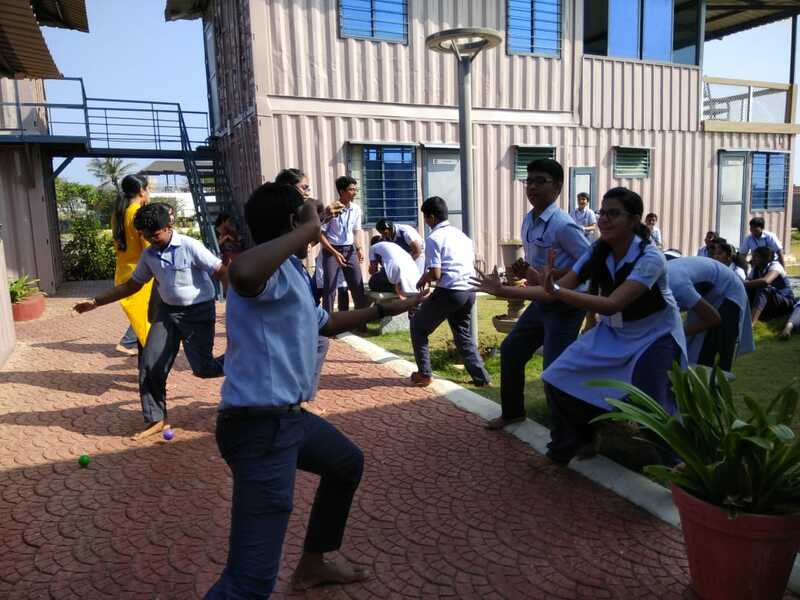 A variety of competitions including lawyer up, stock market, Presidential election, Treasure hunt, Start – up stratergy were held. A bazaar was set up by the students, selling various food items to promote entreprenurship. 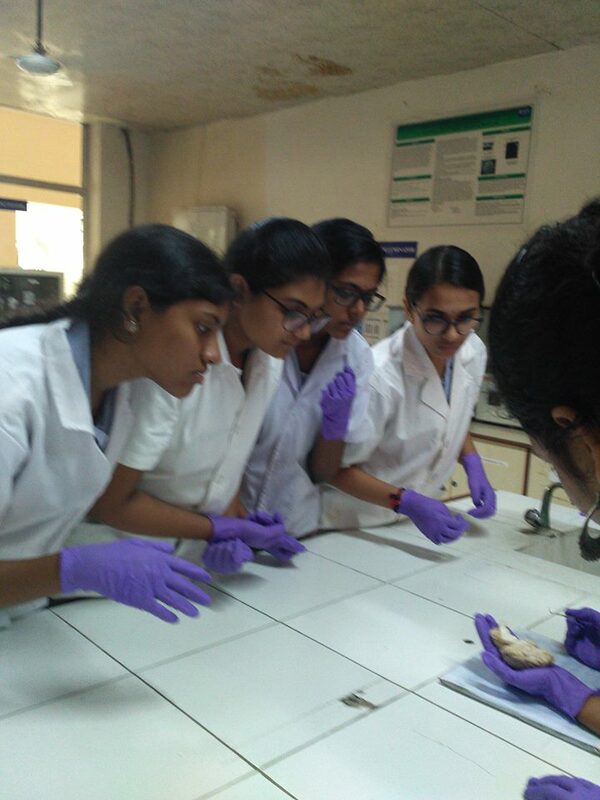 Students had a better understanding on career opportunities. 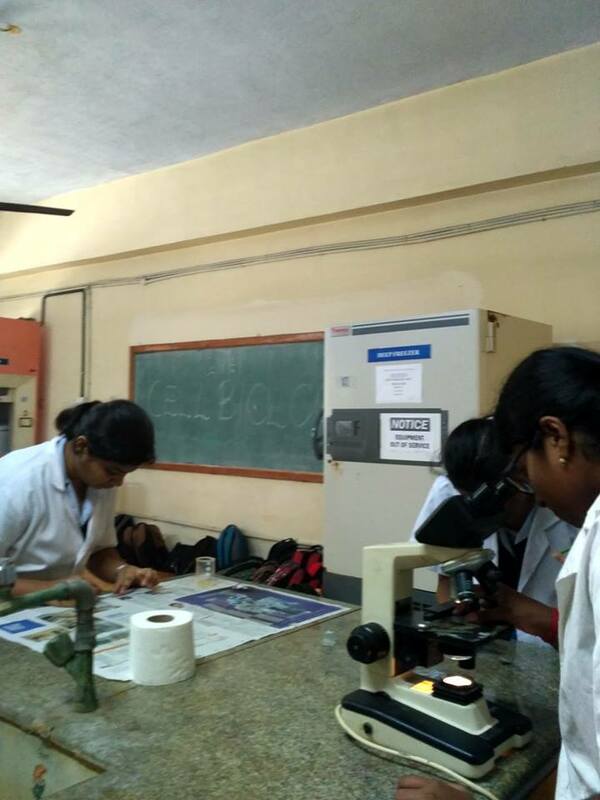 Std XII Biology students visited the SRM Engineering college, Genetic department on 21.7.2017. 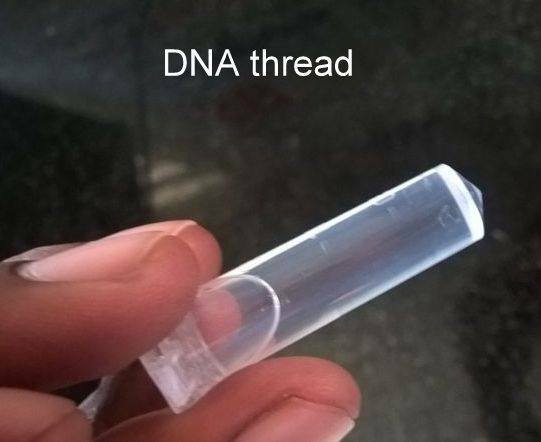 They had an opportunity to isolate DNA from human blood samples. 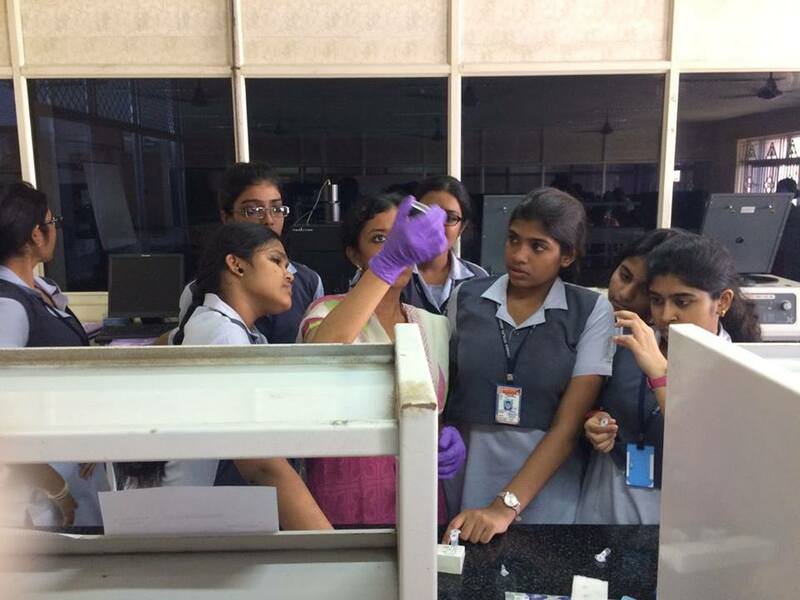 A very encouraging programme for students to get to learn beyond school knowledge. 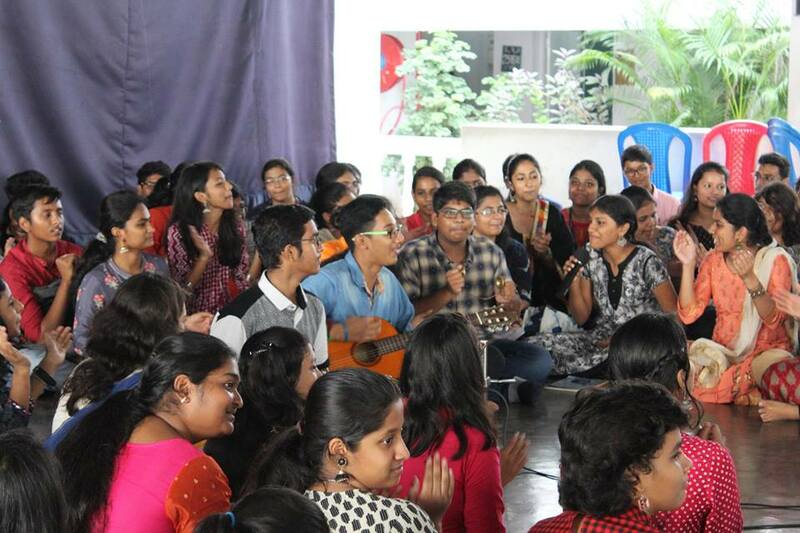 A wonderful exposure to spend time with the college students of SRM University who were doing their masters. 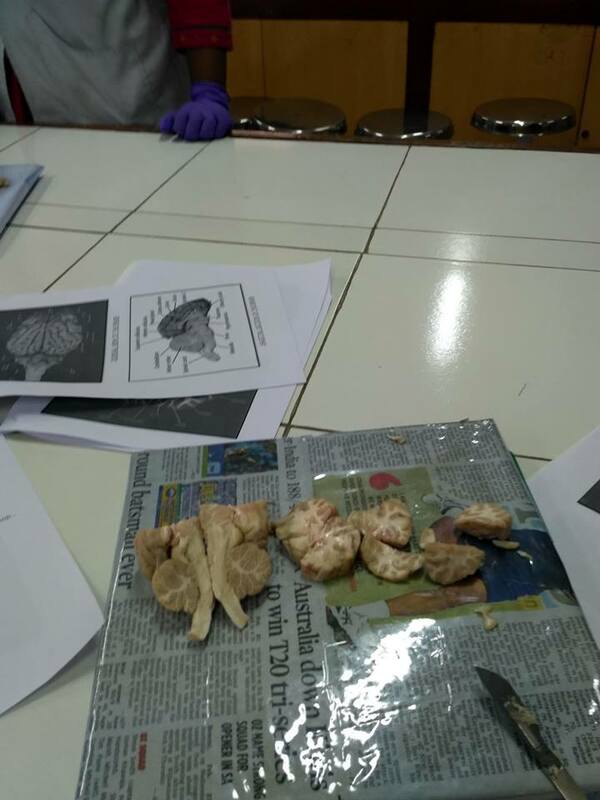 Their experience and knowledge were an eye opener. 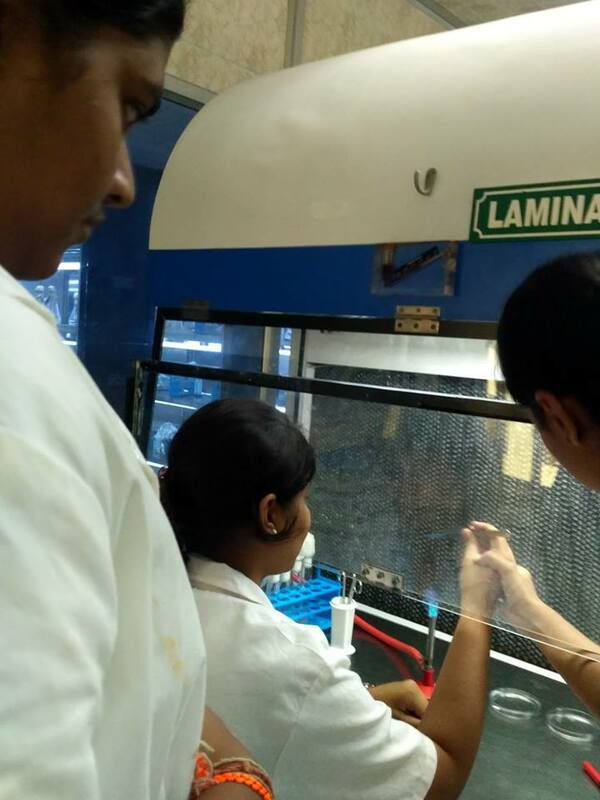 Besides their experiment, they spent time in other profound labs of the university and got to know the wide availability of fields in research. ‘SIMULATION’, a favourite concept was shown using super computers. 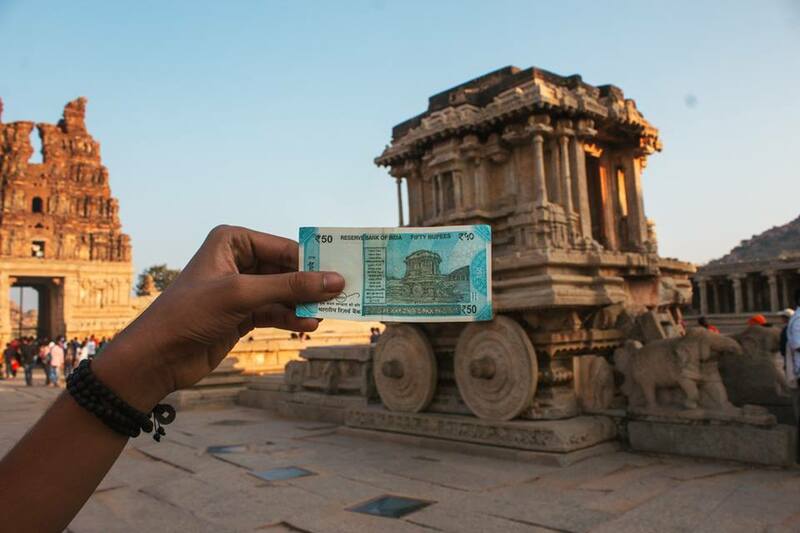 To celebrate the spirit of tourism and to motivate people to participate in activities show casting the tourism of Incredible India. Government of India has launched the campaign ‘Paryatan Parv’. 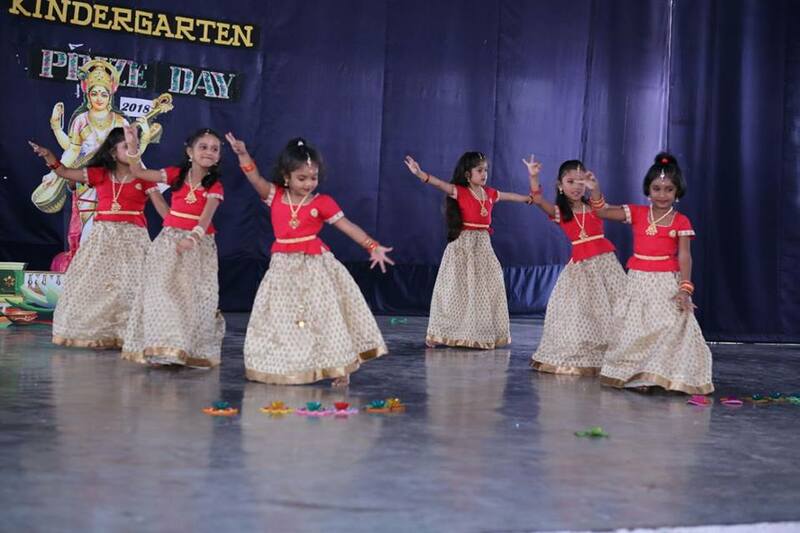 In view of the above our school has conducted various activities. 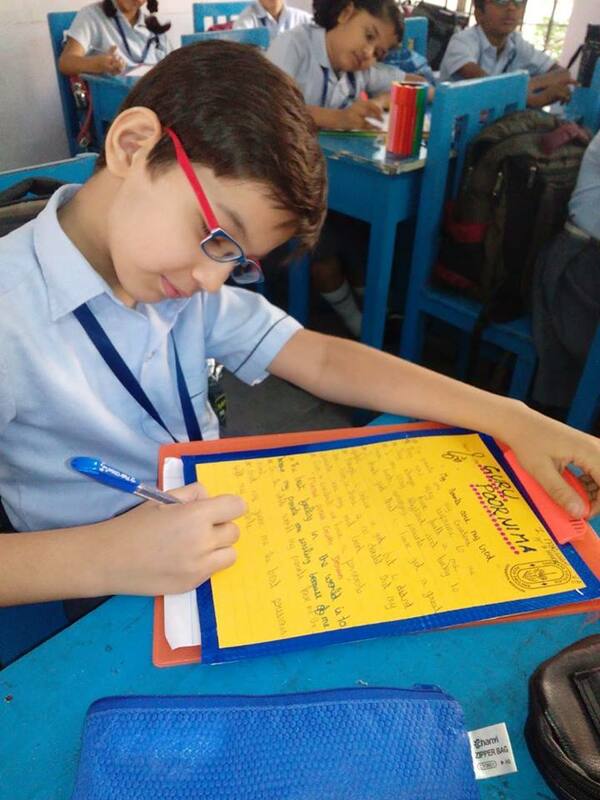 In our school Hindi divas was celebrated on 13th October 2017(Friday) Mr. Uday kumar Meghani. 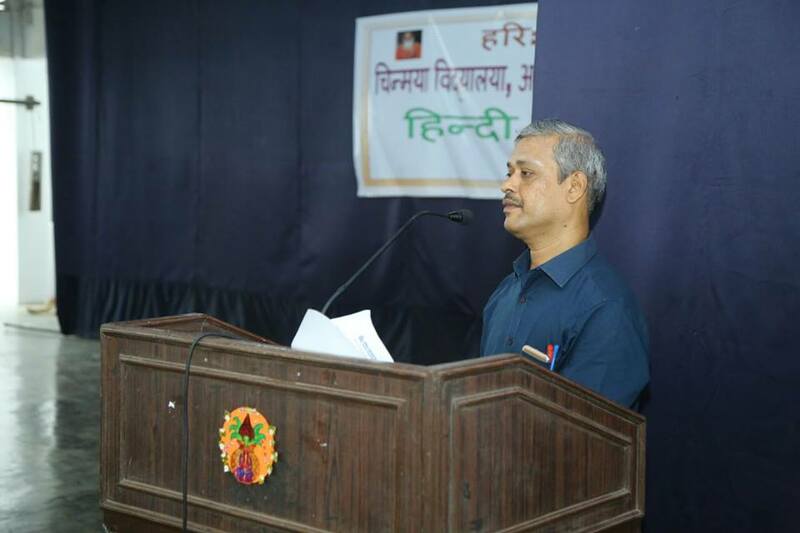 M.A (Journalism and mass communication) - Hindi Commentator in All India Radio was the Chief Guest for the programme. 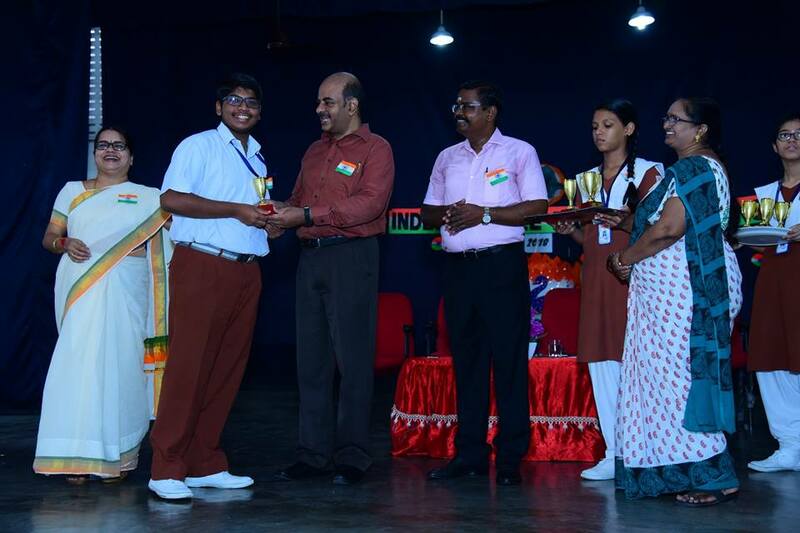 Various competitions were conducted for students of Std I to X and the prizes were distributed by the chief guest. 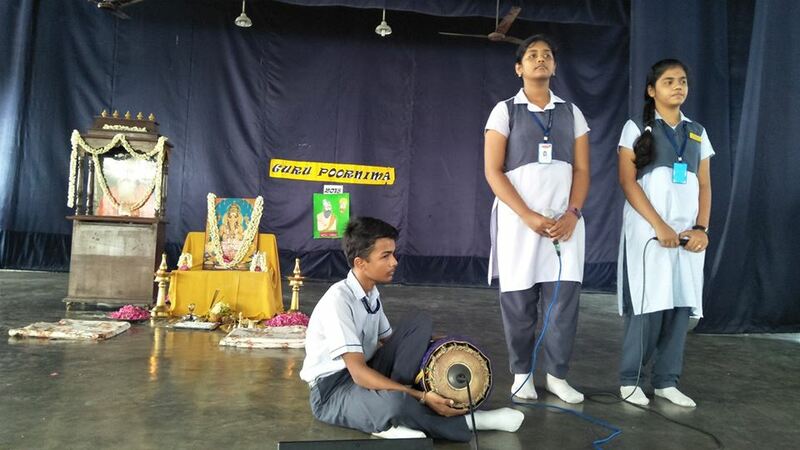 Two different group songs on patriotism were sung by the students of std VIII. 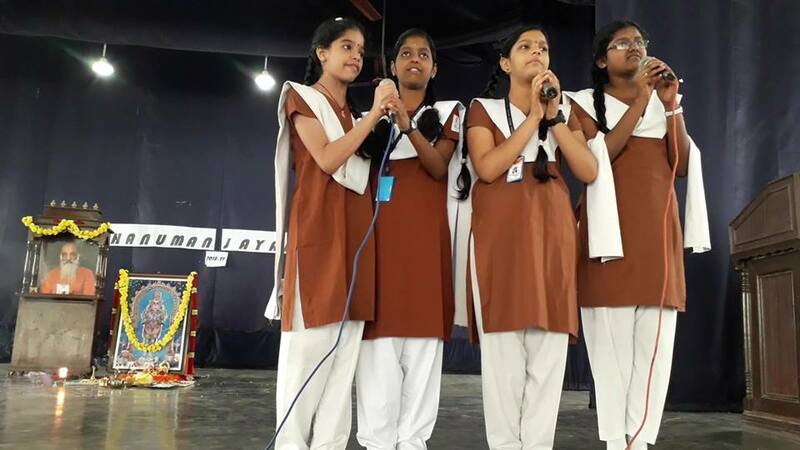 Beautiful Doha’s were recited by Shreyas Vishwanath of Std VII D. A skit was enacted by students of class IX Chief guest motivated the students through his inspiring speech. 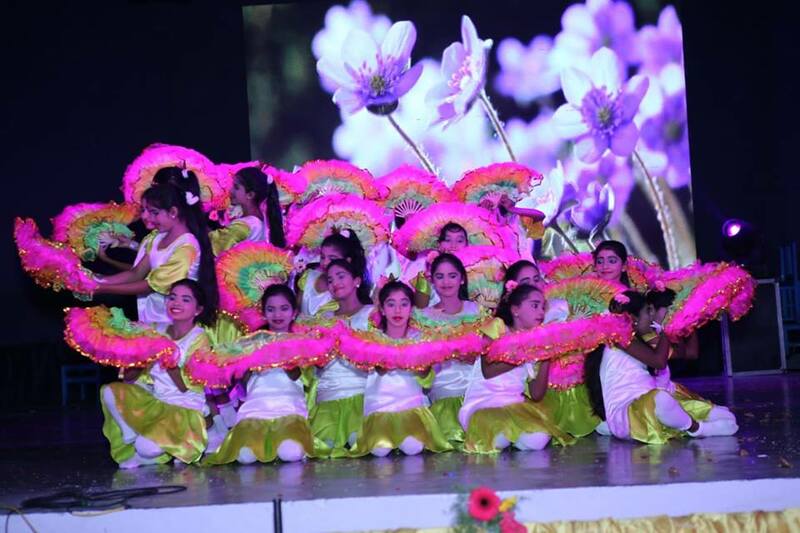 Congratulations to the entire Hindi department teachers and the students. 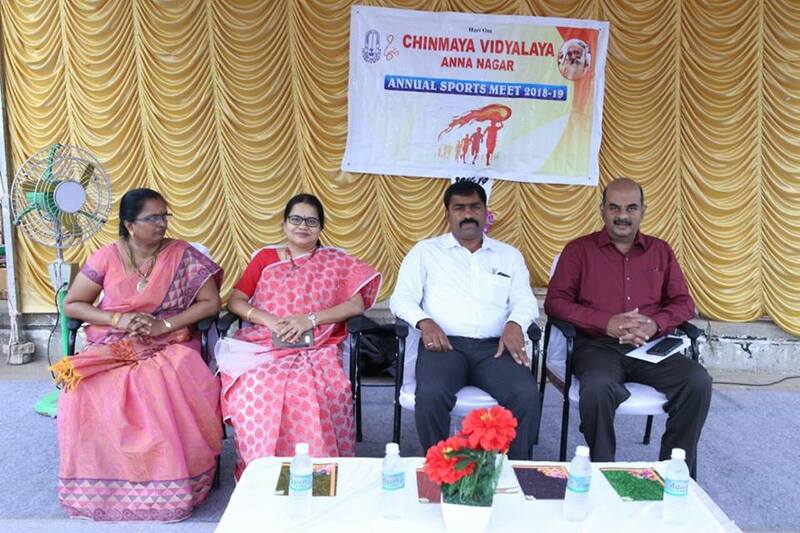 AT OUR VIDYALAYA CHIEF GUEST: SHRI. R.L. ARUN PRASAD I.R.S. 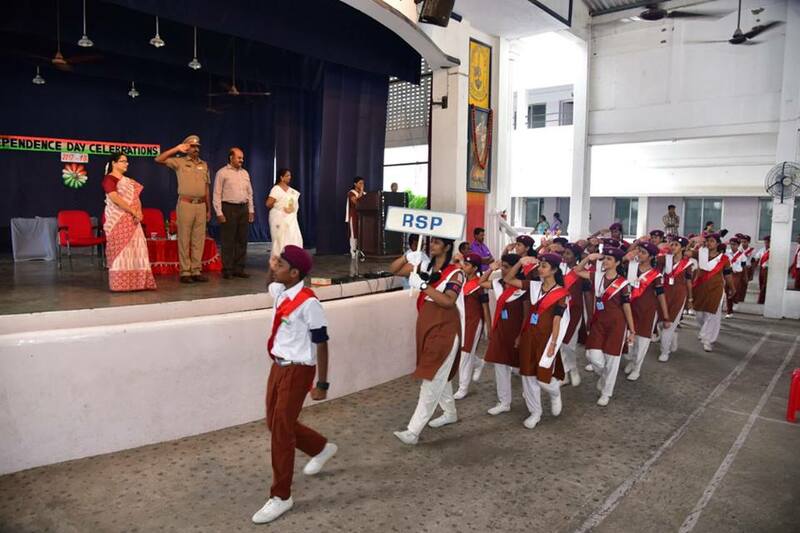 Deputy Commissioner of GST The programme commenced with flag hoisting and was then followed by a spectacular March past by NCC Troop, Scouts and Guides, RSP and all the four houses of the school. Students received Cent percent attendance prizes. 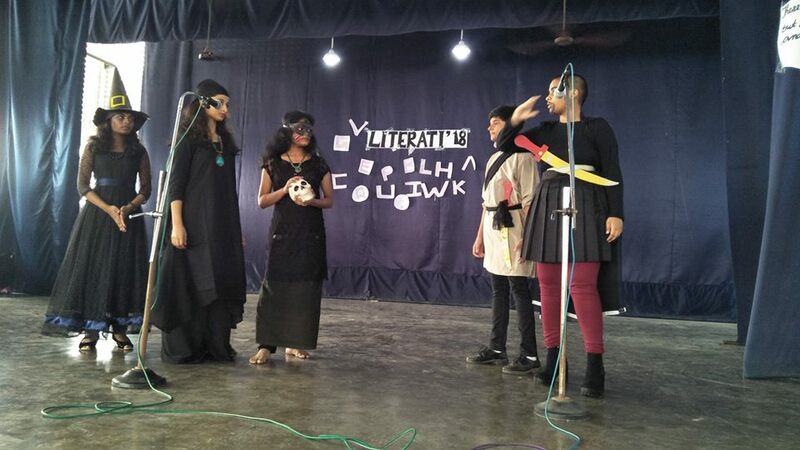 The skit performed by the students on the topic ‘VISION 2020’ was thought provoking and gripping for the audience. 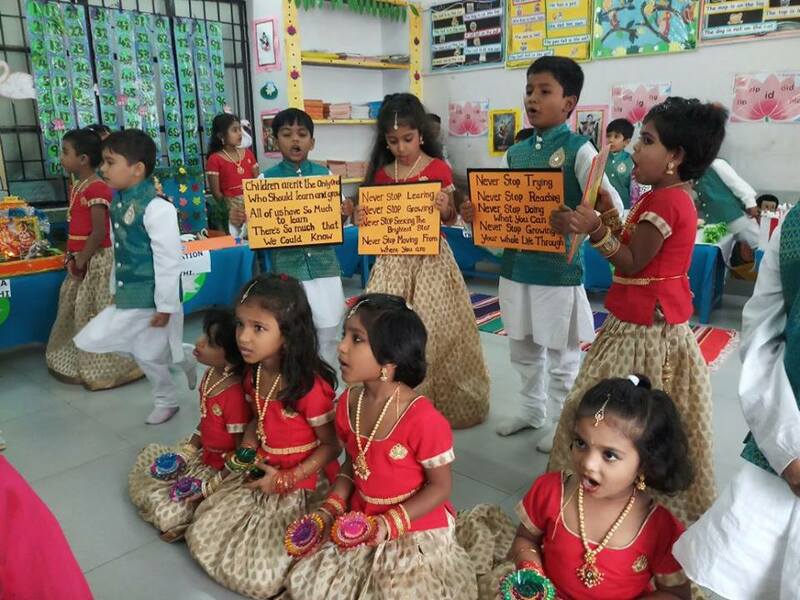 SwaminiSupriyanandaAmma( Acharya Chinmaya Mission, Hongkong) conducted GeetaGyanaYagna on Geeta Chapter 16 at our Vidyalaya from July 24th 2017 to July 28th 2017. 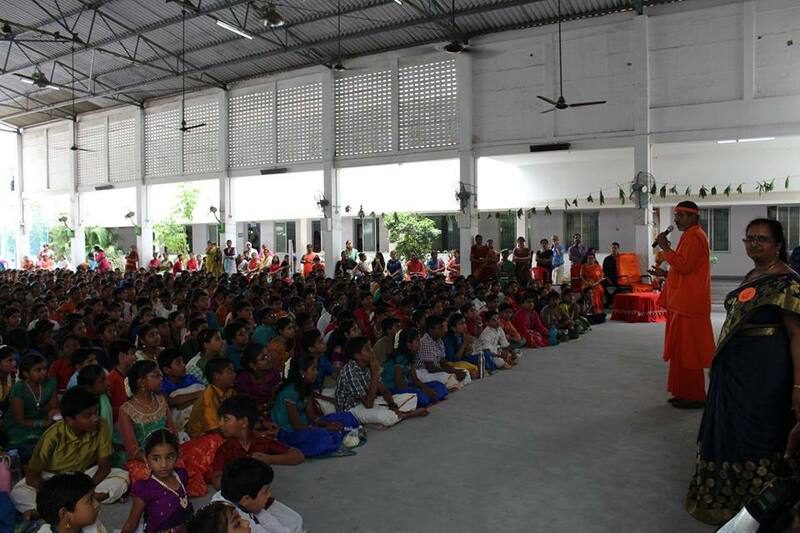 The devotees felt the mind was tamed and tuned towards god. 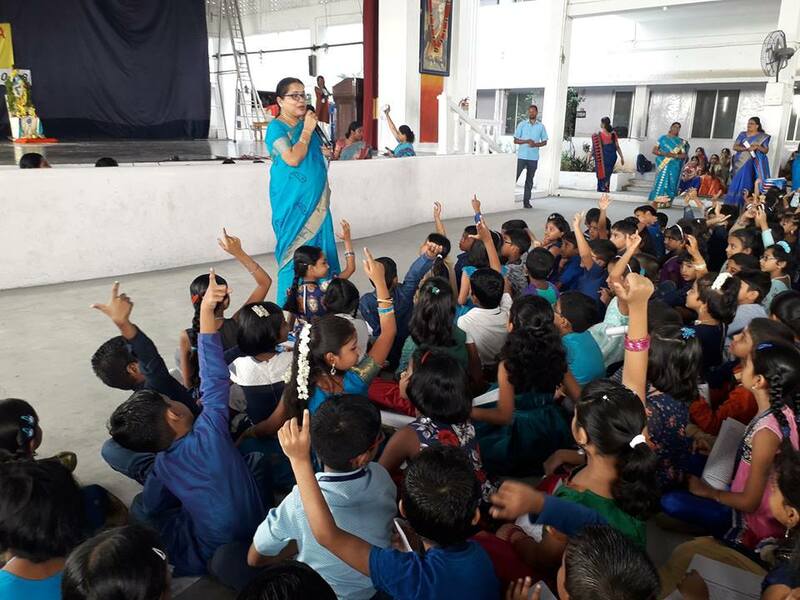 On 22nd July, a workshop was conducted by Swamini Amma Supriyanandaji on Sishu Vihar and an orientation program for Sevikas of Sishu Vihar. 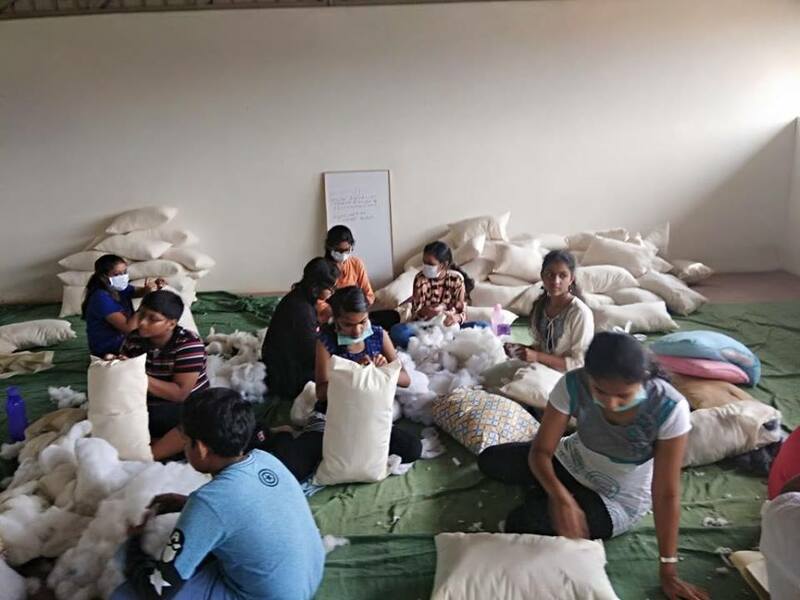 The program on Shishu Vihar started at 10:30am with a group of 15mothers and 15 kids at the age group of 1 ½ to 2 ½ years. 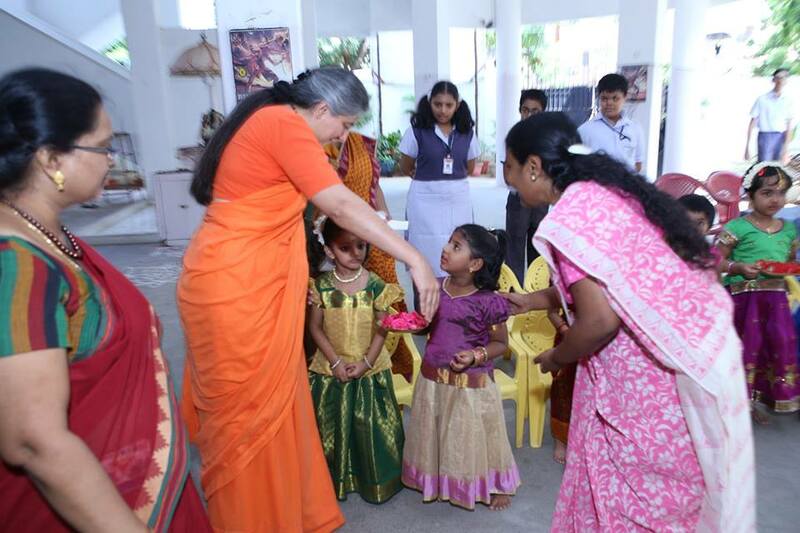 Amma explained the parents that academics can be learnt easily, but faith devotion and culture should be inculcated among the kids at a very young age.